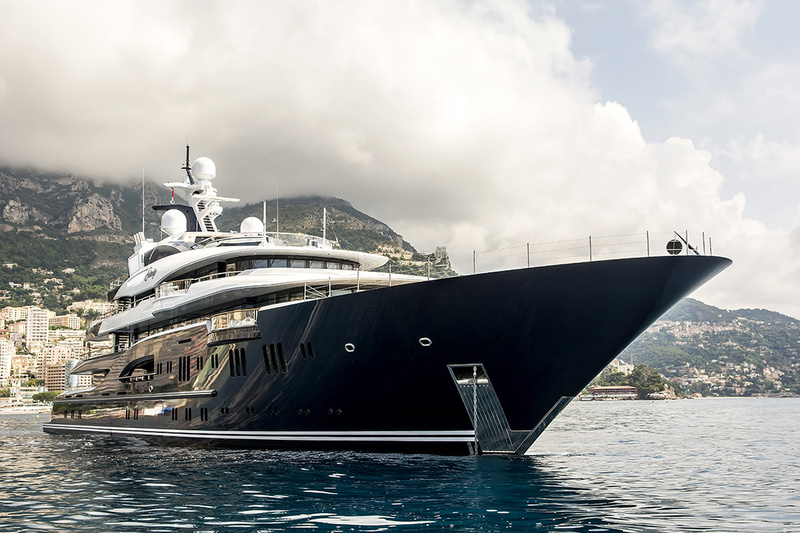 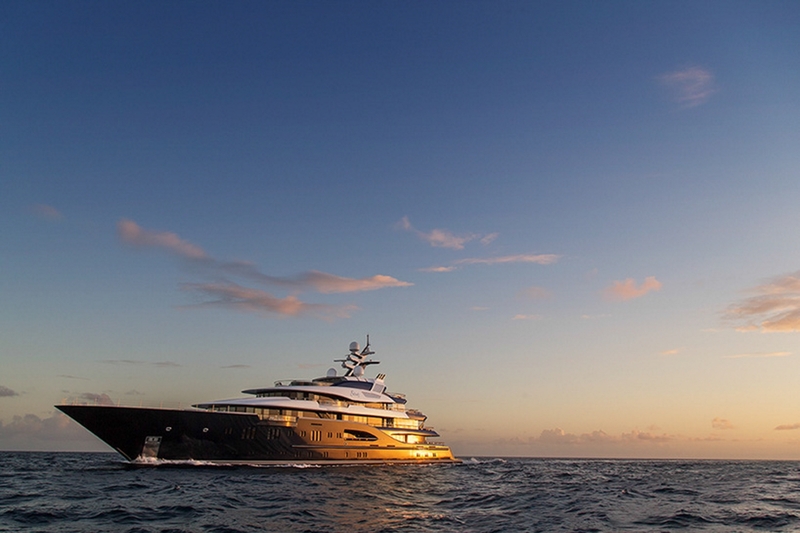 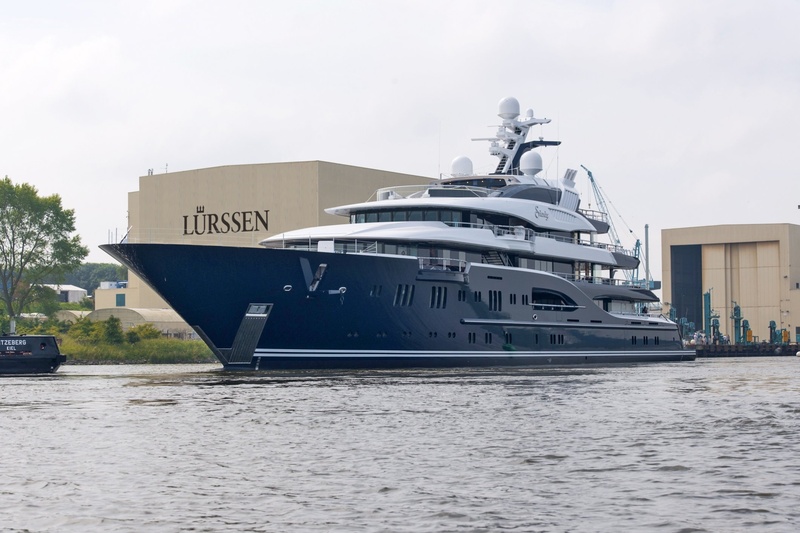 A graceful 5-deck Lurssen superyacht with timeless Espen Oeino design. 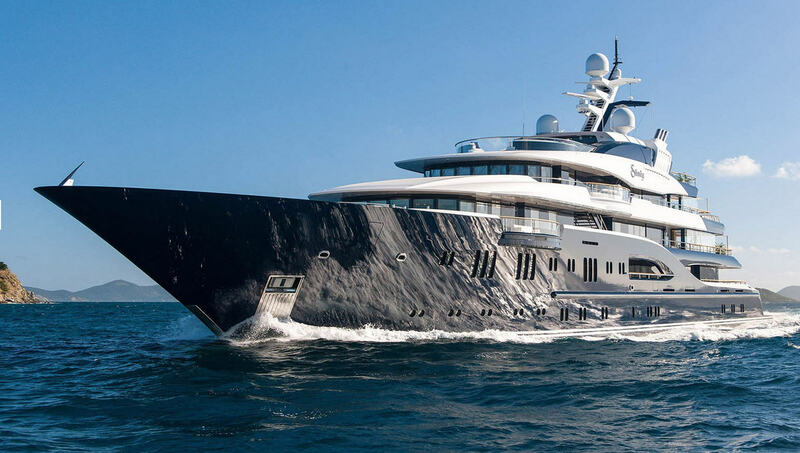 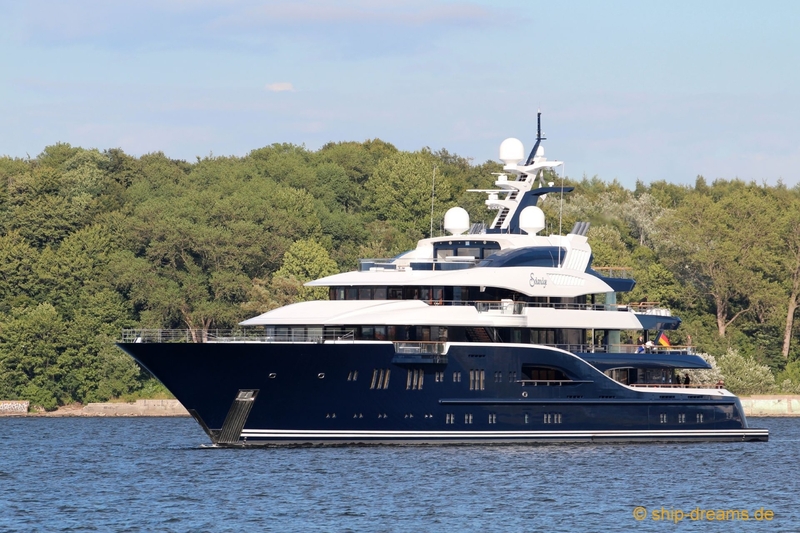 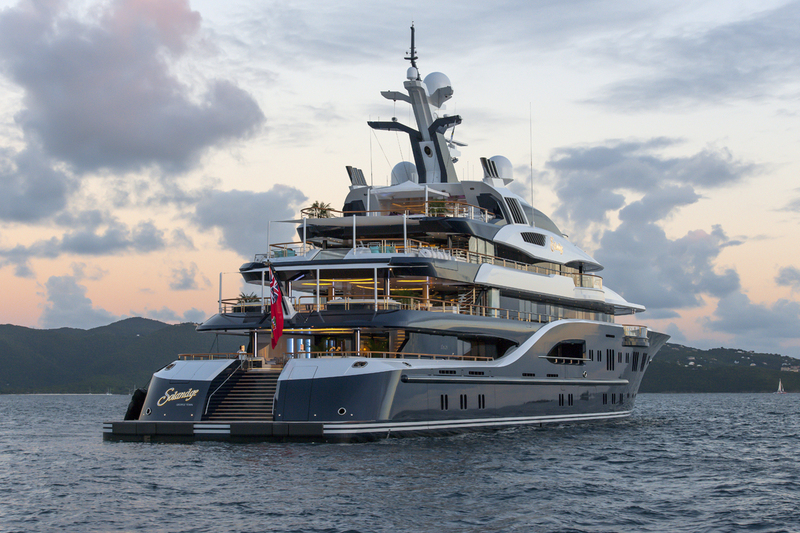 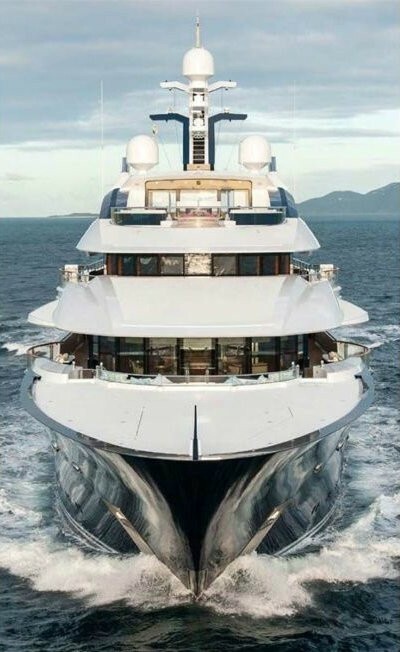 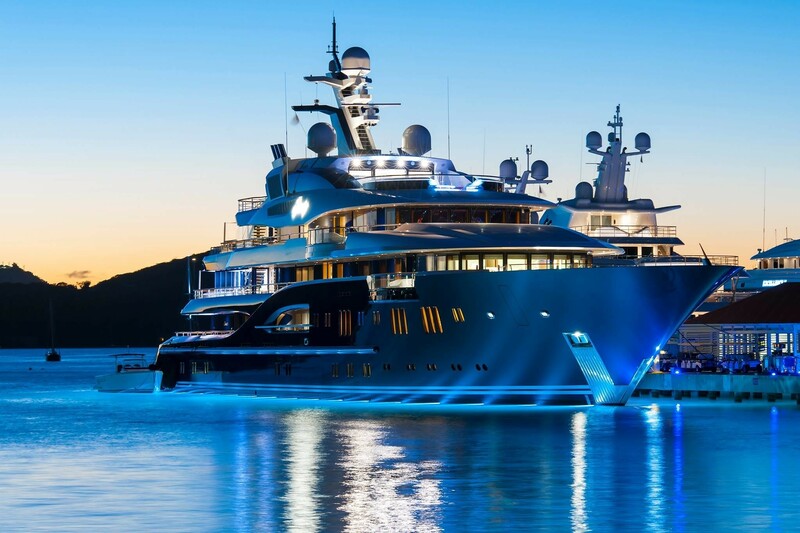 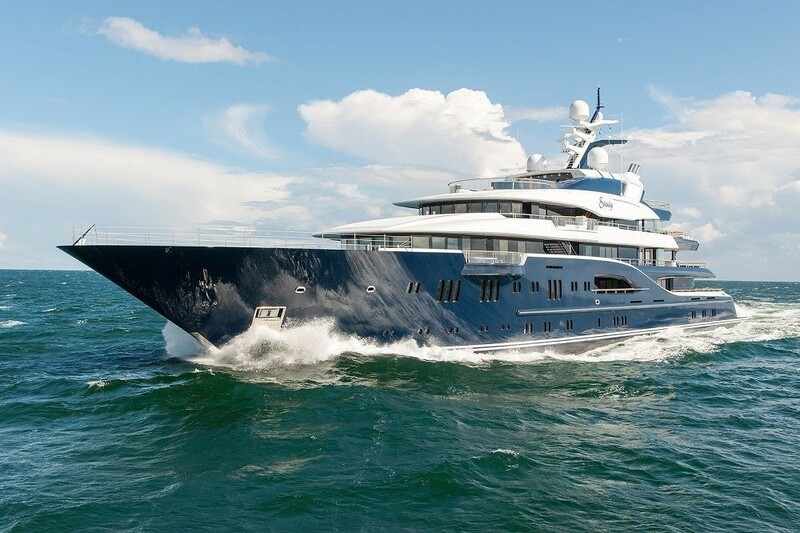 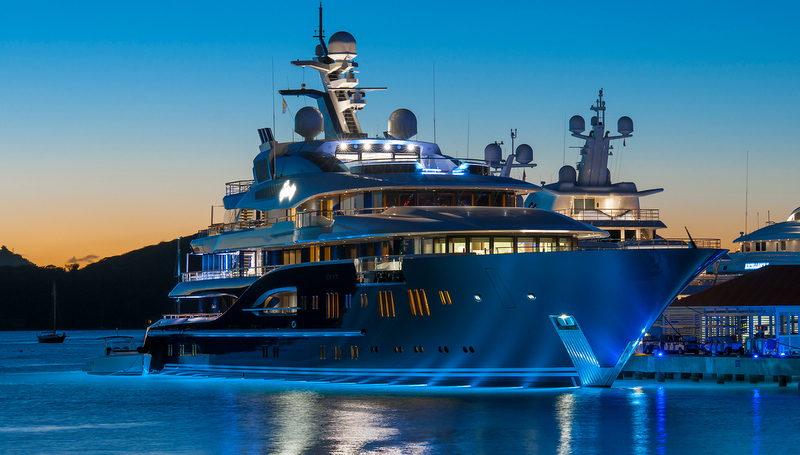 The magnificent 2013 five deck Lurssen yacht SOLANDGE (Project NIKI (NICKI) has a timeless Espen Oeino exterior superyacht design and interior design by Aileen Rodriguez. 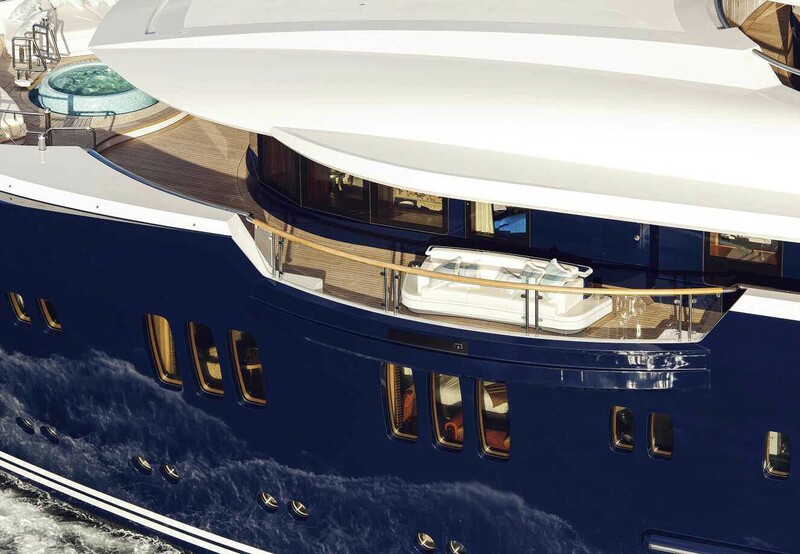 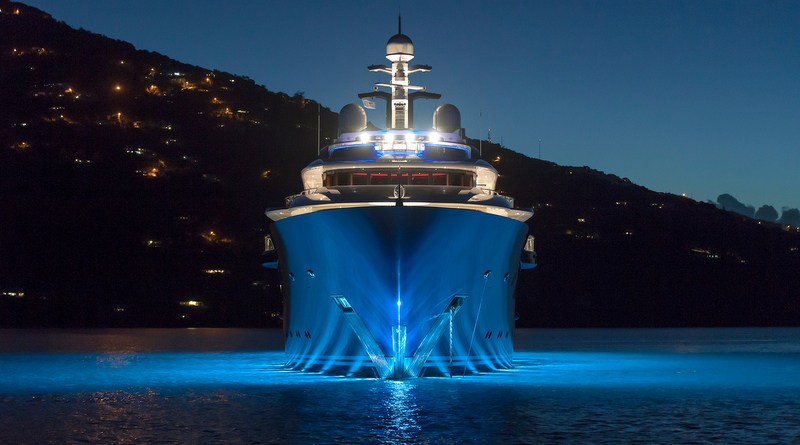 Along with her sister-ship, called ACE (ex project ROCKY), the famed German yacht builder Lurssen was responsible for building this impressive motor yacht. 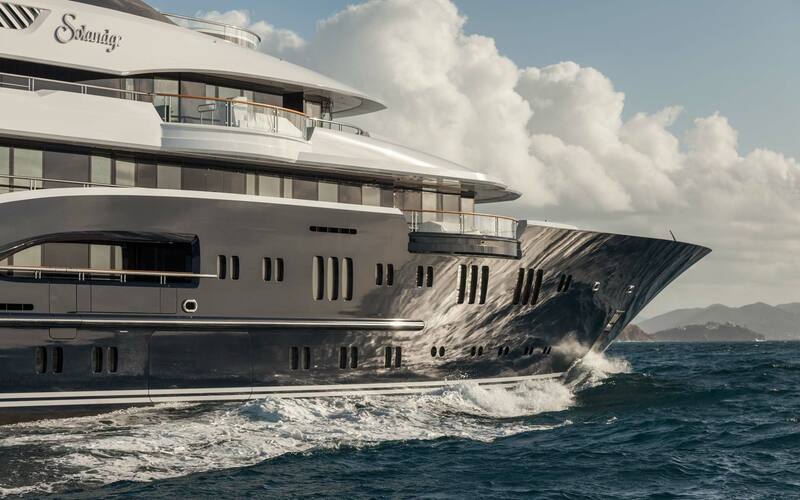 Her length is 85 metres and she has an Espen Oeino exterior design which is characterised by sweeping forms, curves and lines. 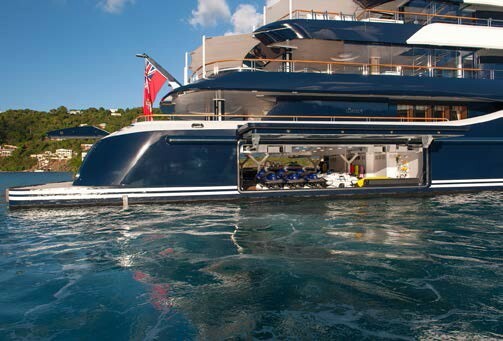 She has a steel hull and an aluminium superstructure, as is usual for most boats of this size and type. 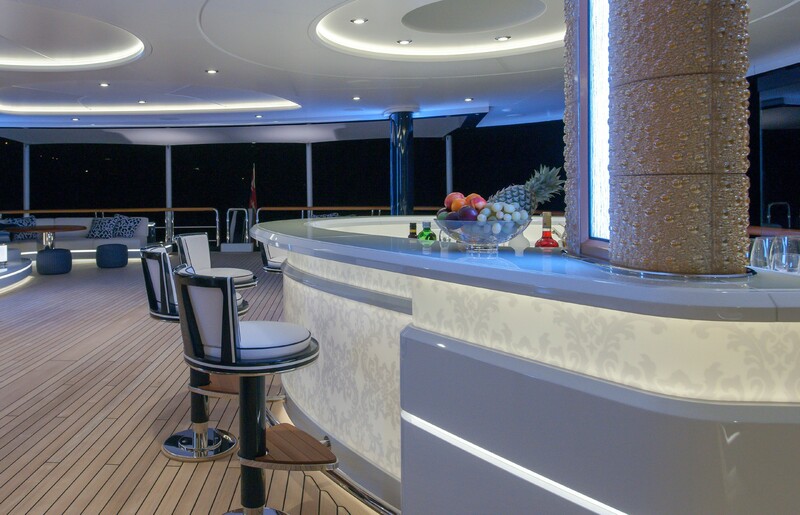 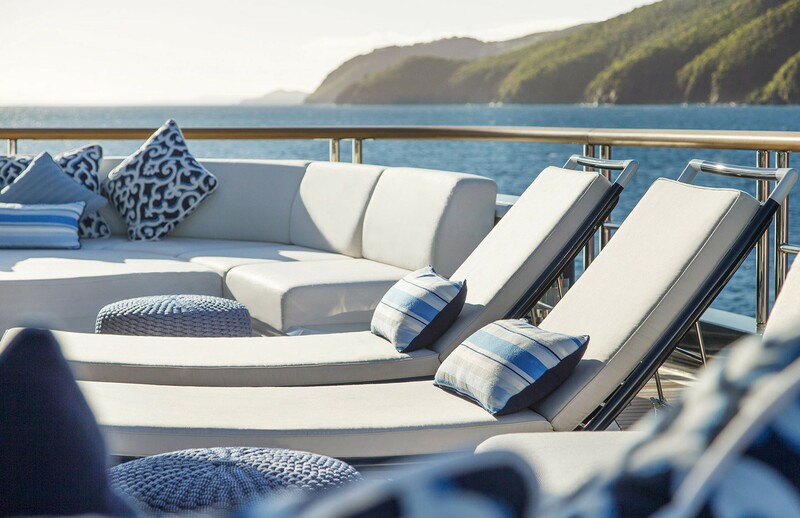 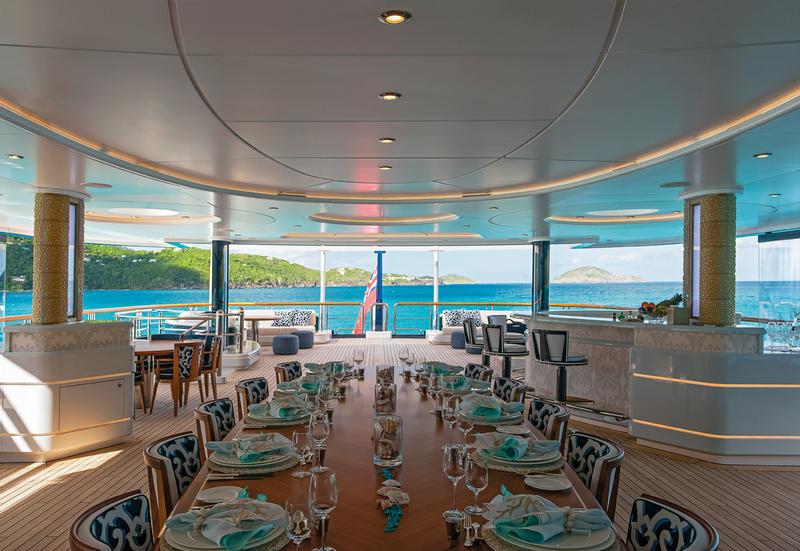 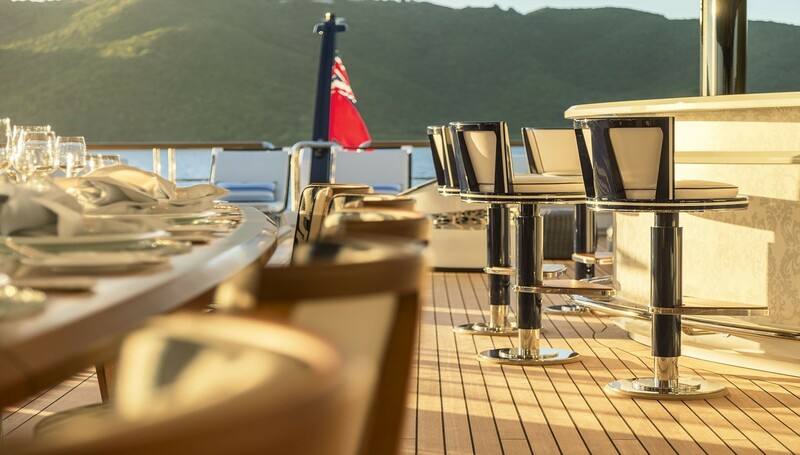 Her magnificent interior includes communal entertainment spaces and expansive exterior areas, offering accommodation for up to twelve charter guests in eight suites. 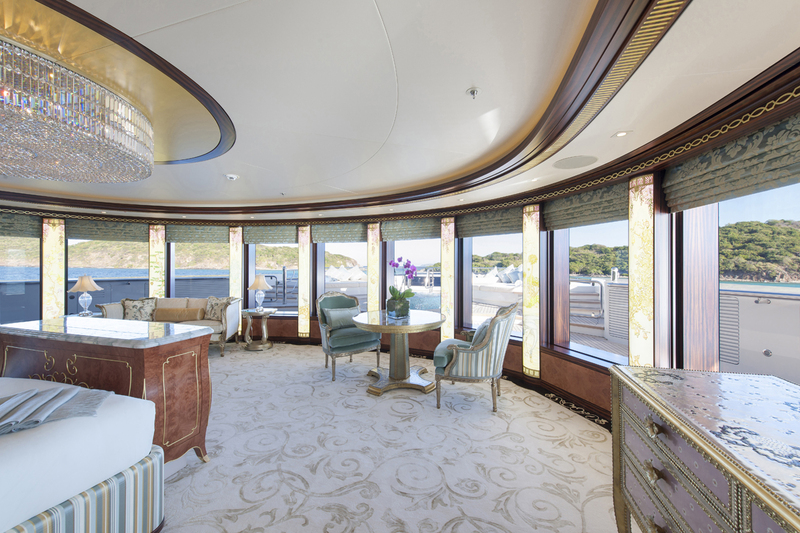 SOLANDGE has undergone a major refit in 2019. 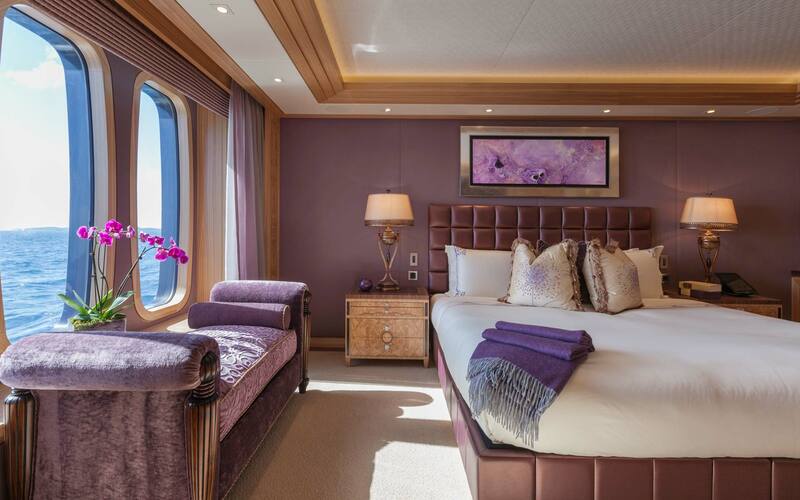 Stepping aboard one is greeted by the very elegant main saloon, boasting two magnificent walls of back-lit amethyst, which is the first thing to notice and feel. 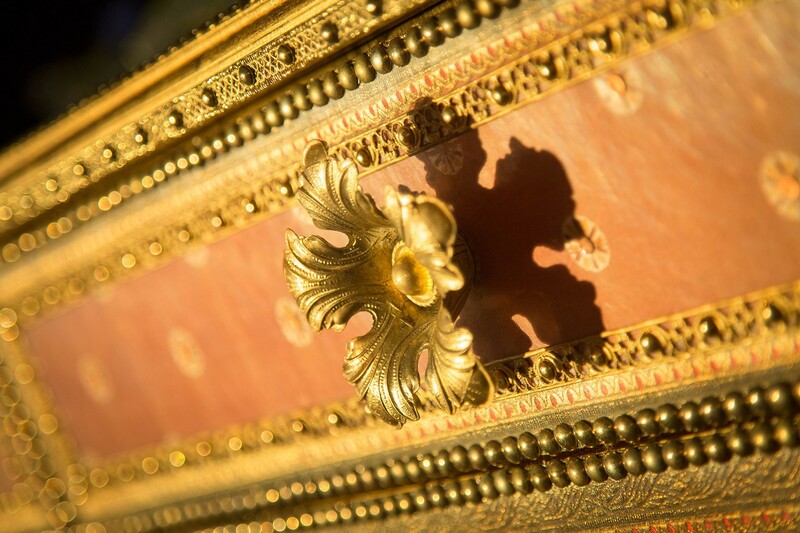 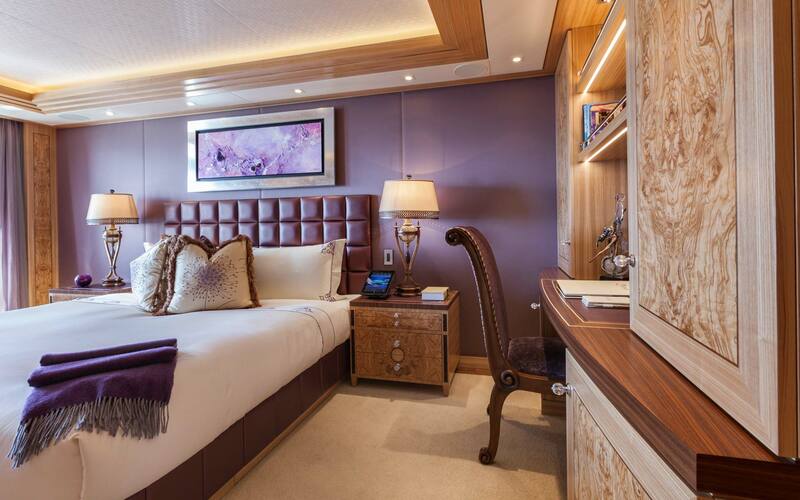 There is a Bechstein piano on the port side and a beautiful Venetian console and mirror on the starboard side. 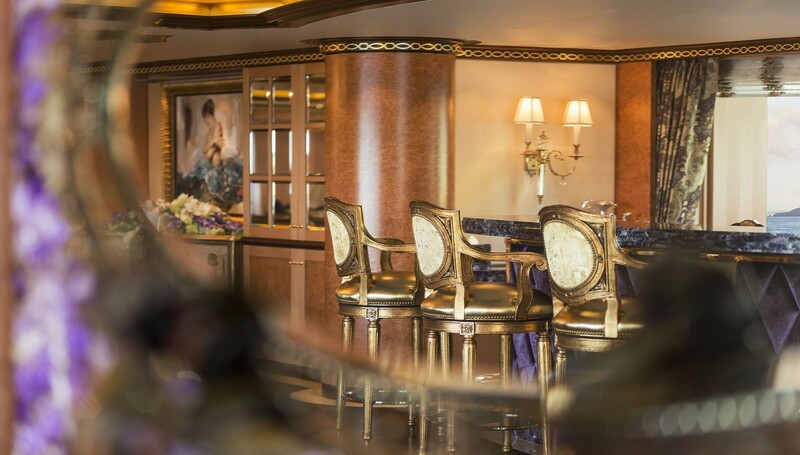 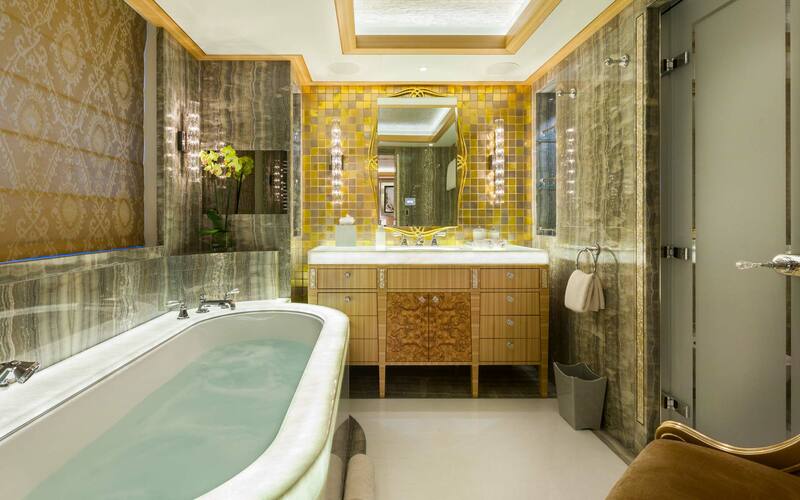 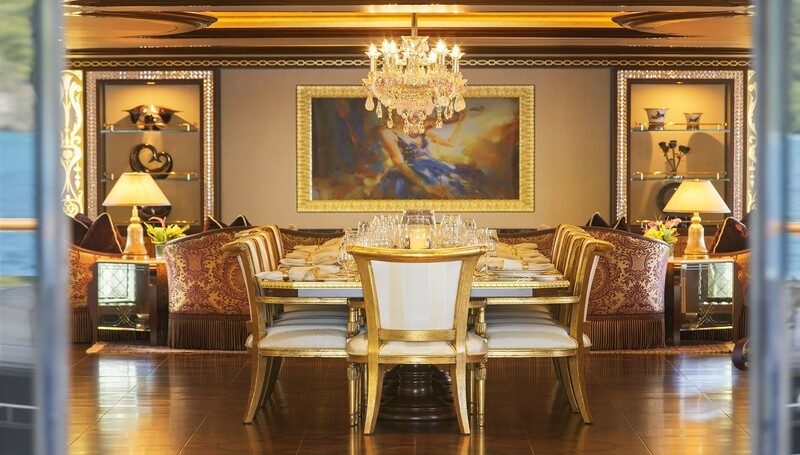 The interior exudes elegance, luxury and opulence, as you walk through the beautiful wooden floors with borders of honey onyx stone and gold leaf ceilings with Schonbek chandeliers dripping with amethyst rose quartz crystals. 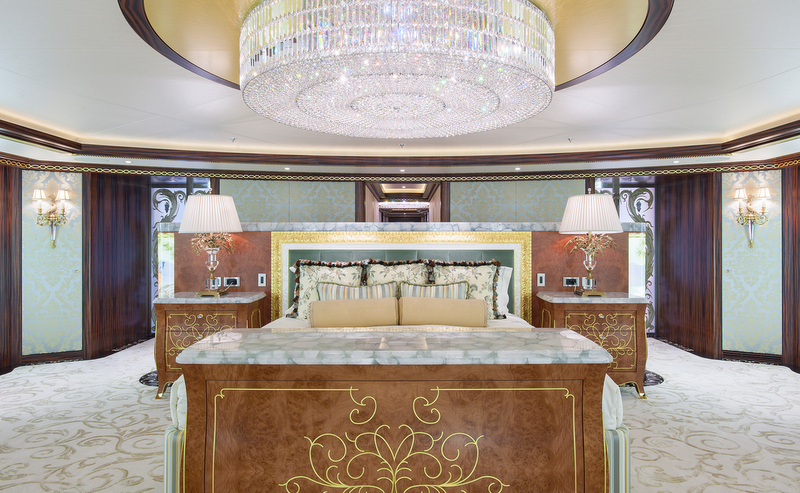 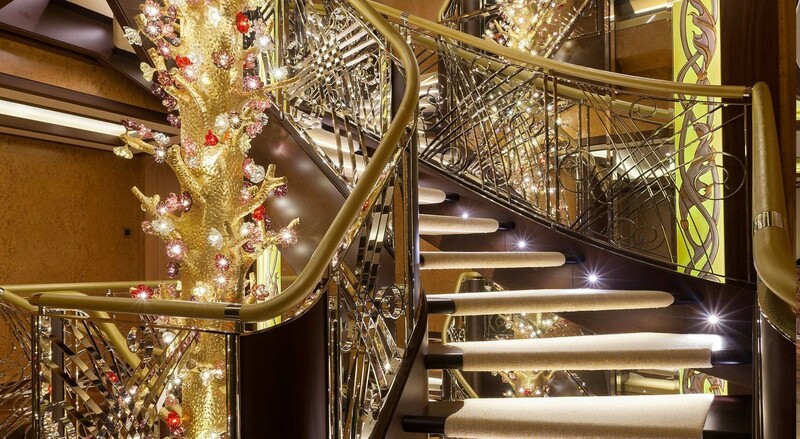 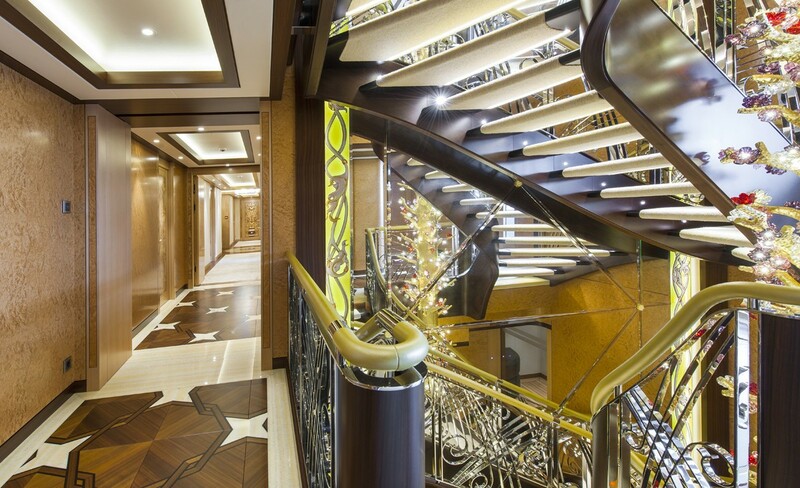 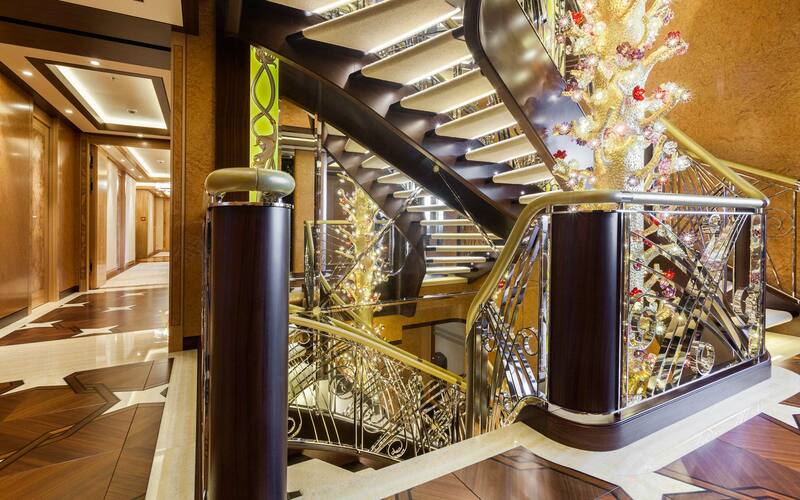 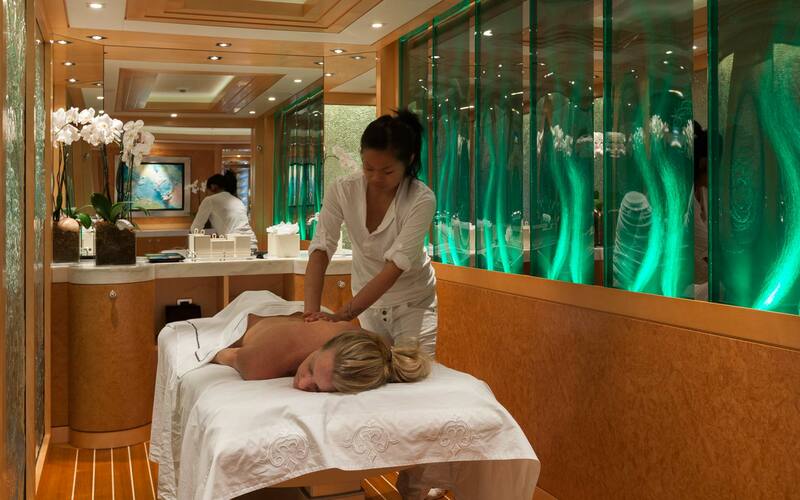 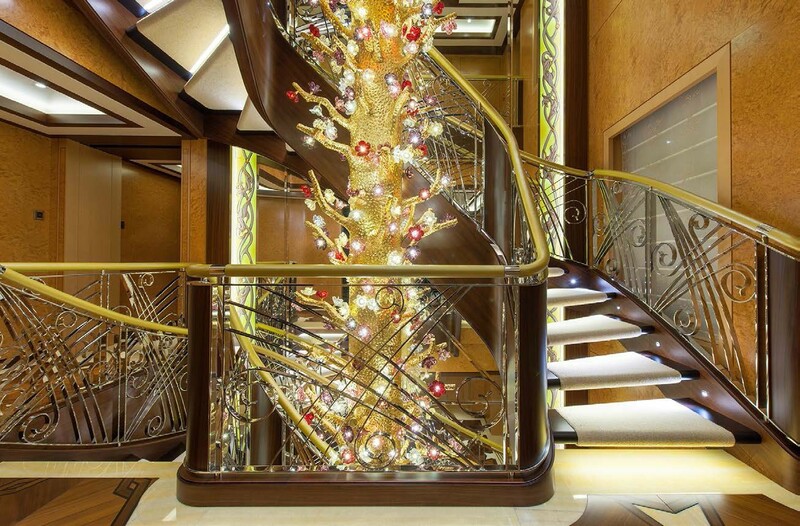 From the main saloon, continuing through to the main lobby, guest will find the main feature aboard this magnificent yacht: The Tree of Life. 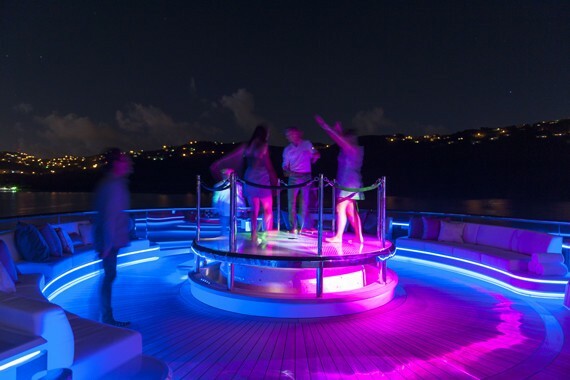 This is represented by a lighted sculpture which is 50’ high and has more than 1200 points of light. 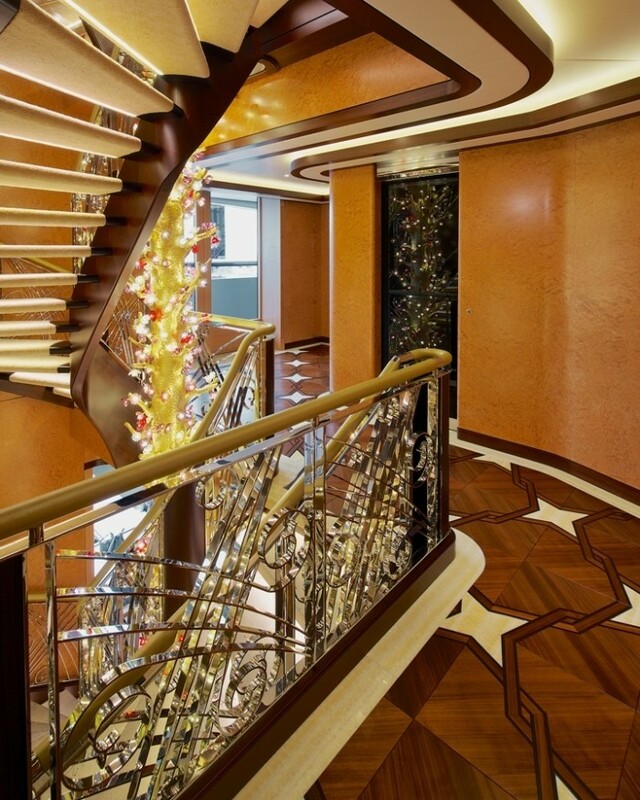 This impressive sculpture was designed to fulfil the wishes of the owner, who always had envisioned something running the entire height of the vessel from the tank deck to the bridge deck. 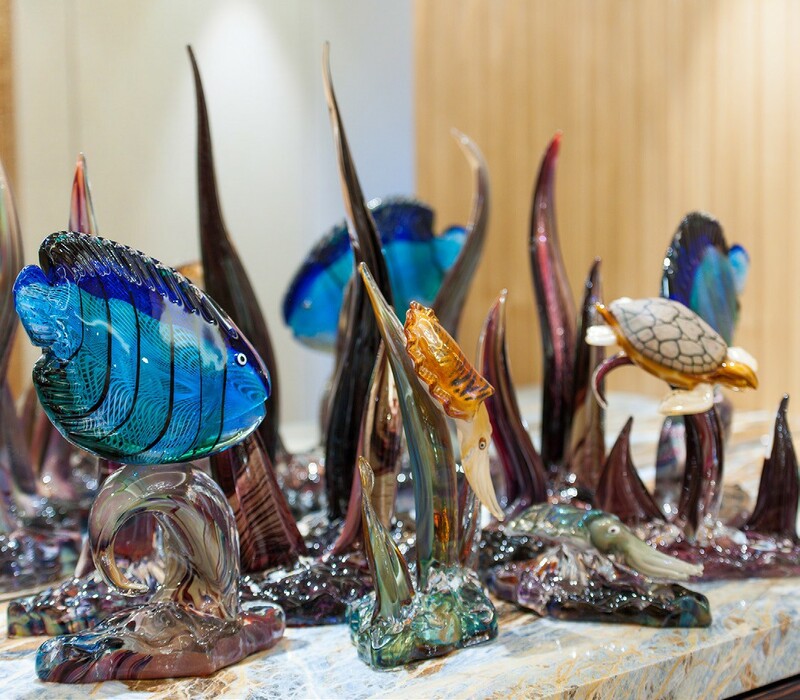 Following many design trials with Rodriguez Interiors, they have decided on this stunning art glass sculpture. 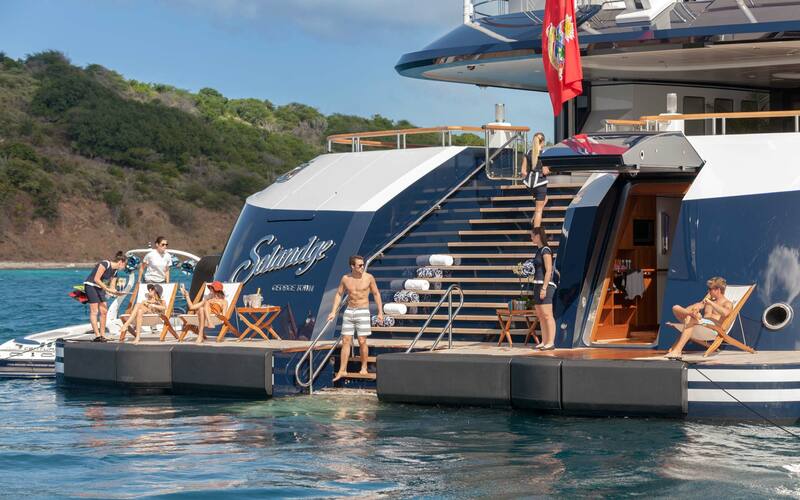 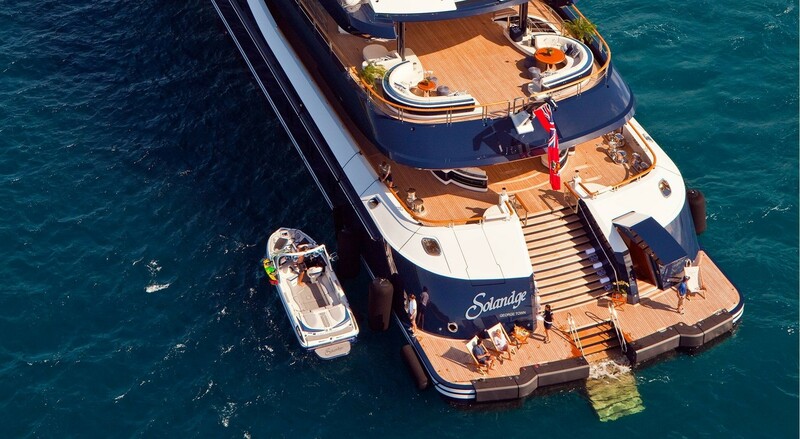 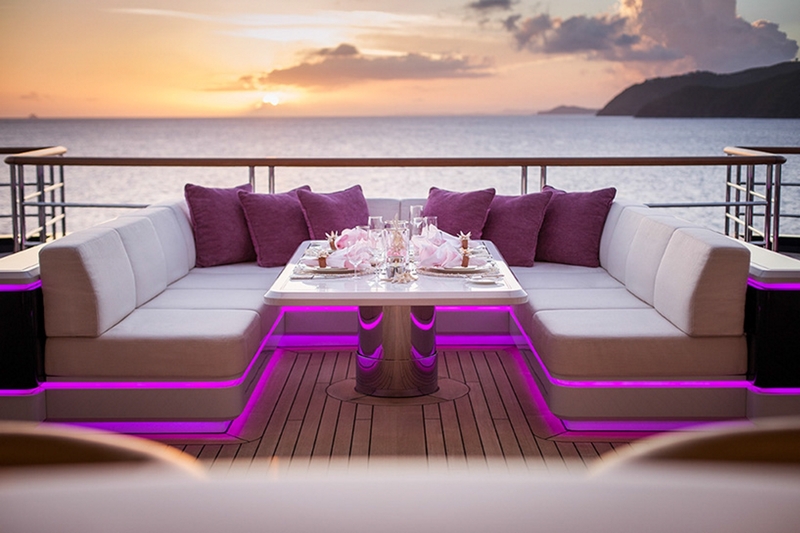 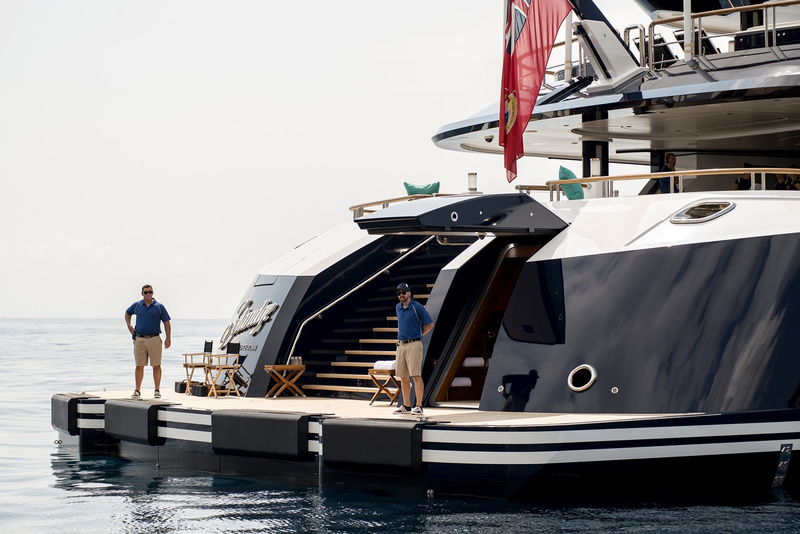 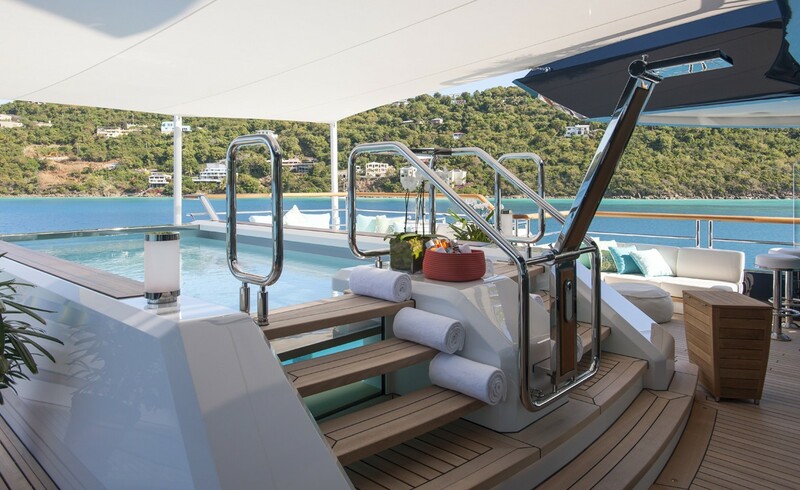 Walking up the superyacht from deck to deck, the spaces become more casual, reaching the Sun Deck where the designers have created a beach club feeling in ’Nikki Beach’ style. 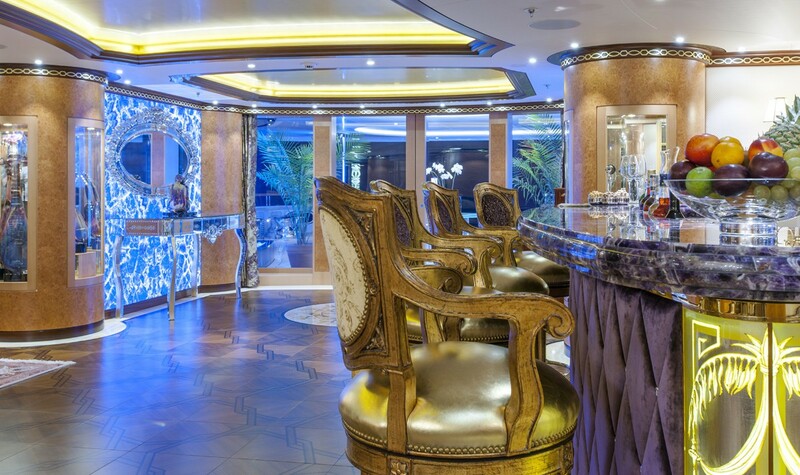 This area includes a bar clad in gold and white Bisazza tiles surrounded by 14 bar stools covered in gold leather flanked by two TVs. 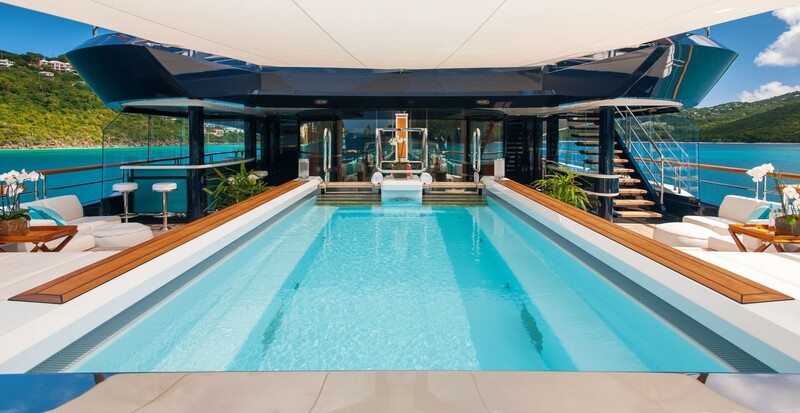 There is also a Spa Pool with a clear dance floor that lays on top for parties that can be hosted by anyone using the DJ console and booth. 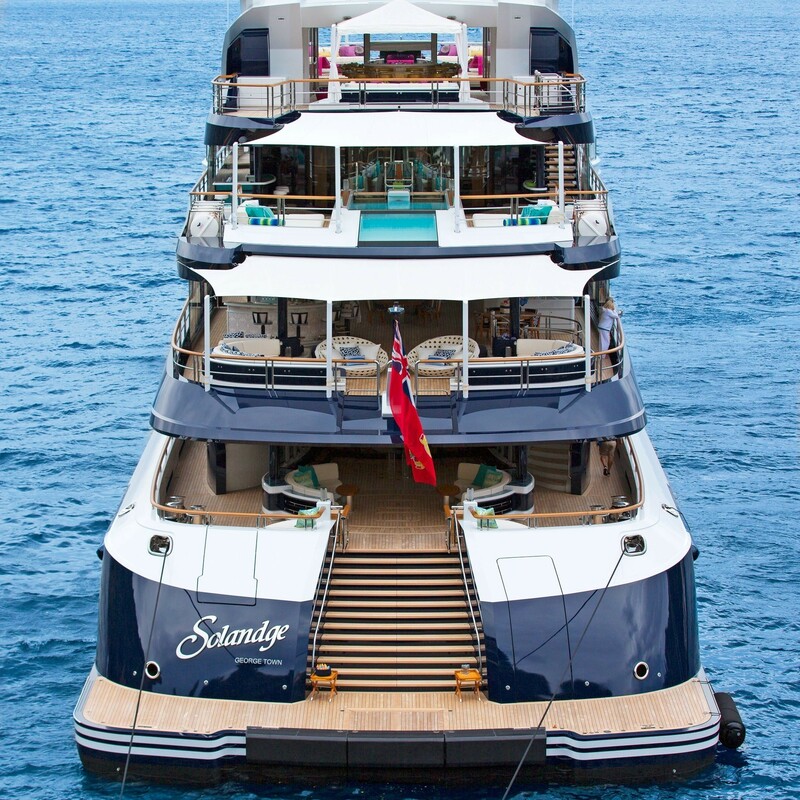 The Owner wished for every inch of SOLANDGE to feel special and have a meaning. 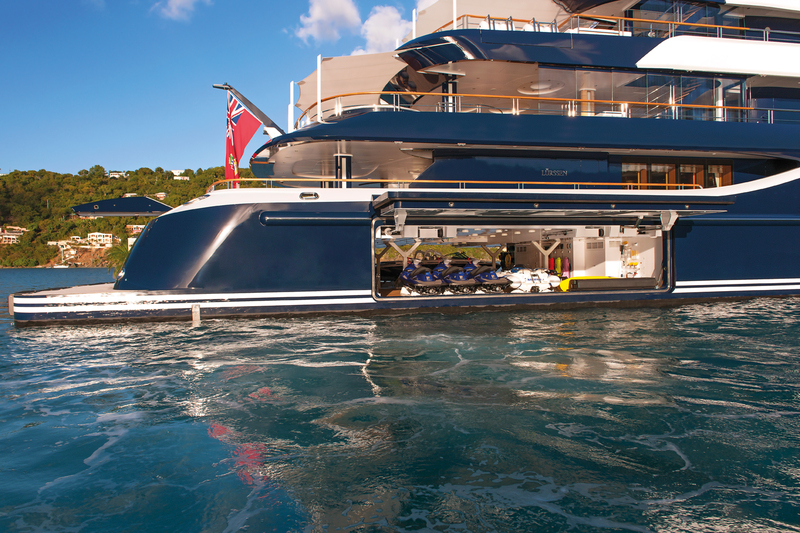 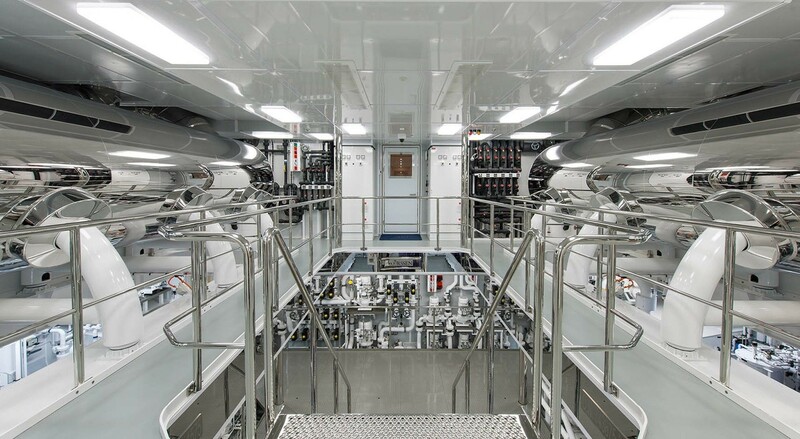 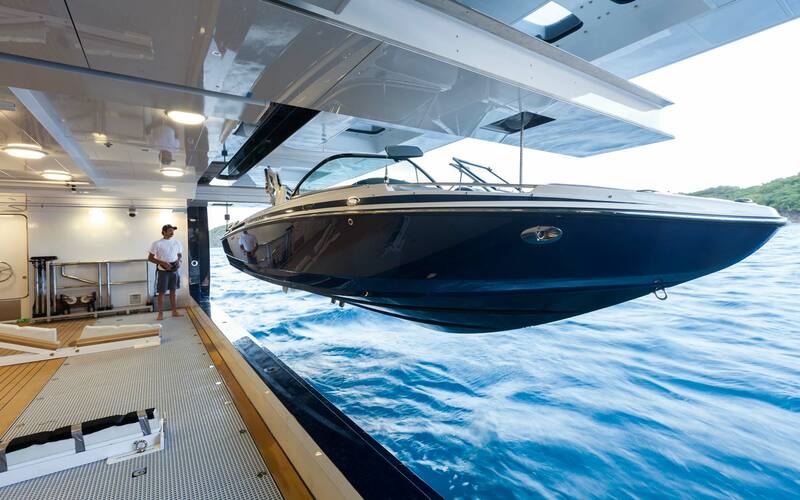 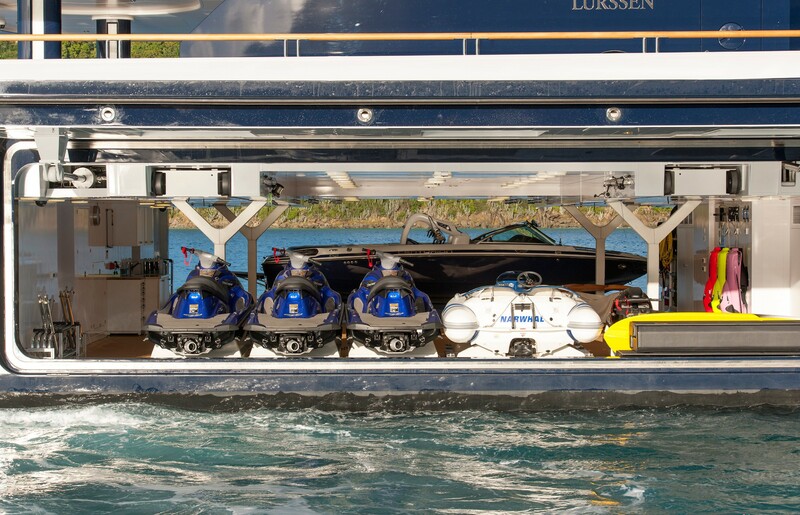 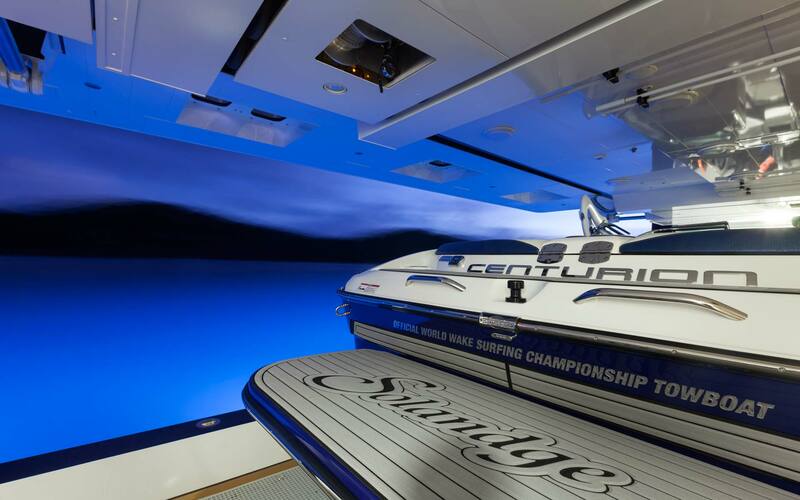 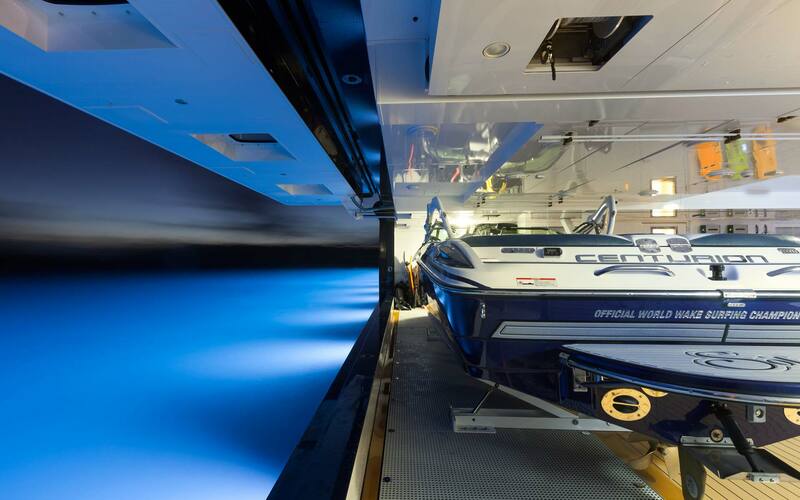 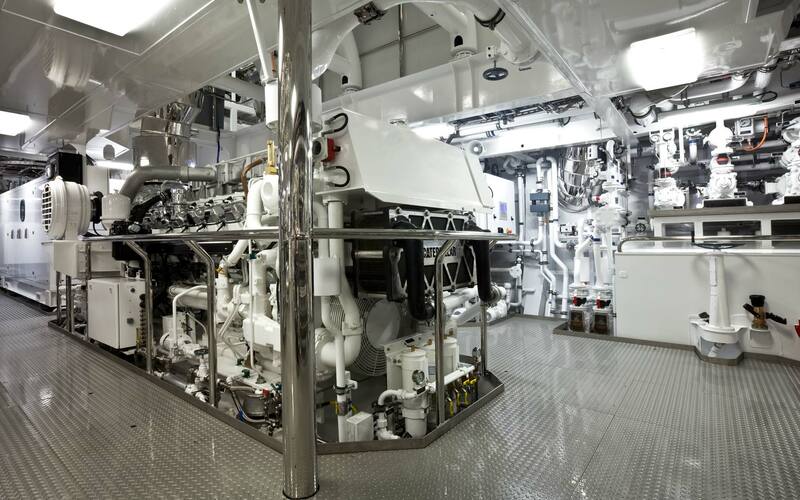 The tender garage with very large doors is located to aft on her lower deck. 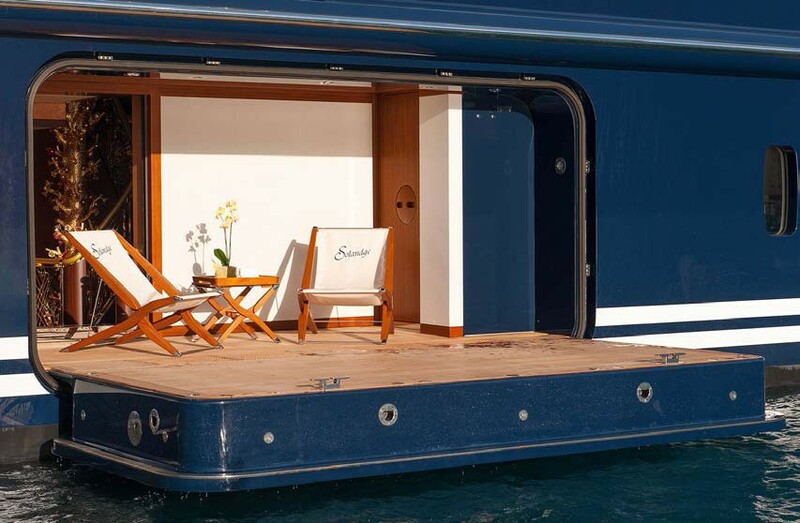 She also has another doorway which could be used as a tender docking area in her hull and also as a beach swim platform. 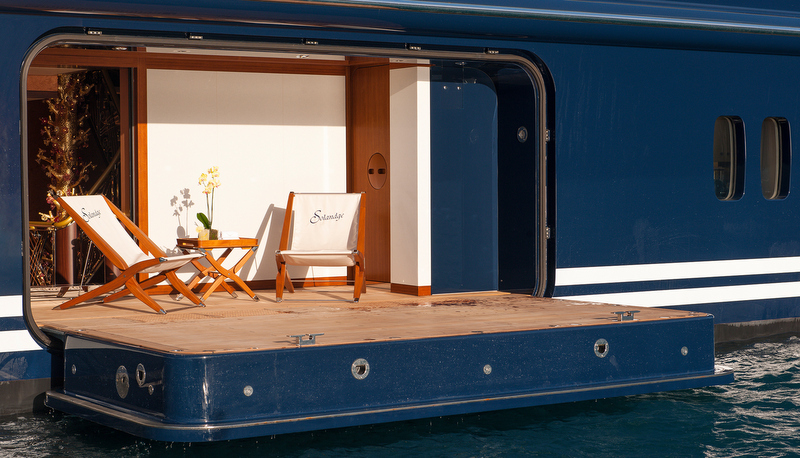 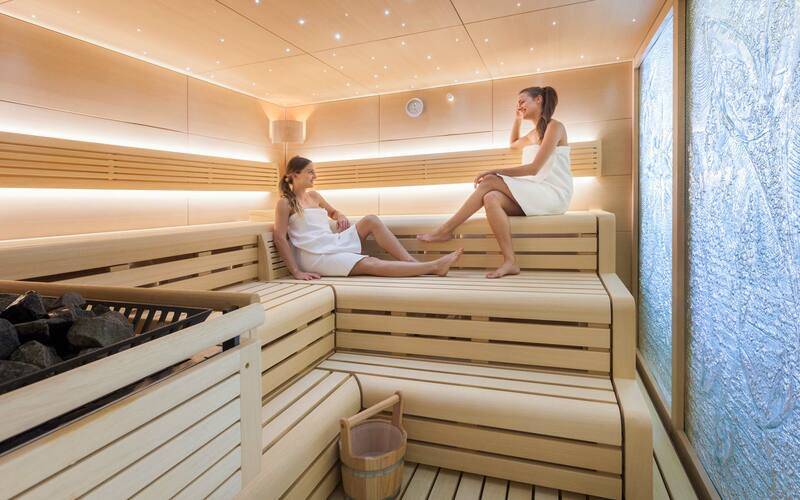 SOLANDGE was designed to offer many places for her guests to socialise or relax in privacy. 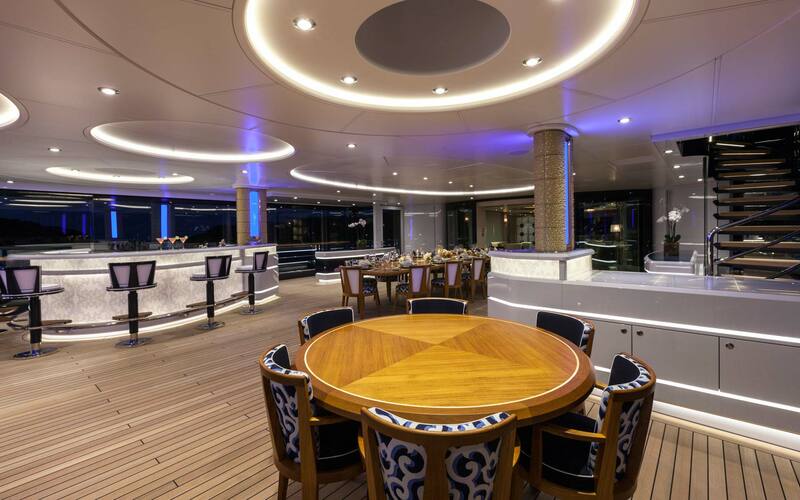 Each deck has its own distinctive function with all the necessary furniture and amenities, such as built-in bars, buffets, dining areas, a pool and two hot tubs. 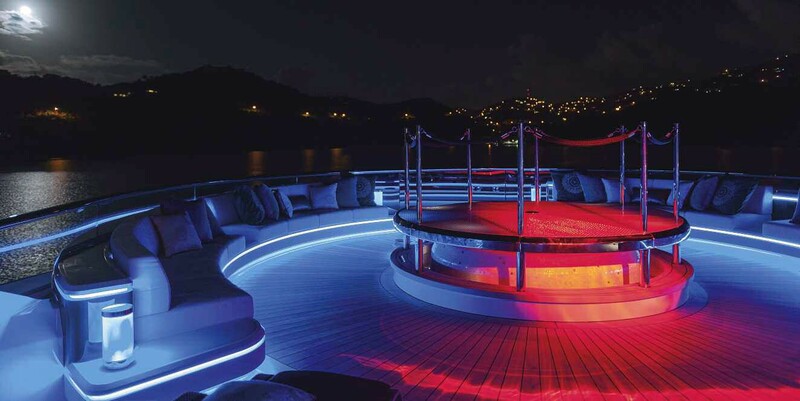 There are a fantastic exterior cinema and a nightclub with a DJ station on the top deck. 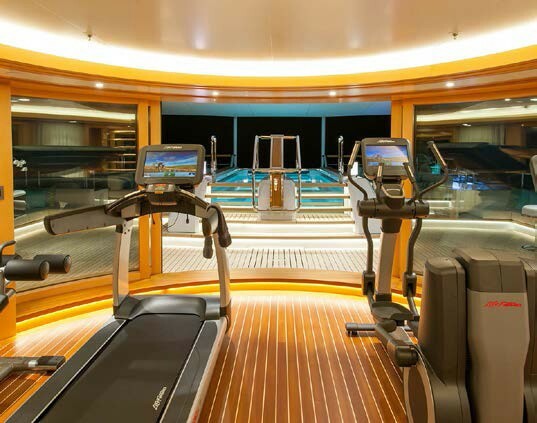 There is also an indoor/outdoor gymnasium, a covered main-deck reception area aft and a private outdoor seating area in front of the owner’s suite. 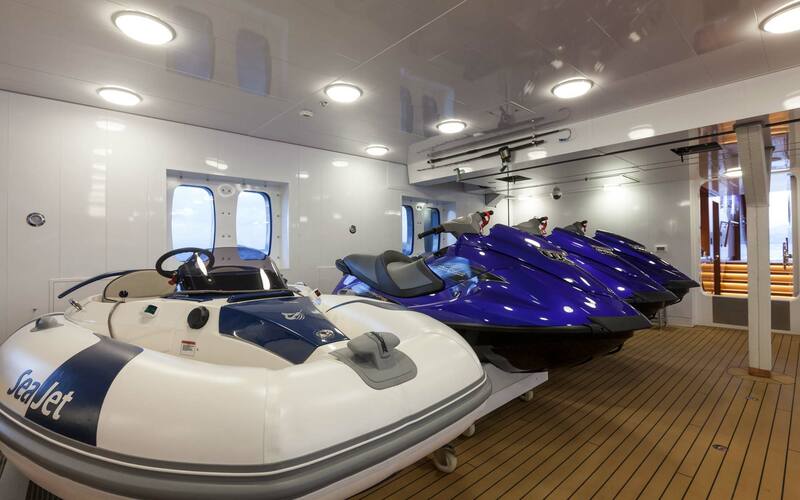 SOLANDGE also has a large yacht tender garage, a full dive centre and a sauna, which is located aft with an access to the beach platform. 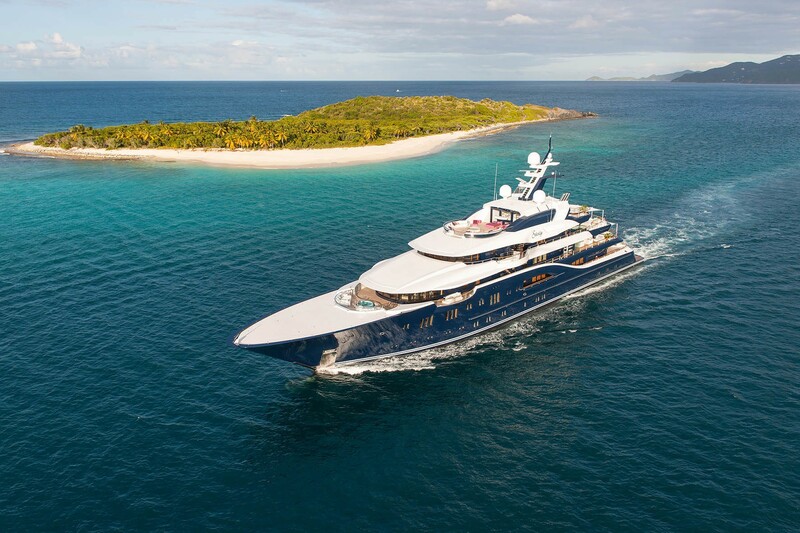 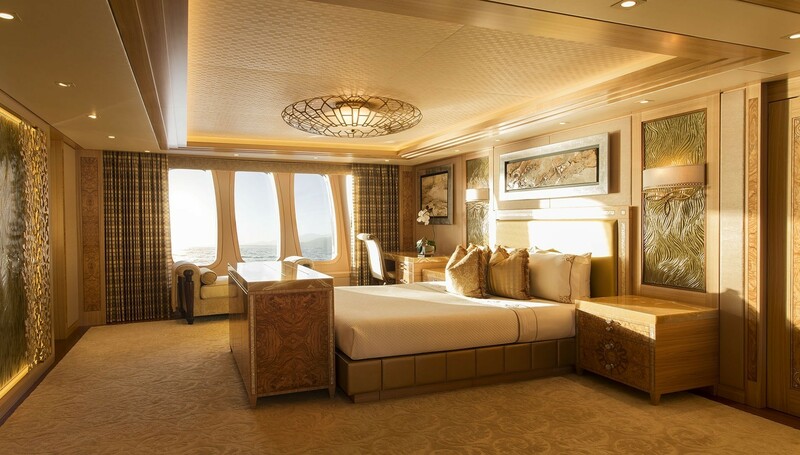 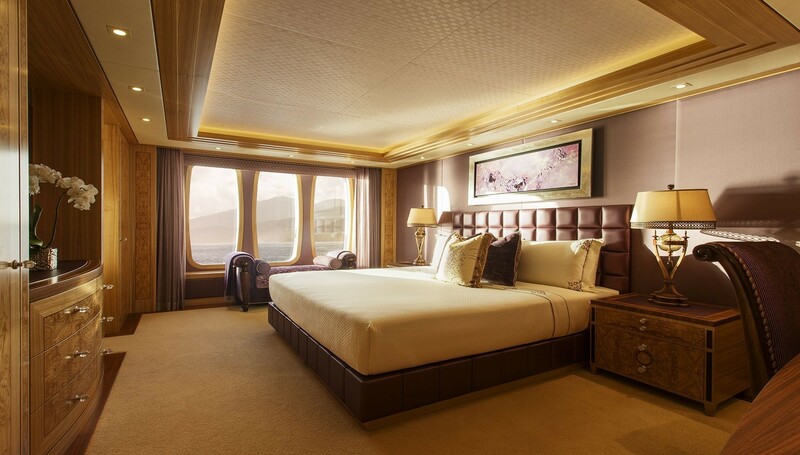 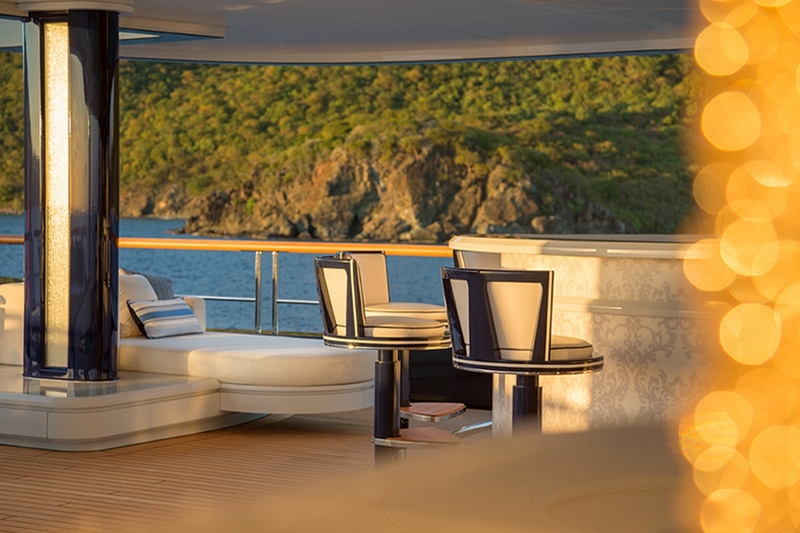 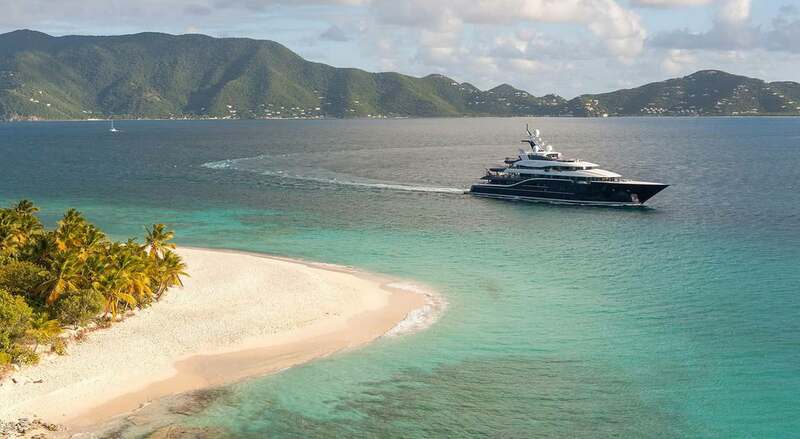 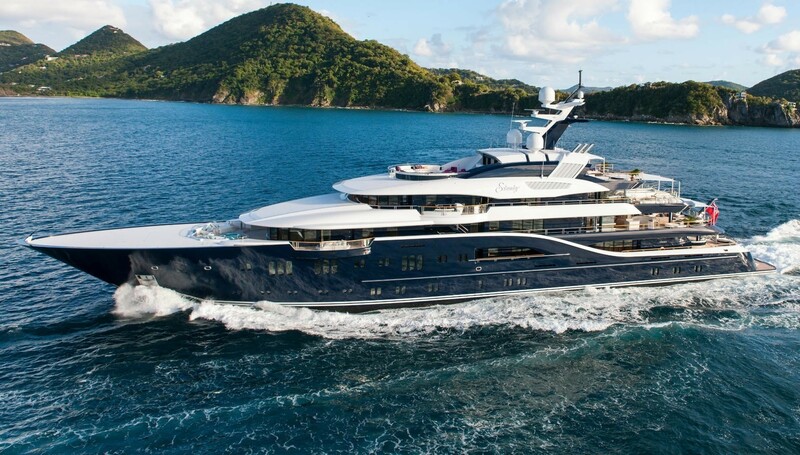 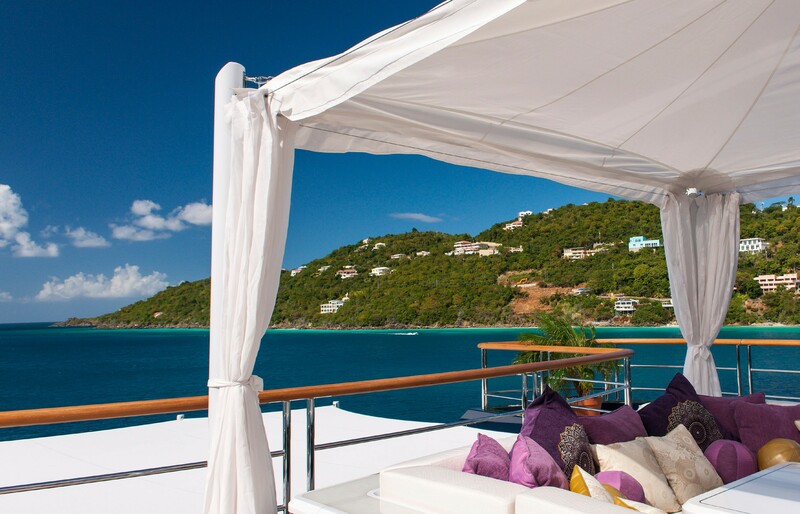 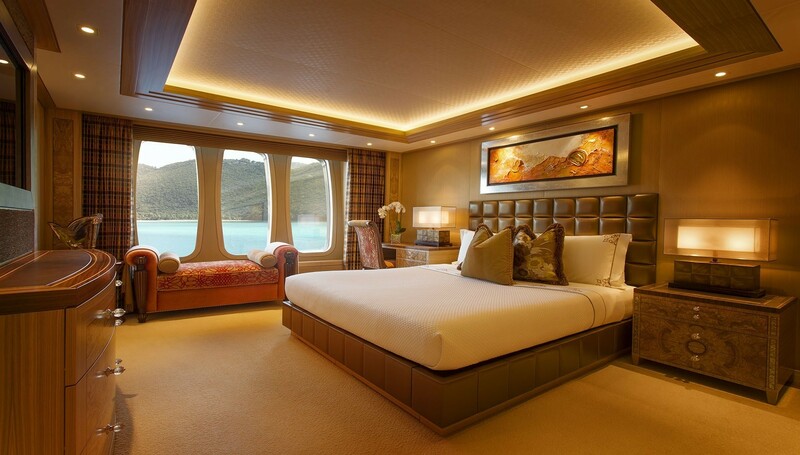 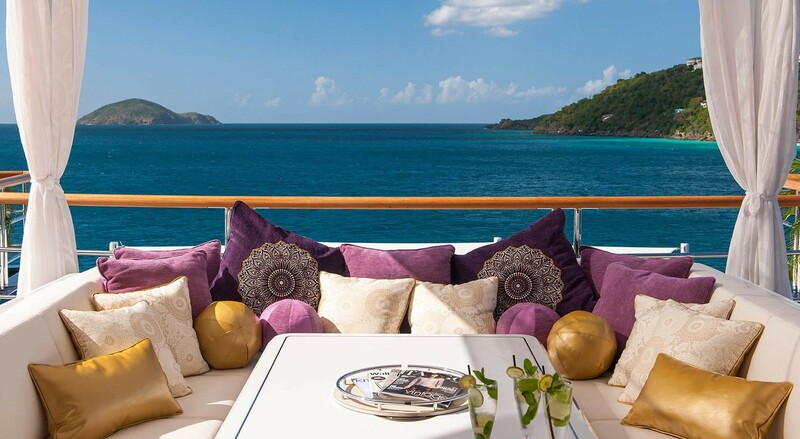 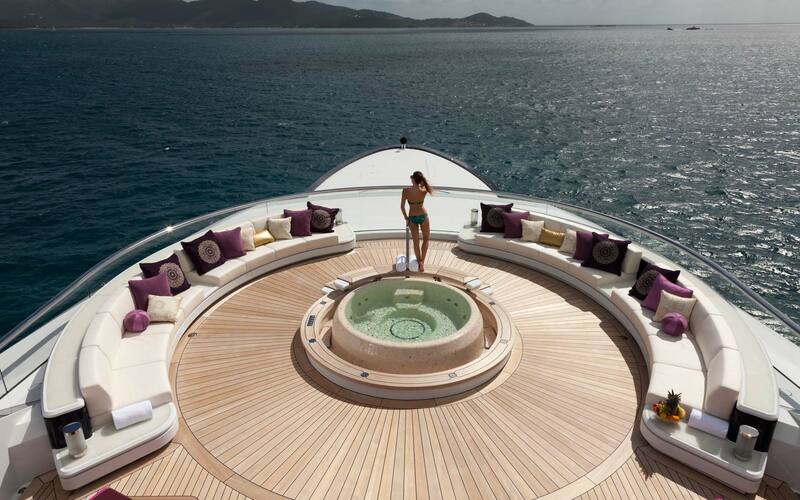 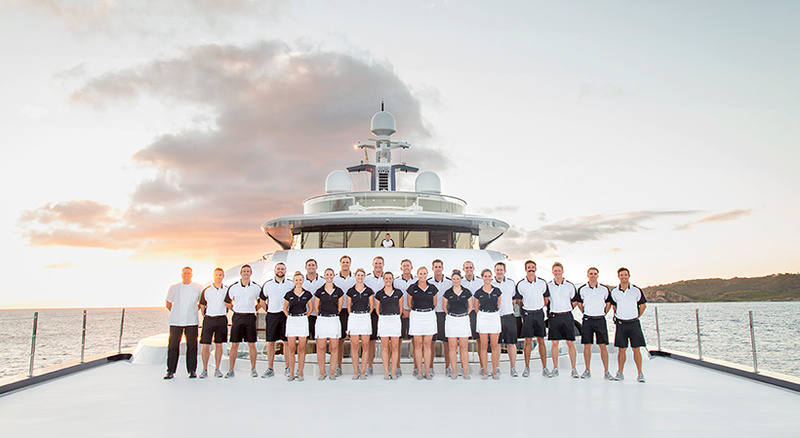 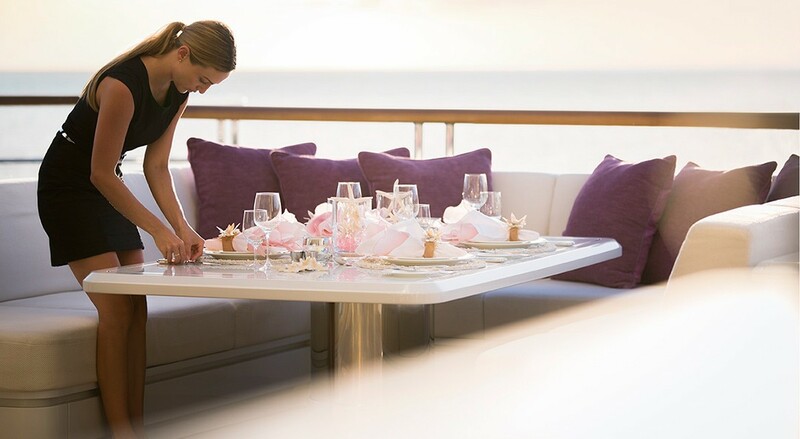 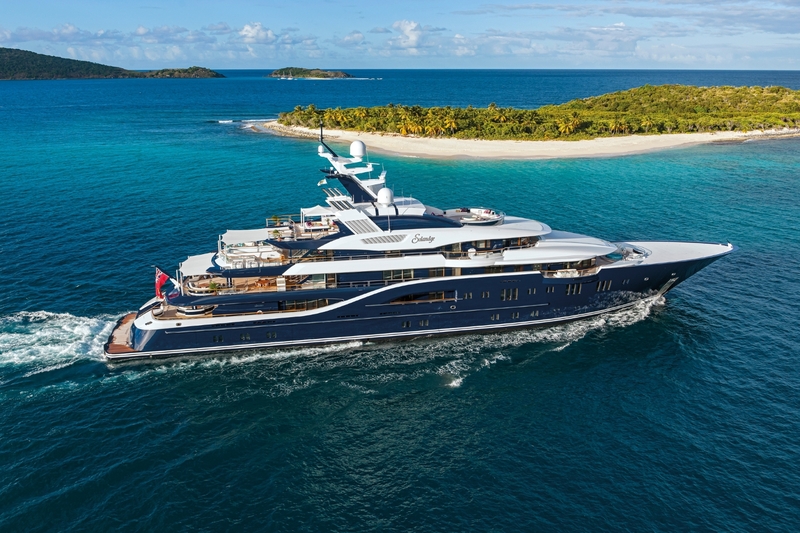 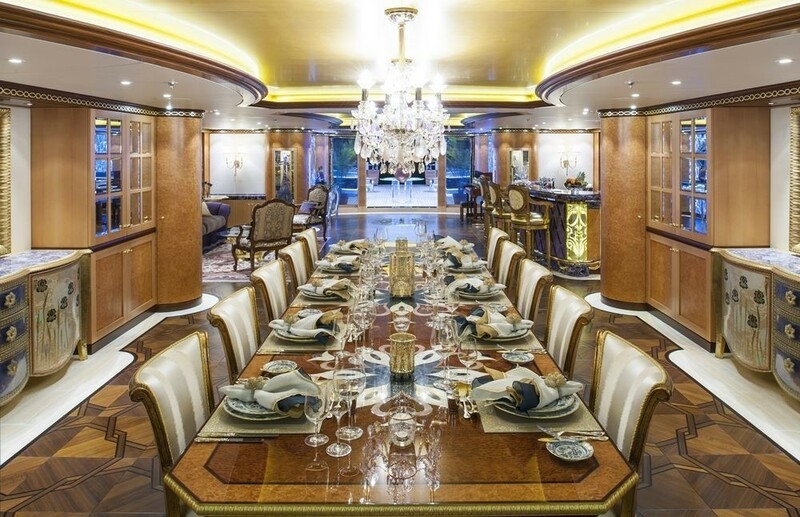 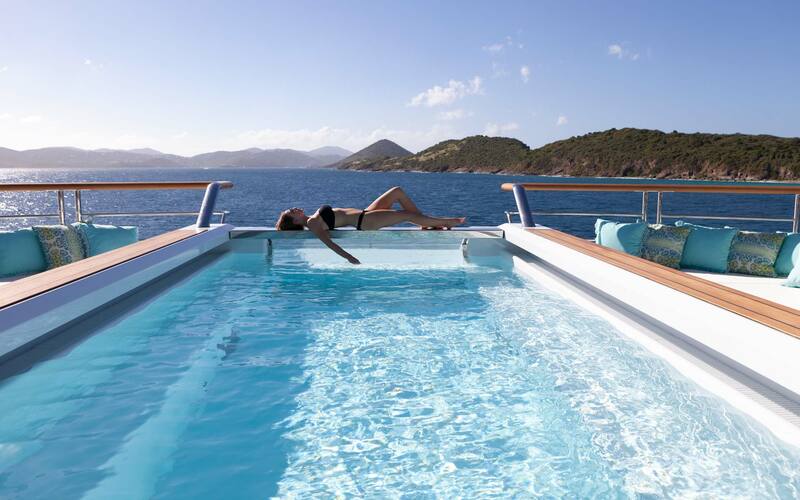 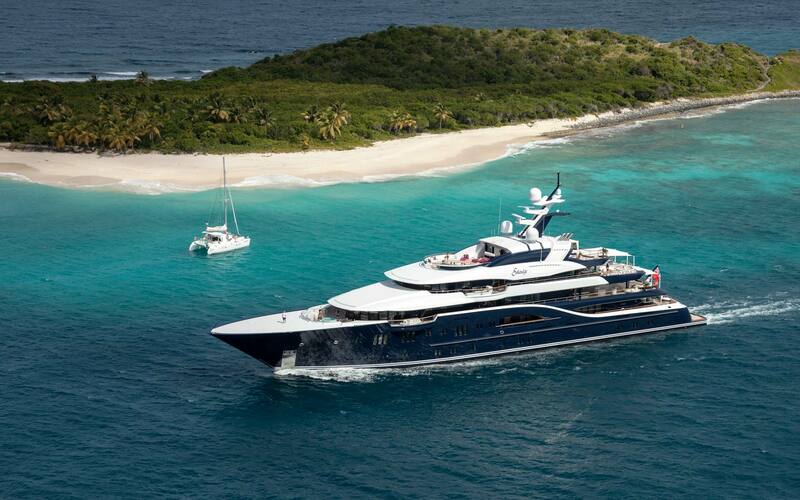 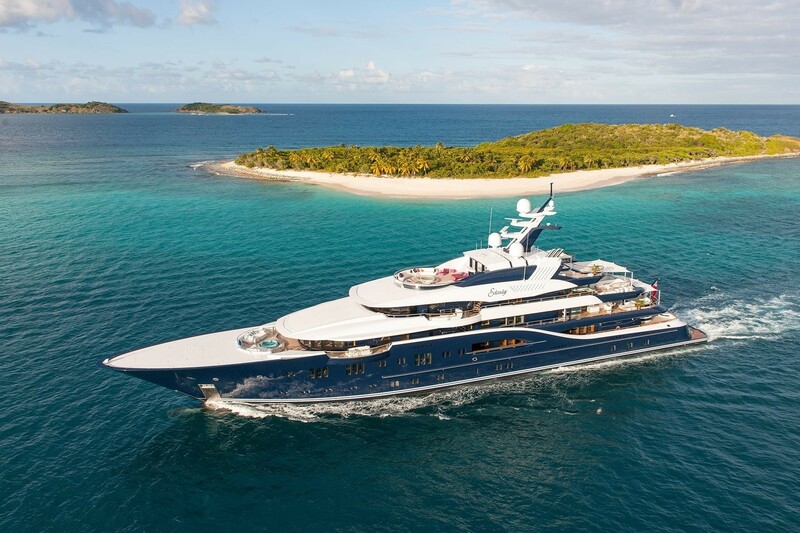 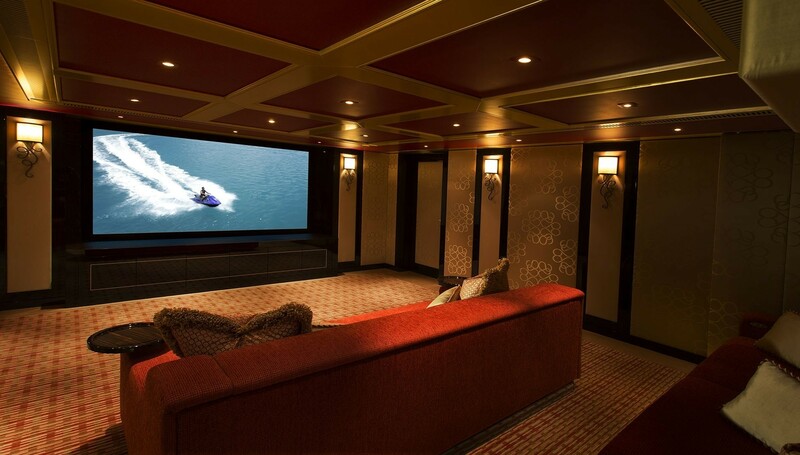 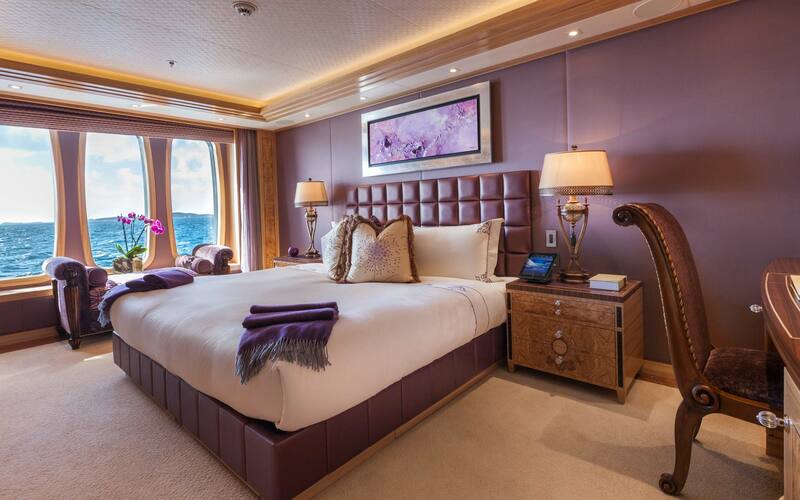 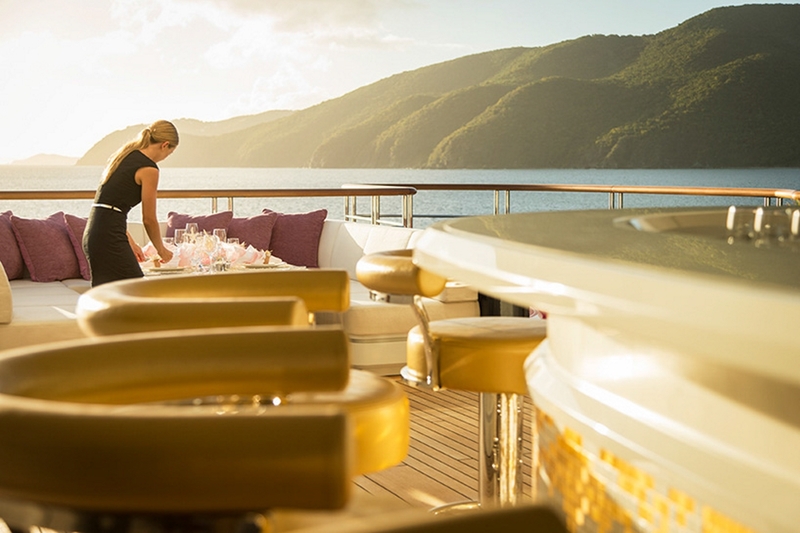 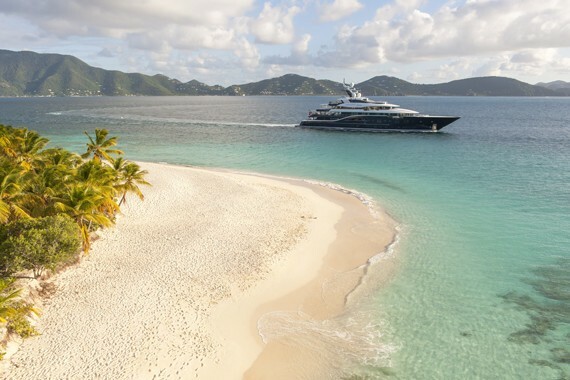 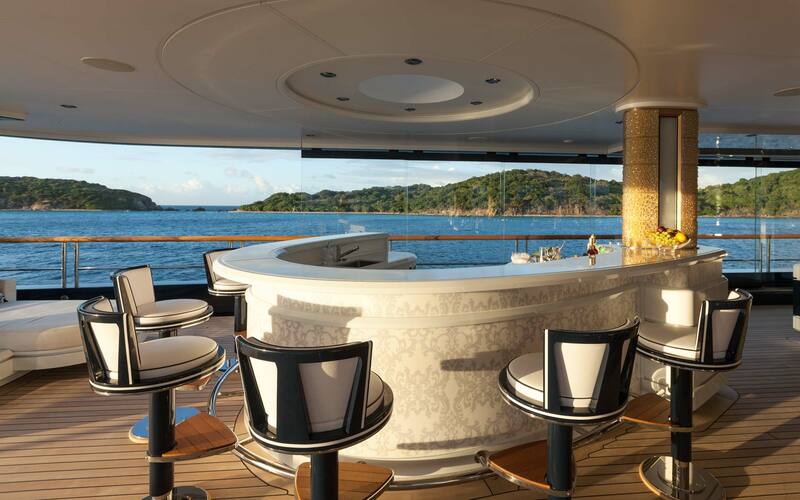 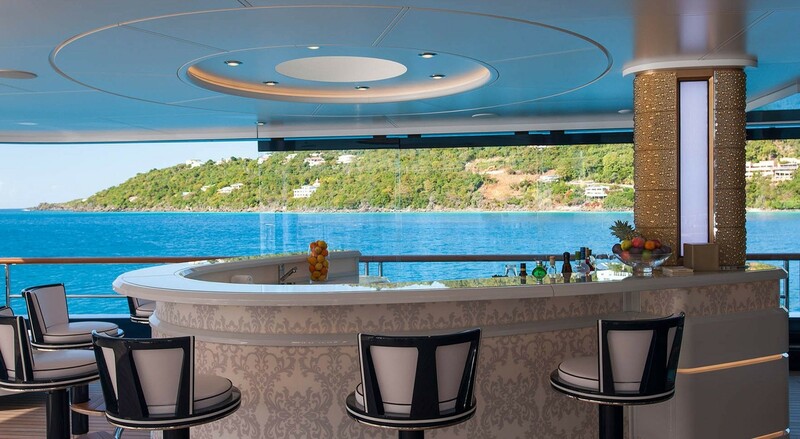 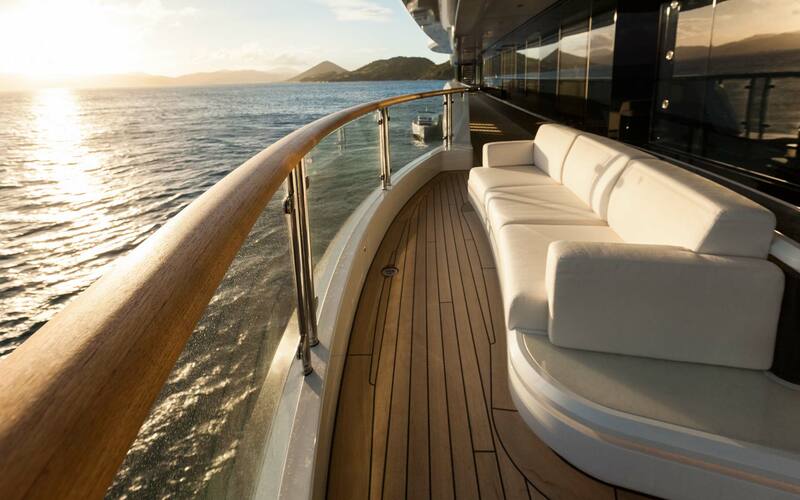 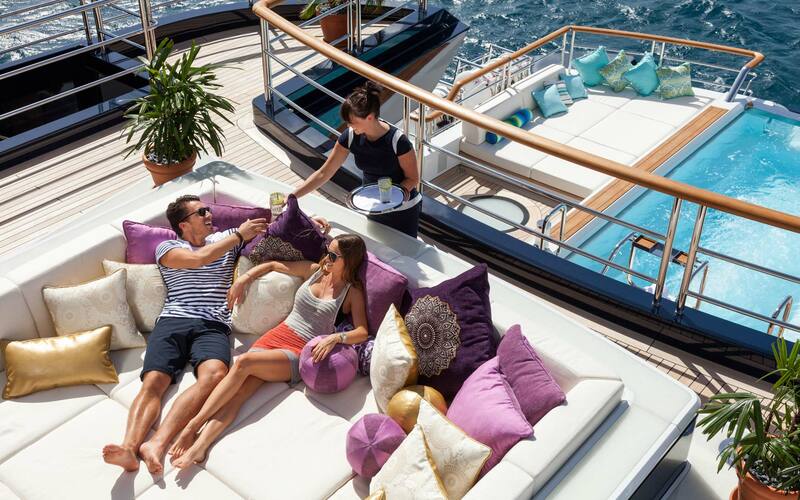 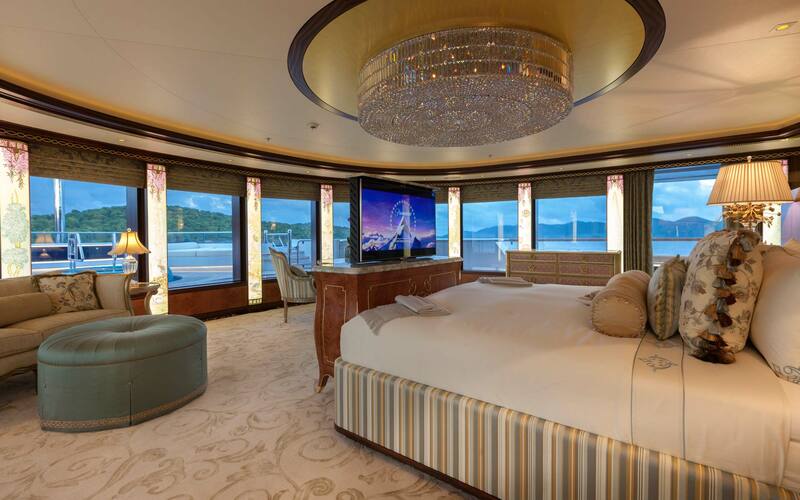 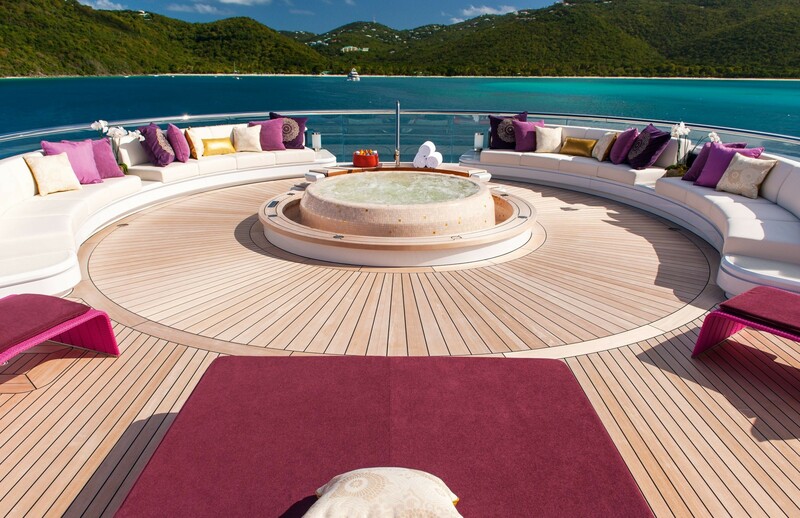 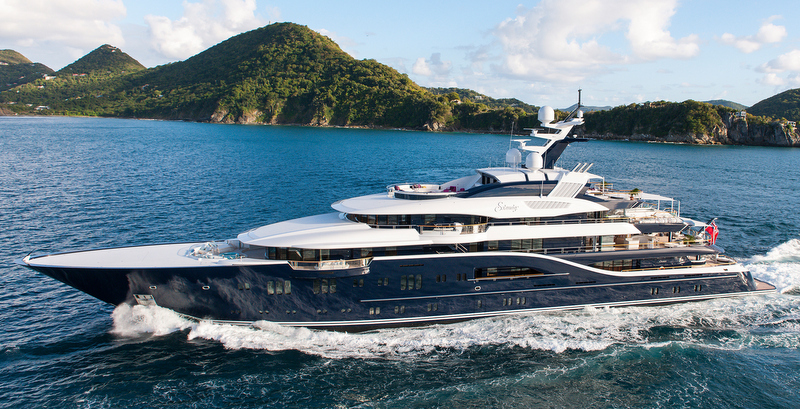 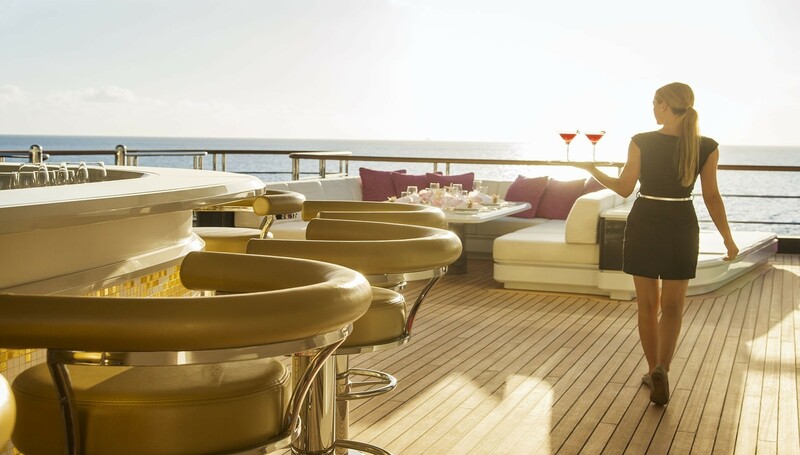 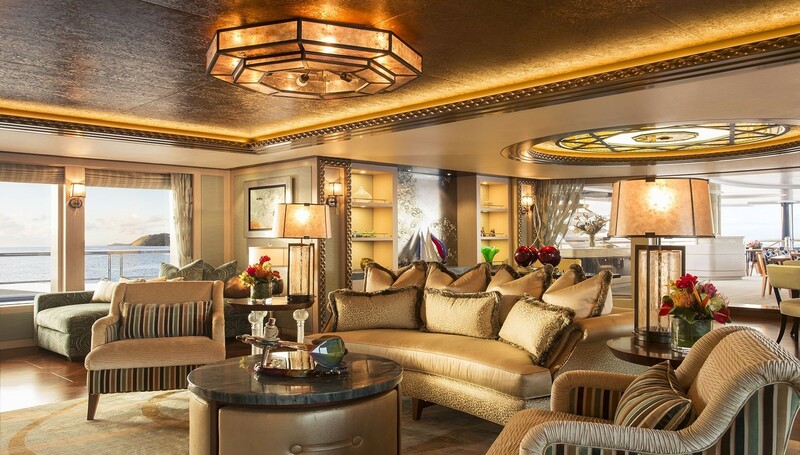 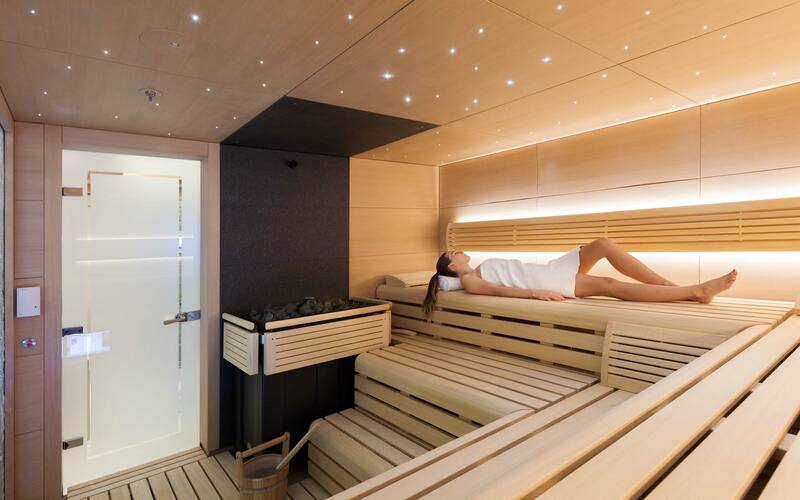 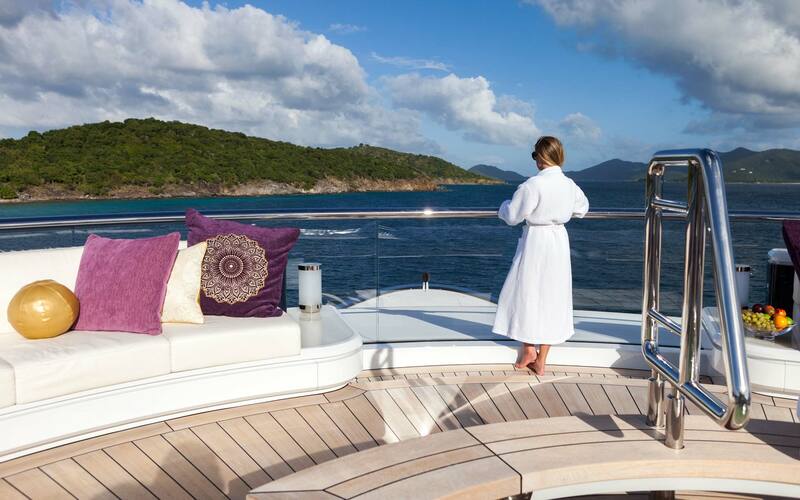 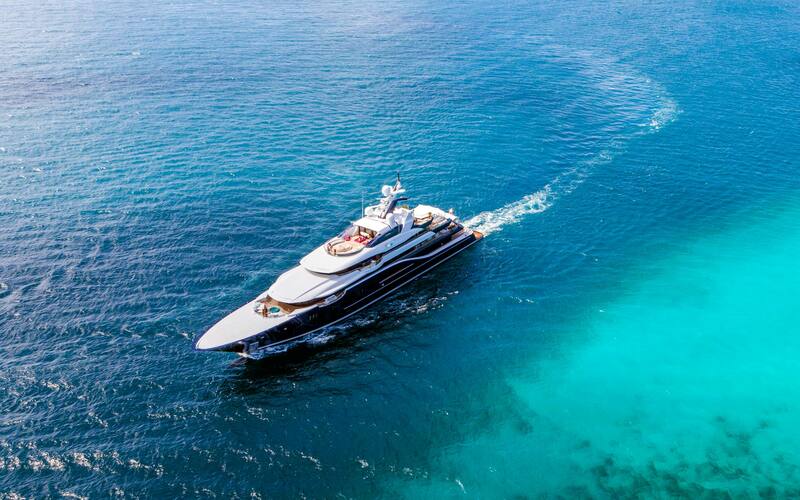 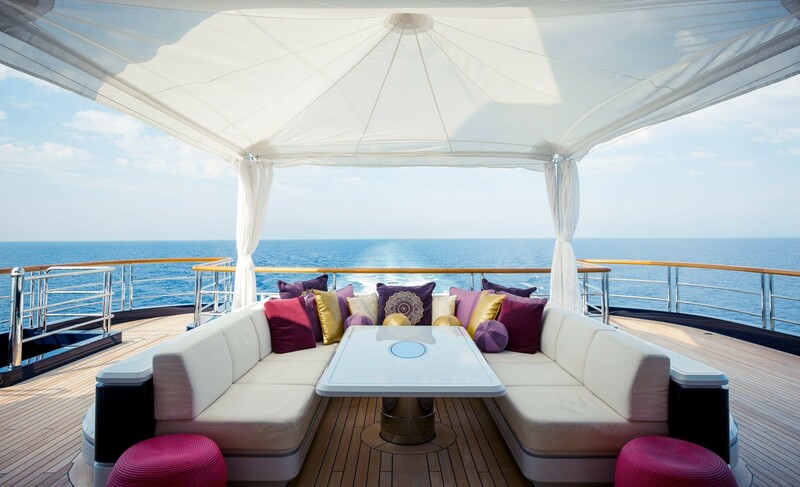 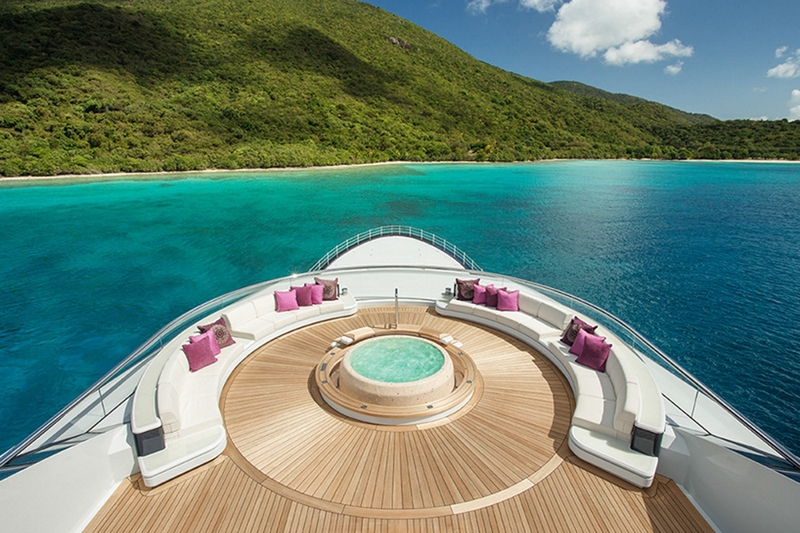 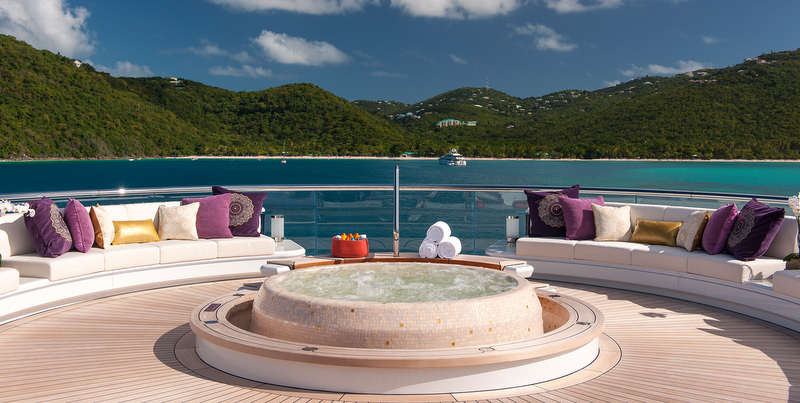 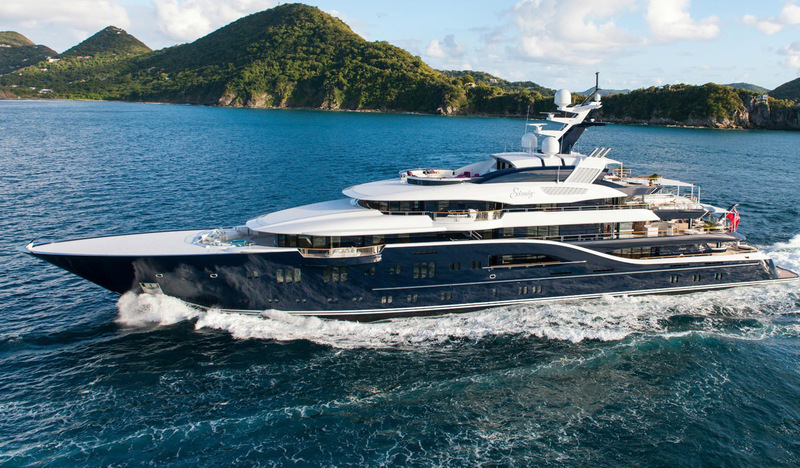 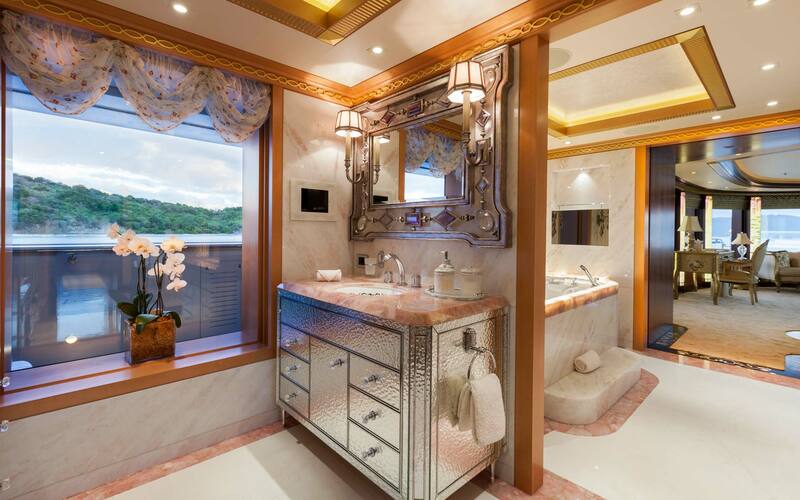 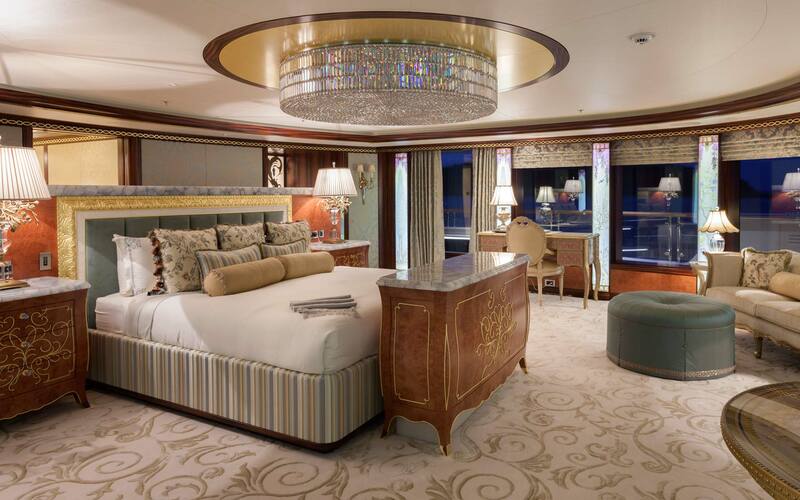 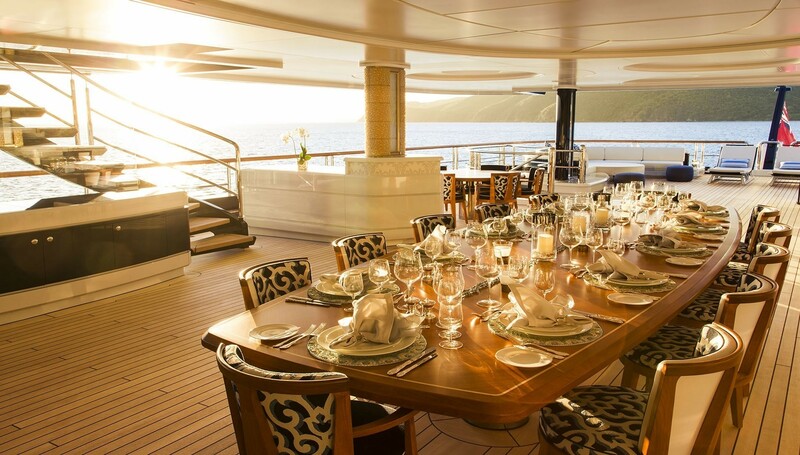 Megayacht SOLANDGE can accommodate up to 12 charter guests in 8 magnificent cabins. 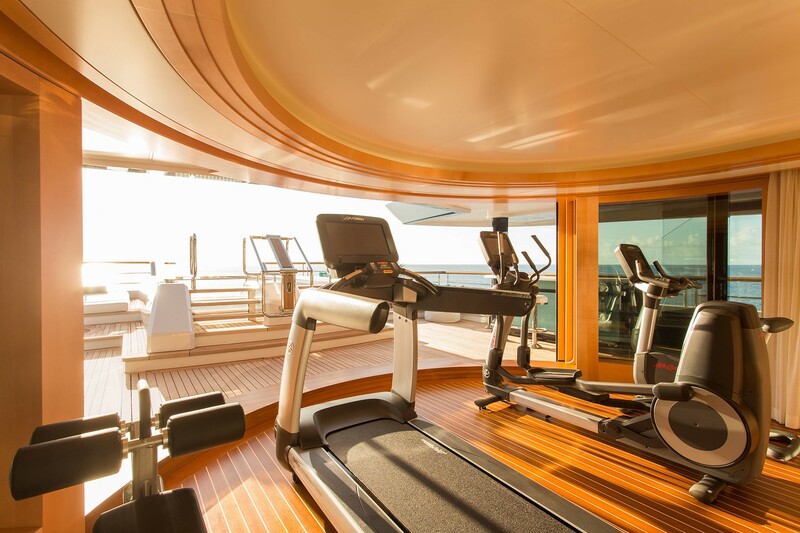 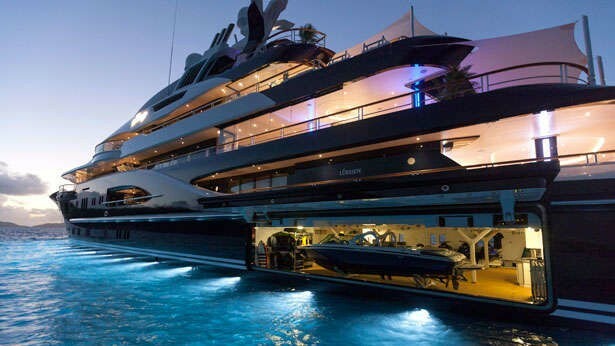 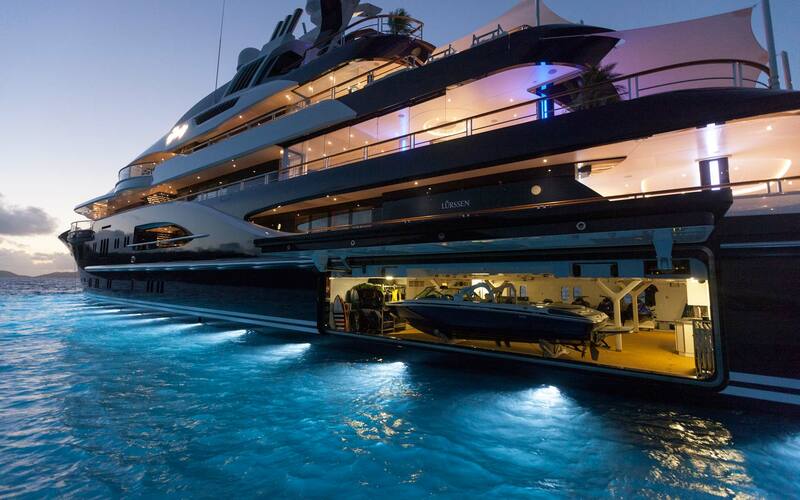 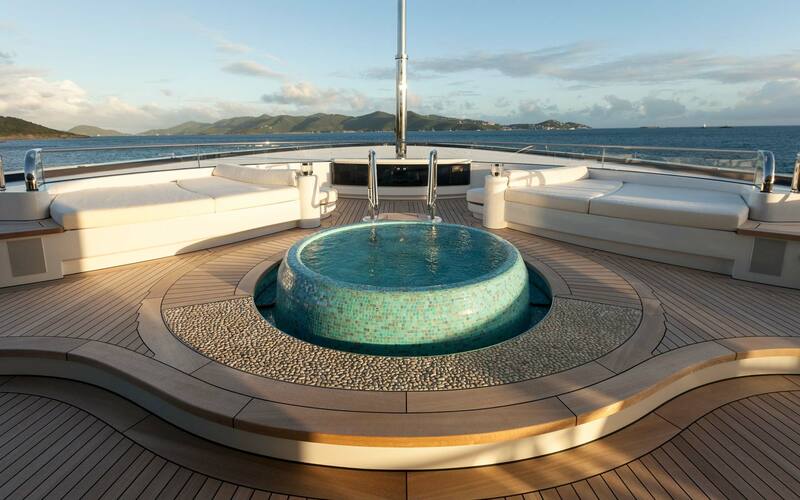 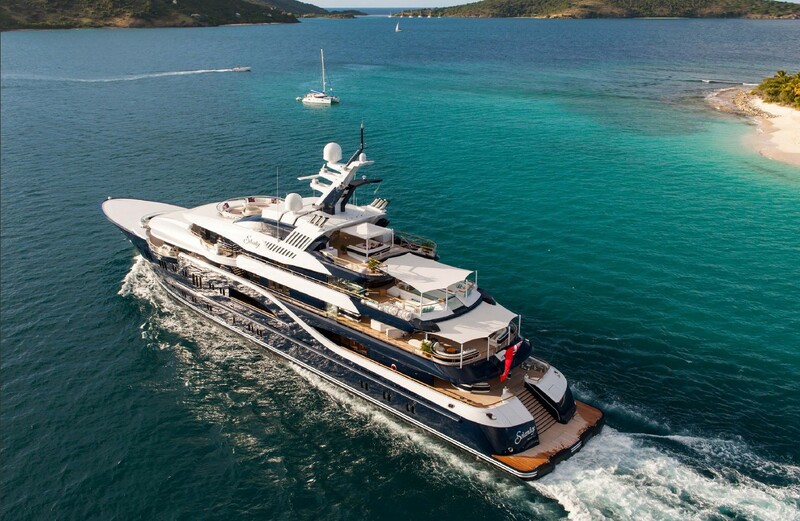 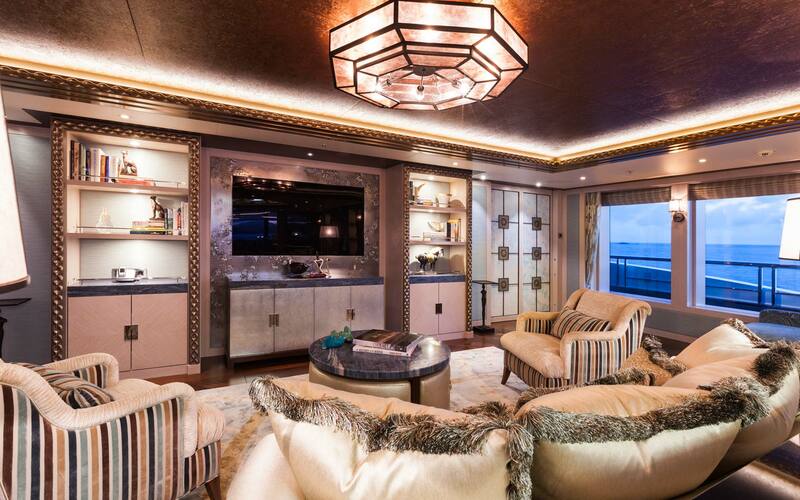 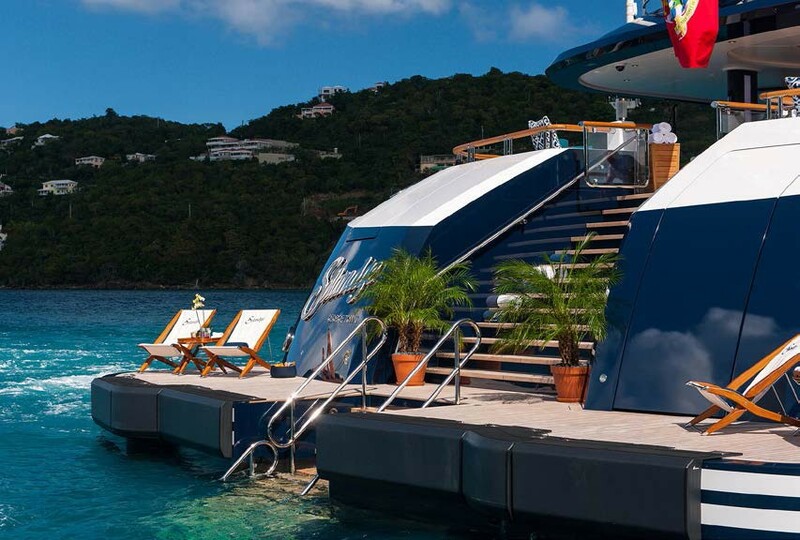 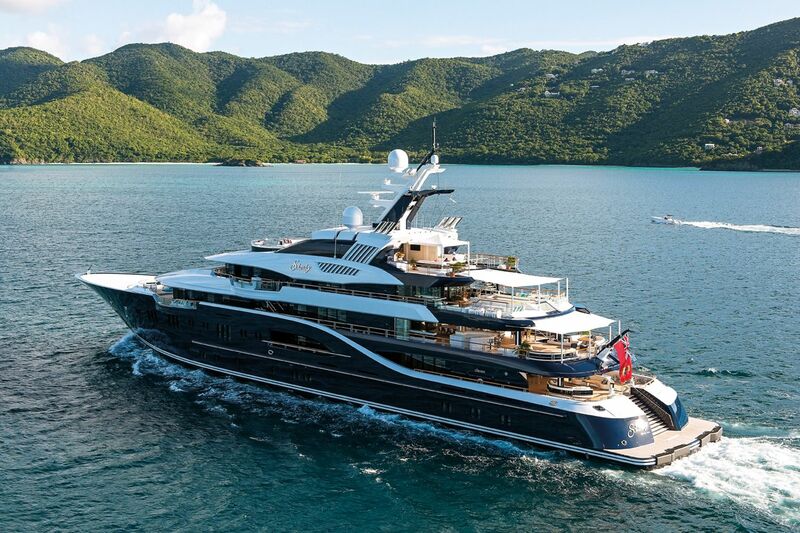 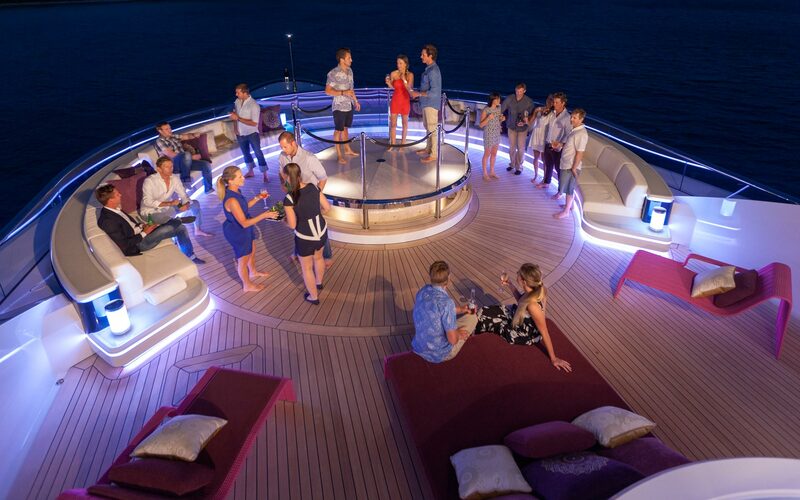 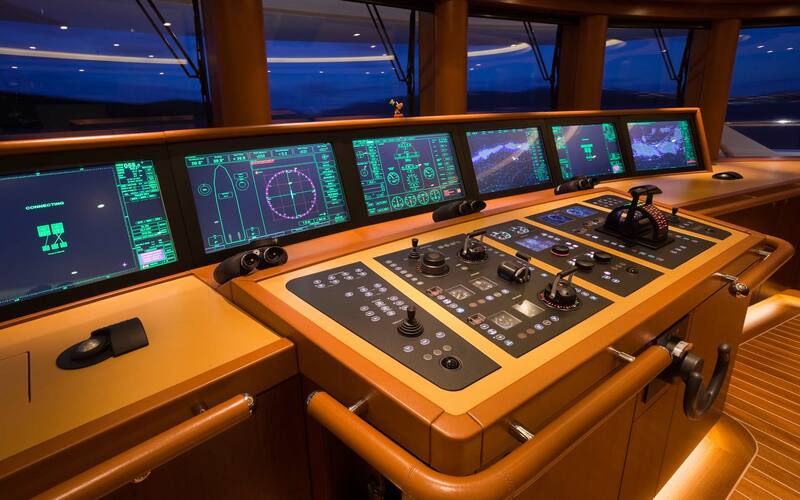 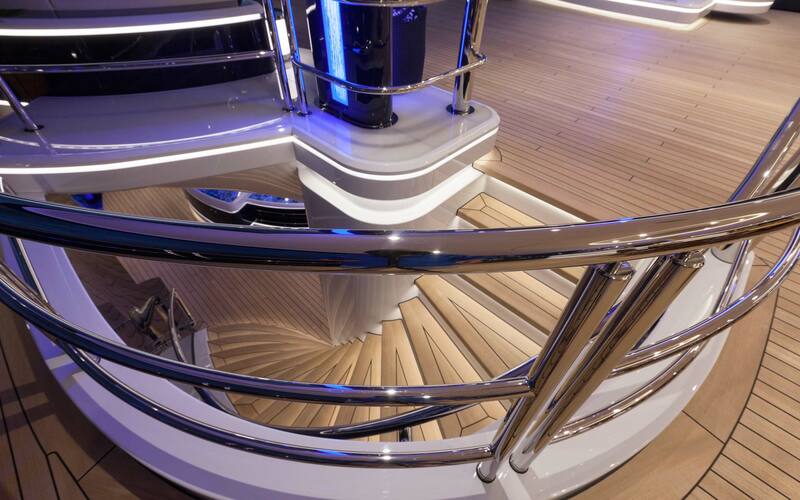 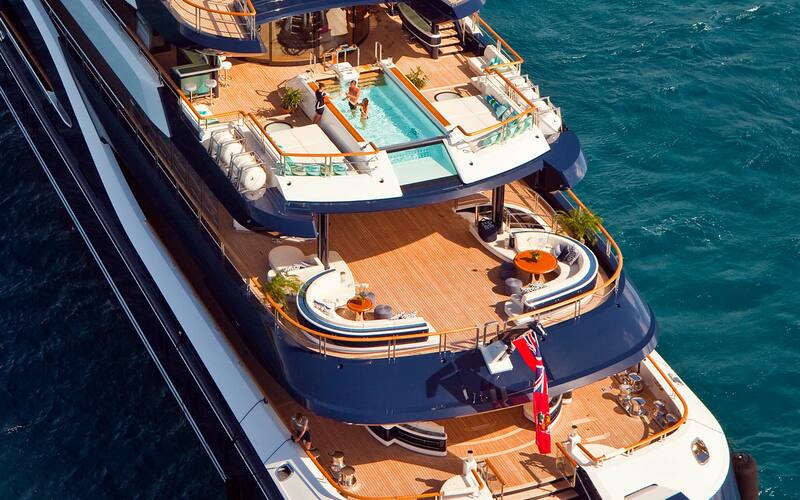 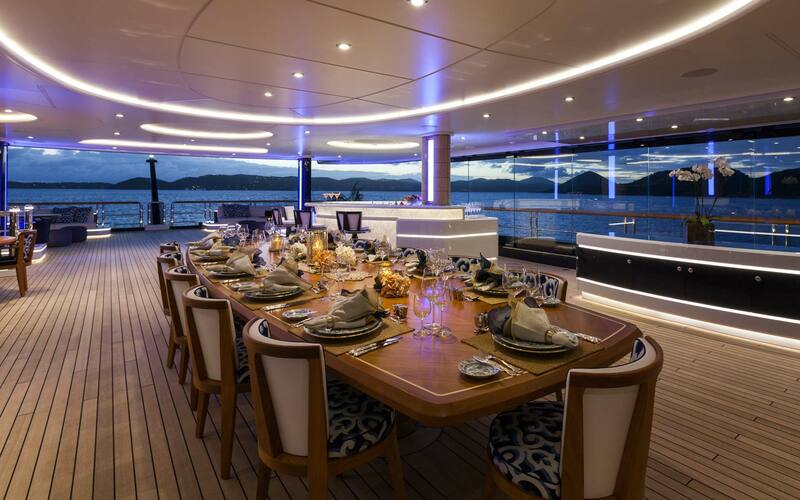 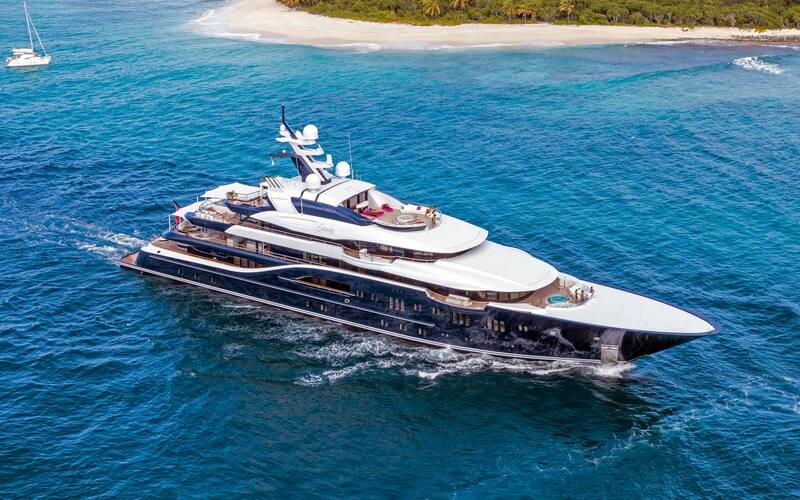 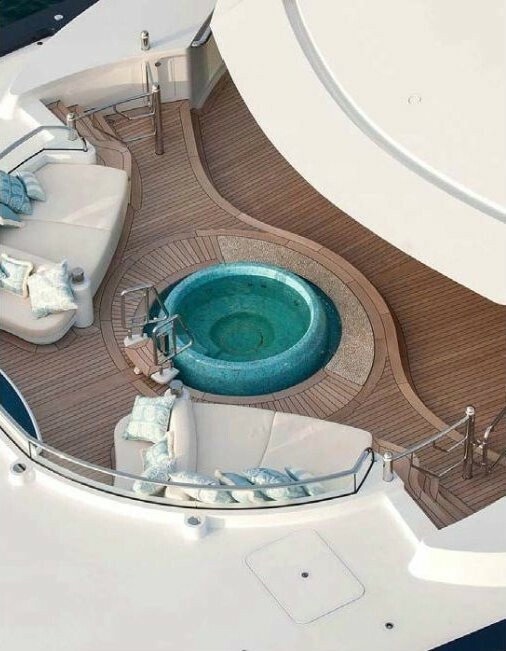 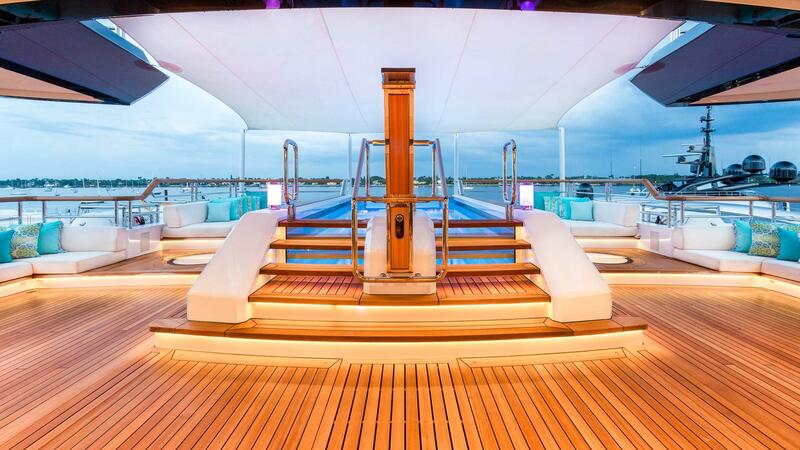 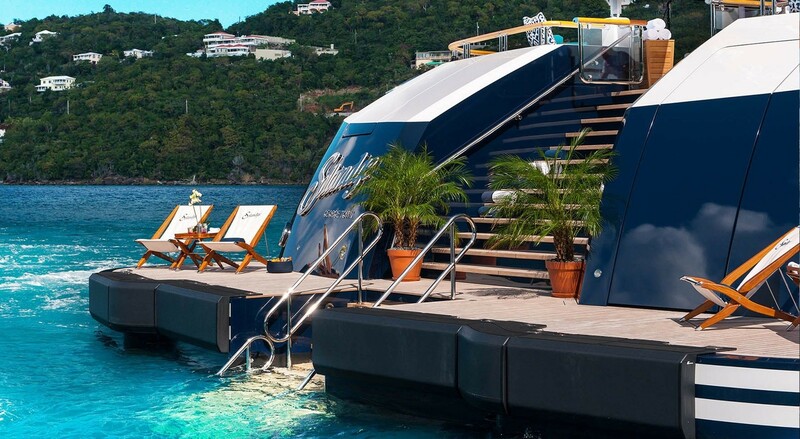 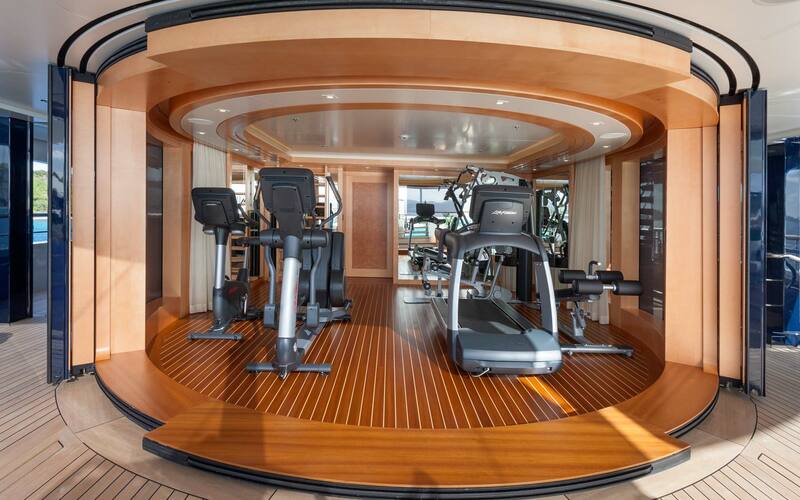 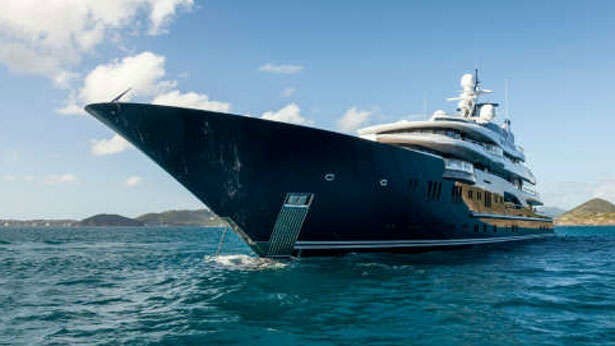 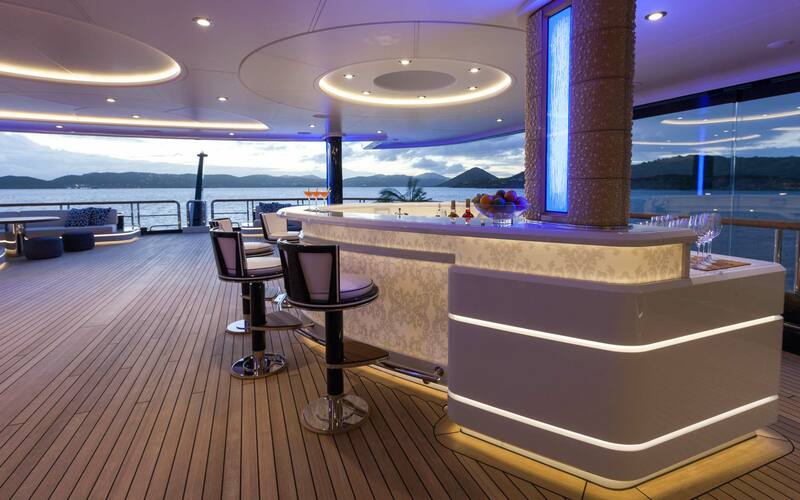 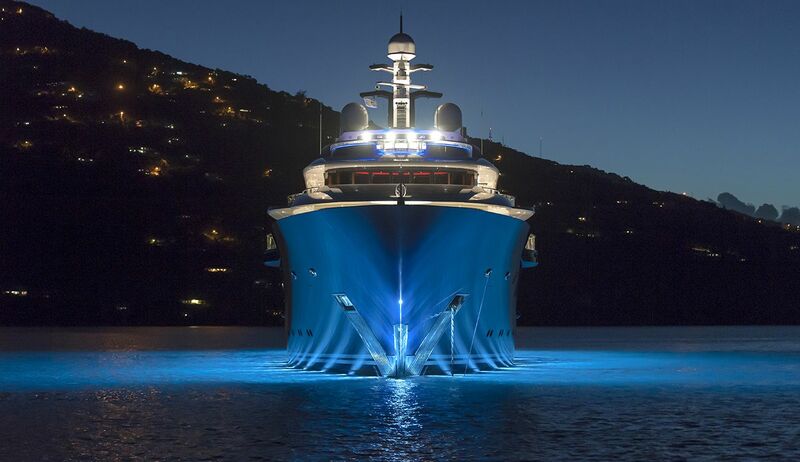 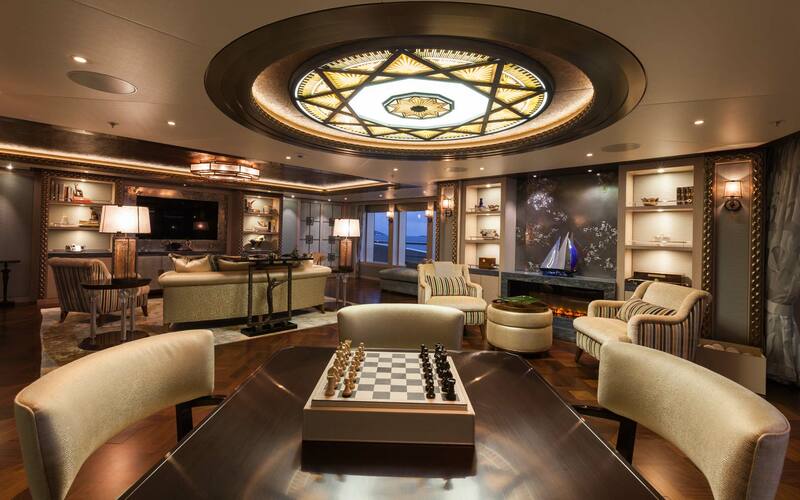 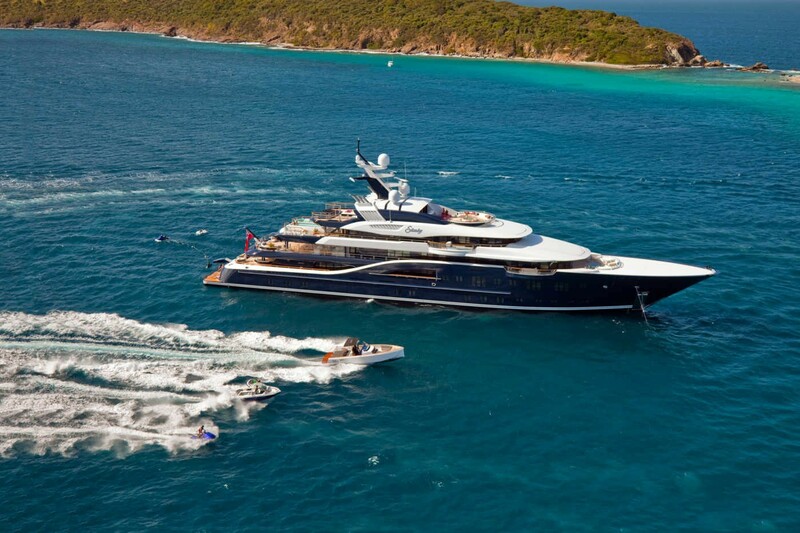 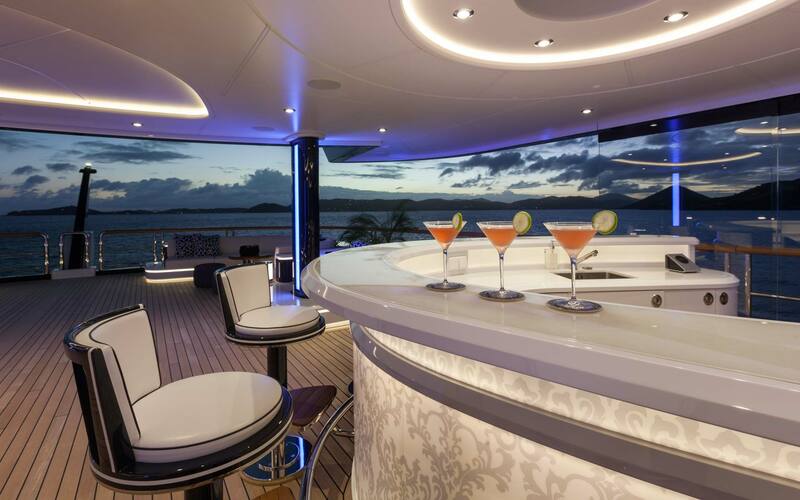 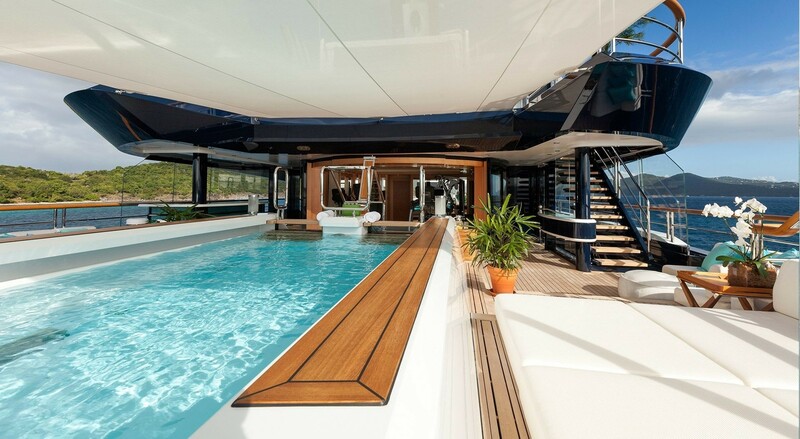 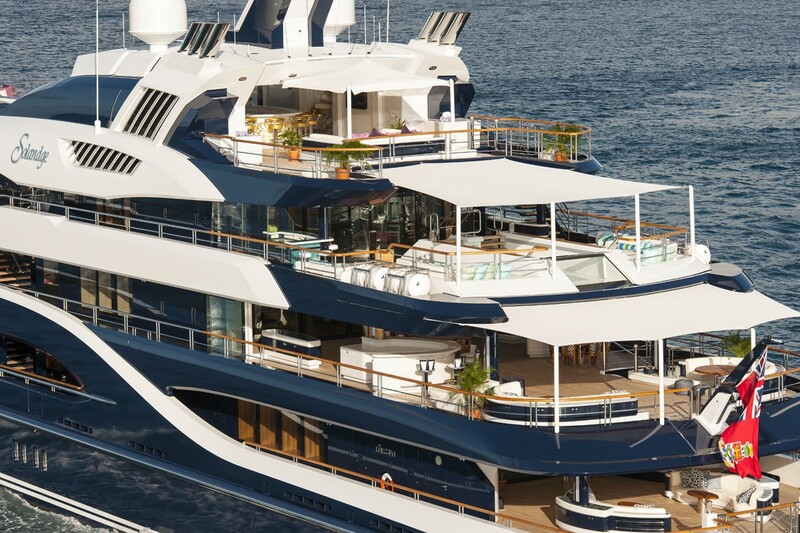 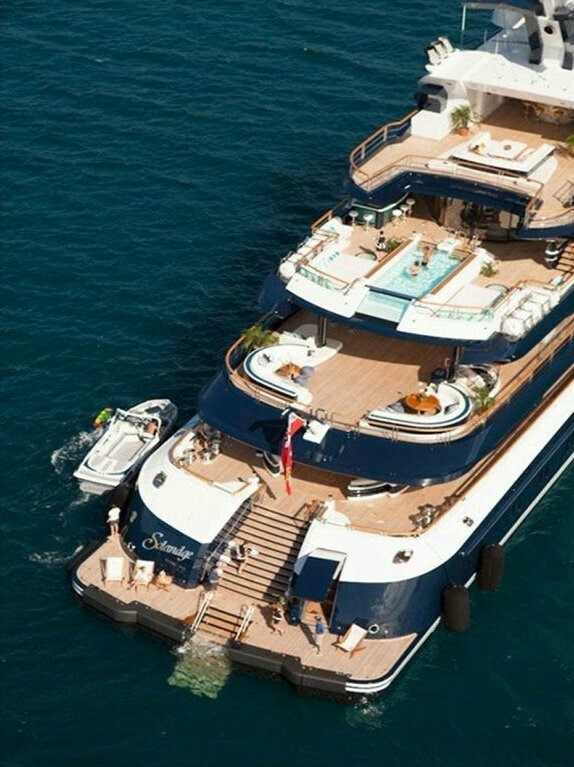 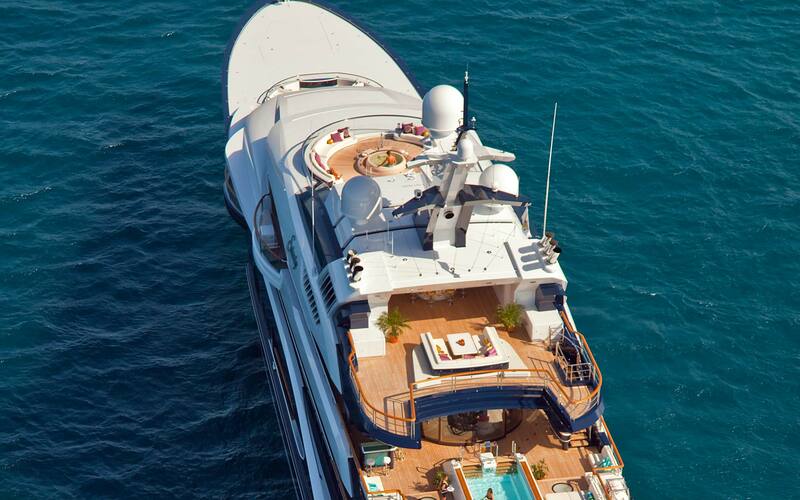 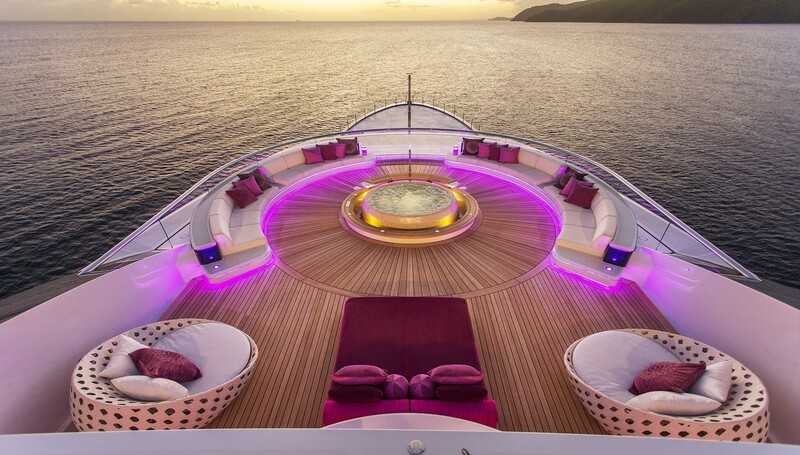 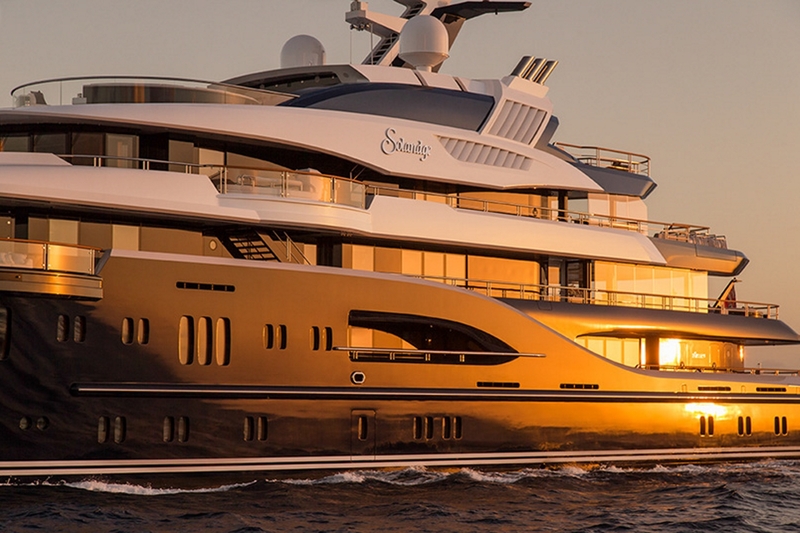 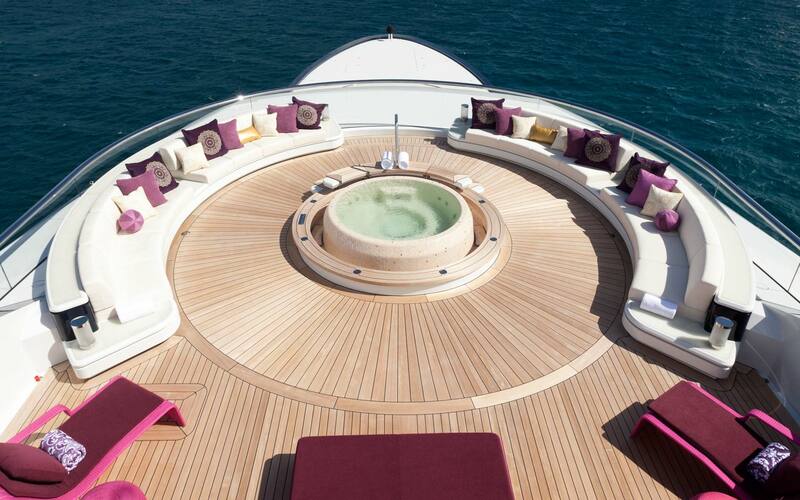 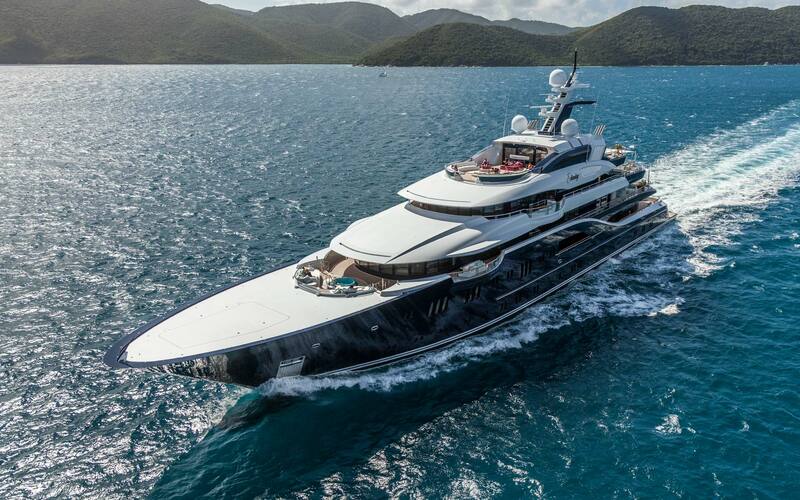 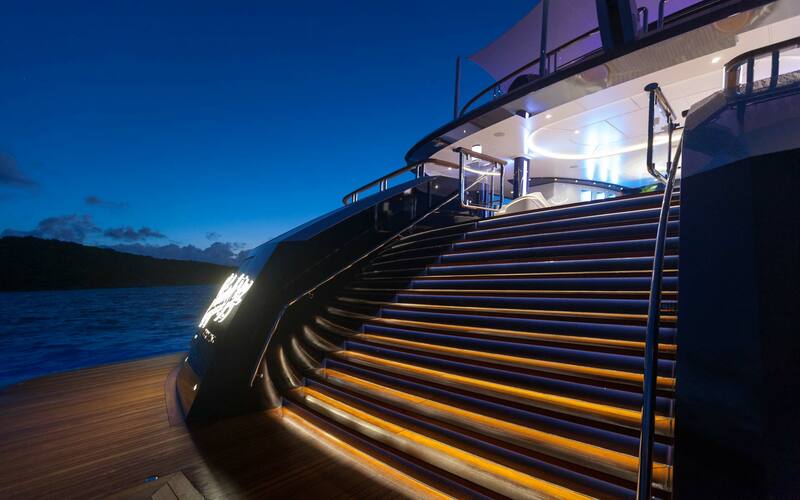 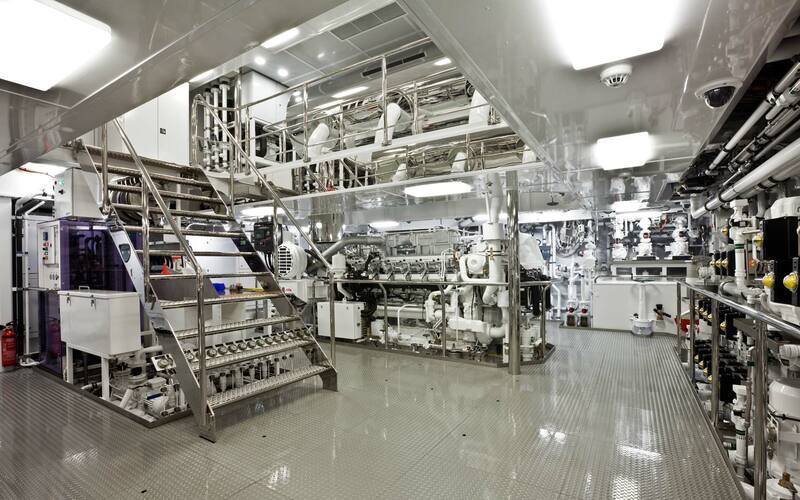 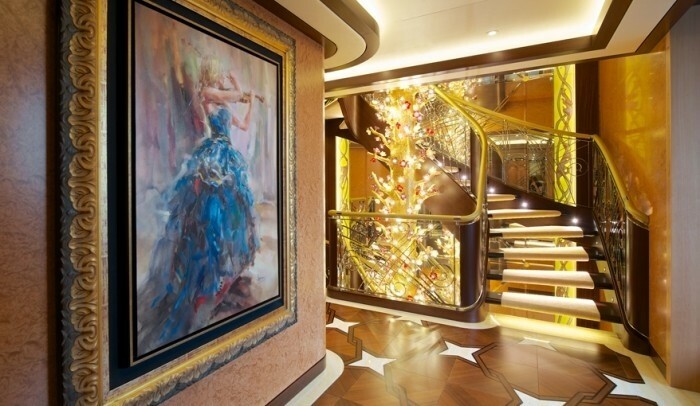 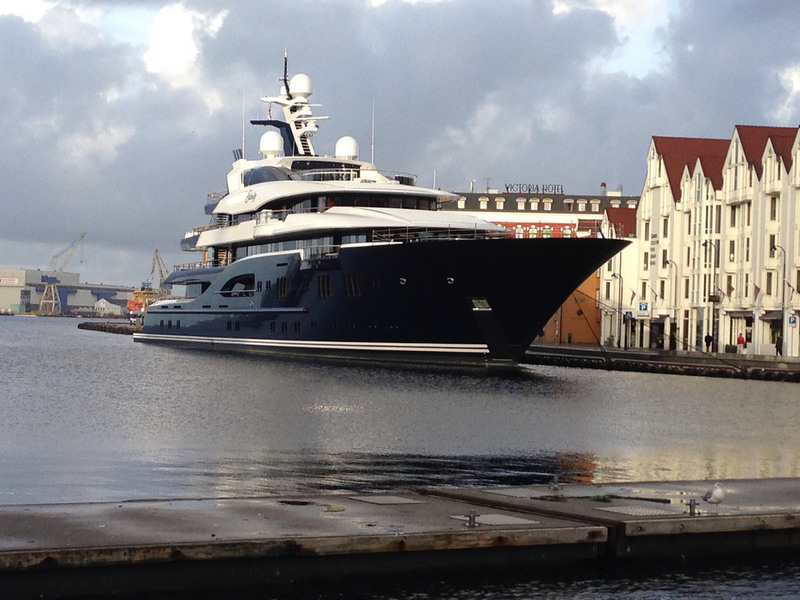 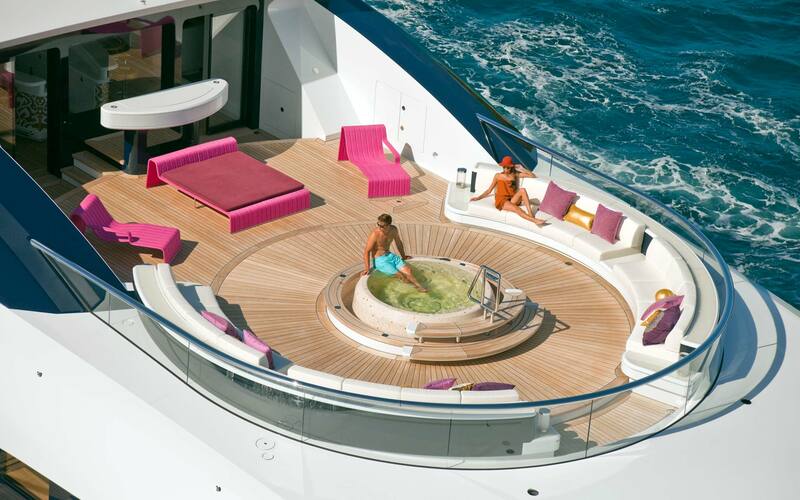 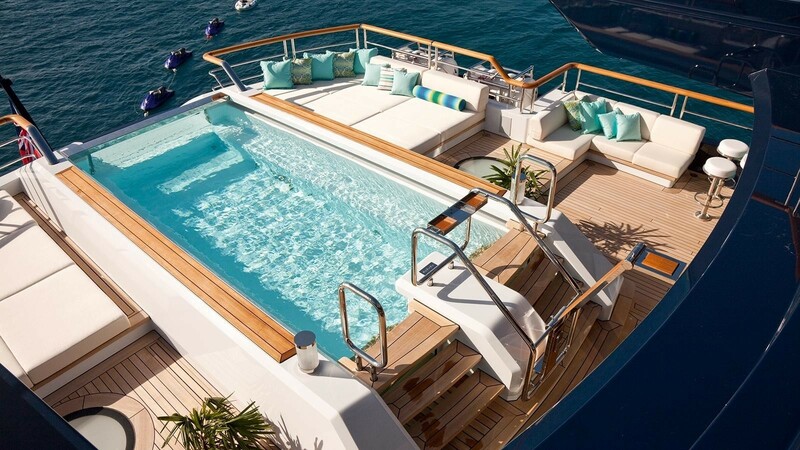 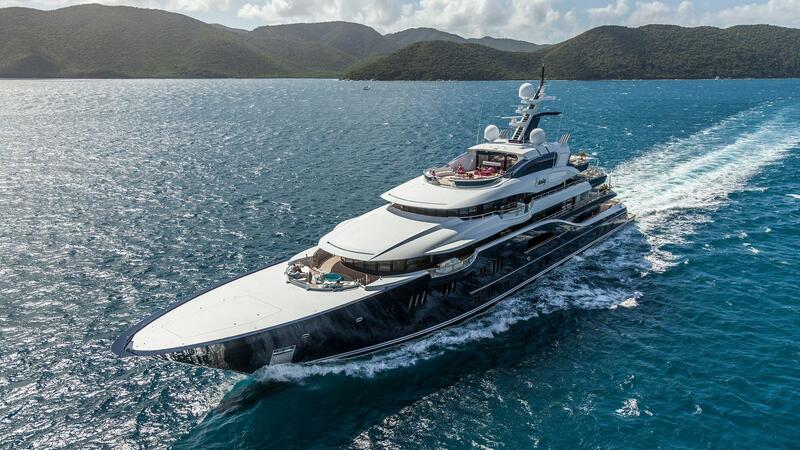 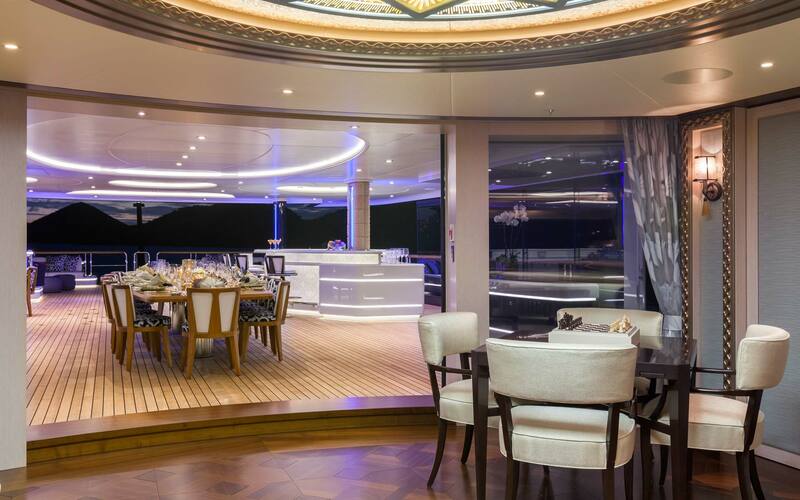 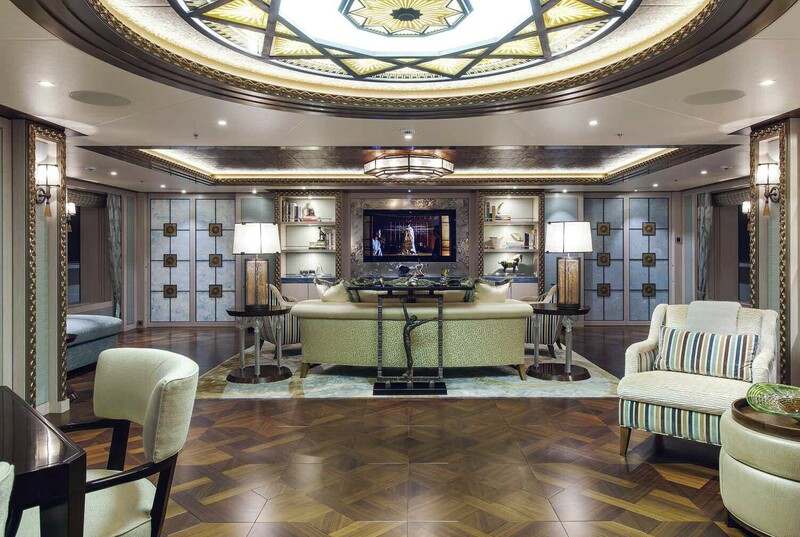 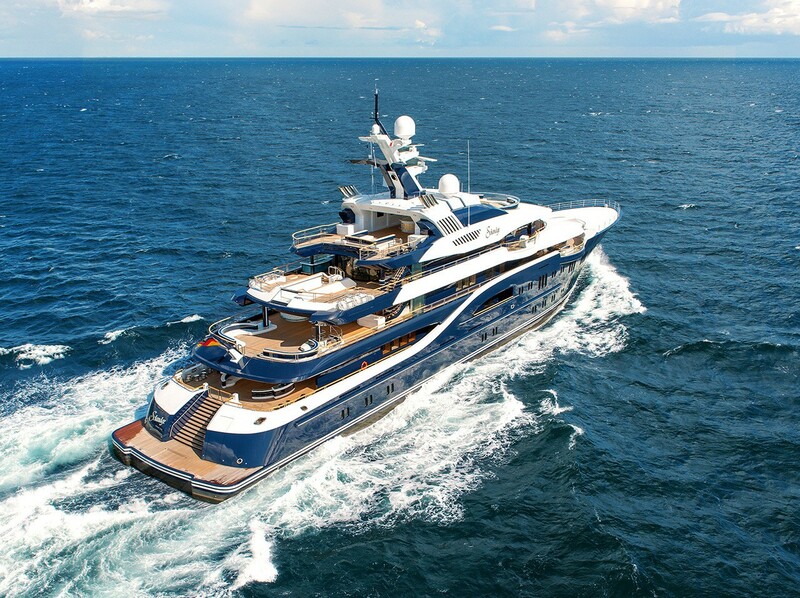 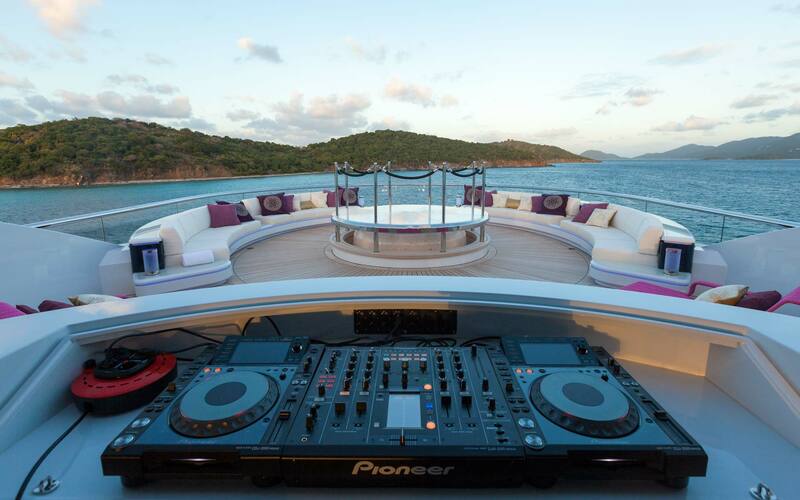 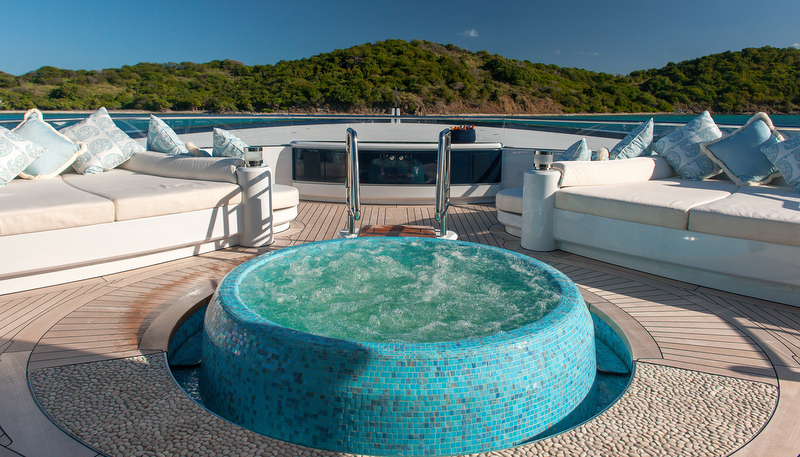 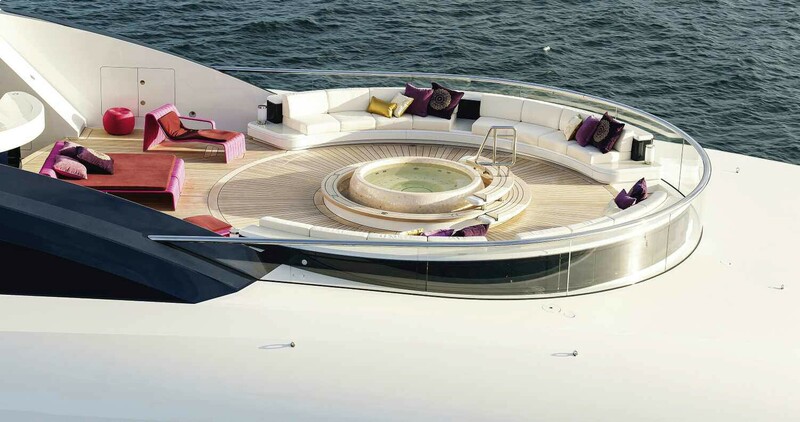 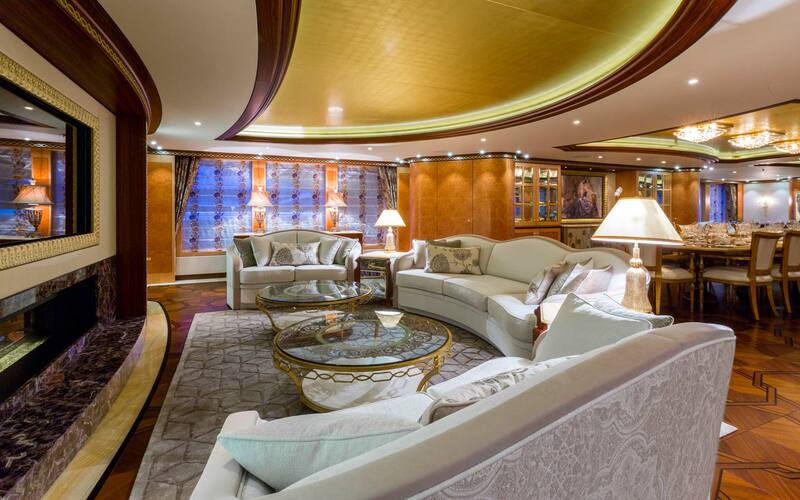 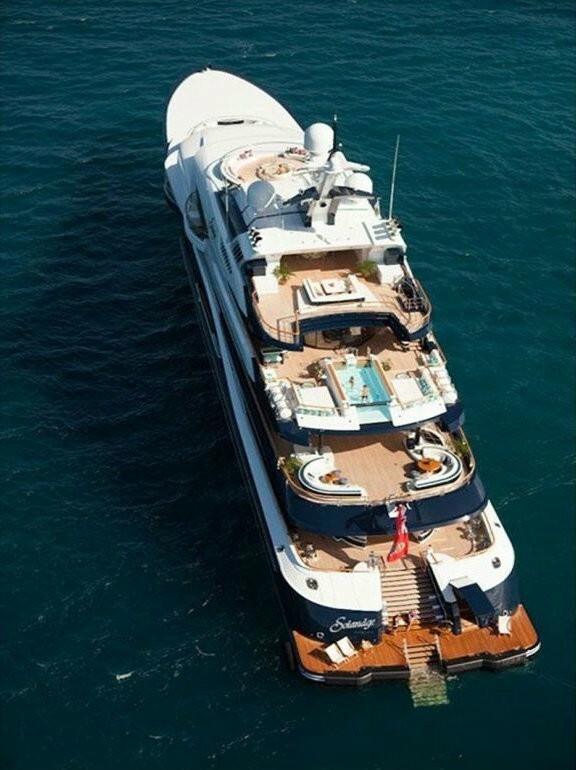 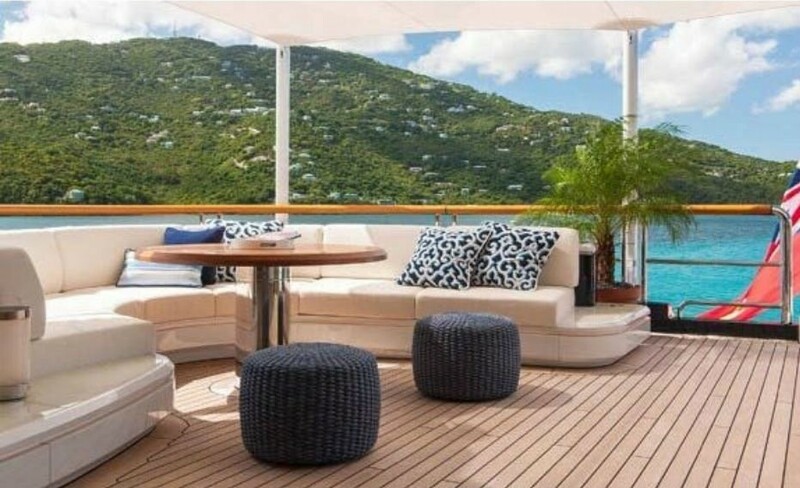 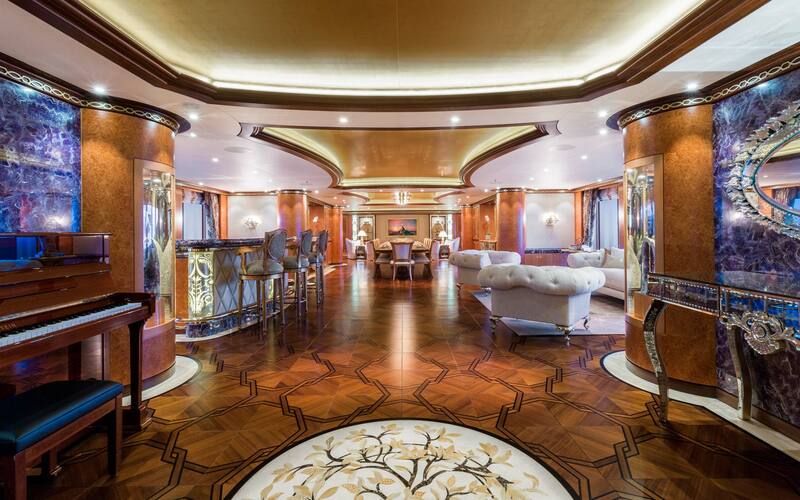 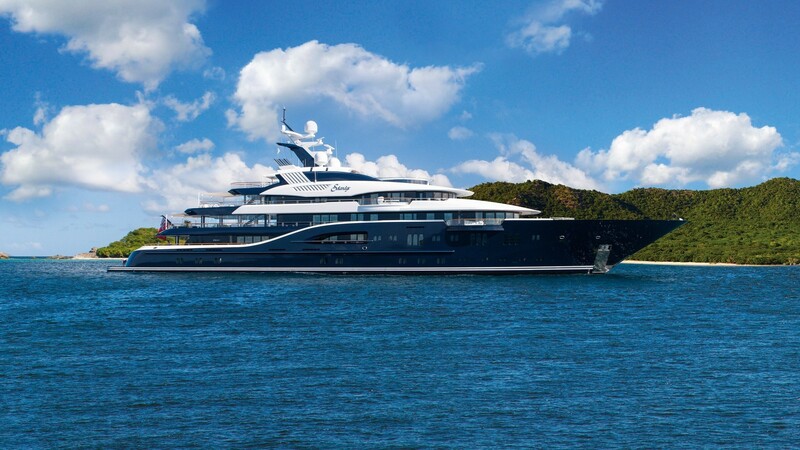 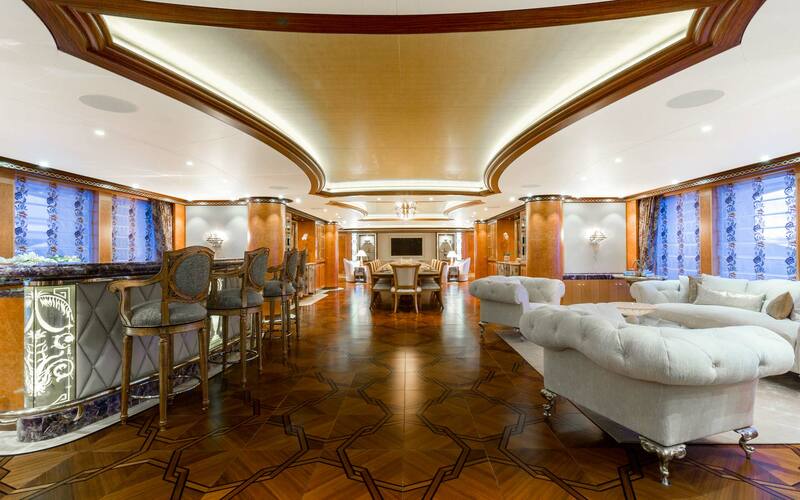 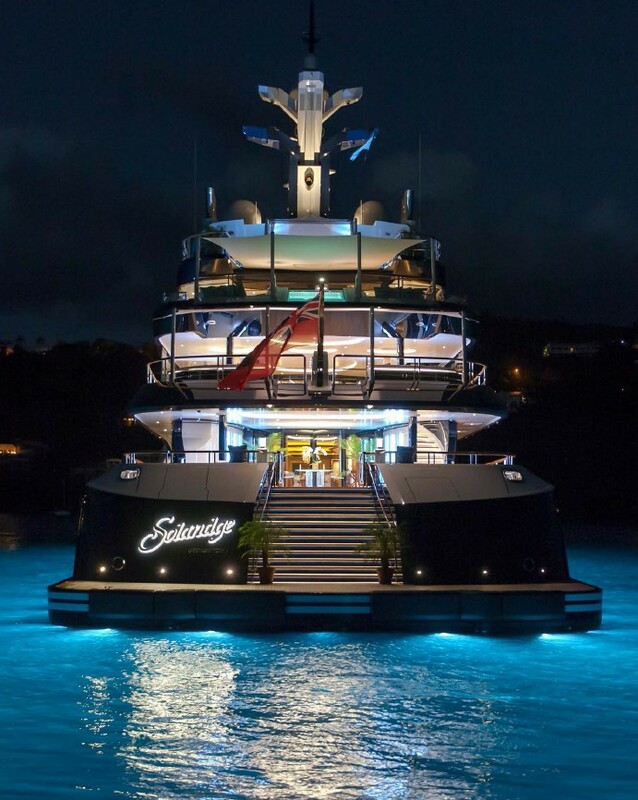 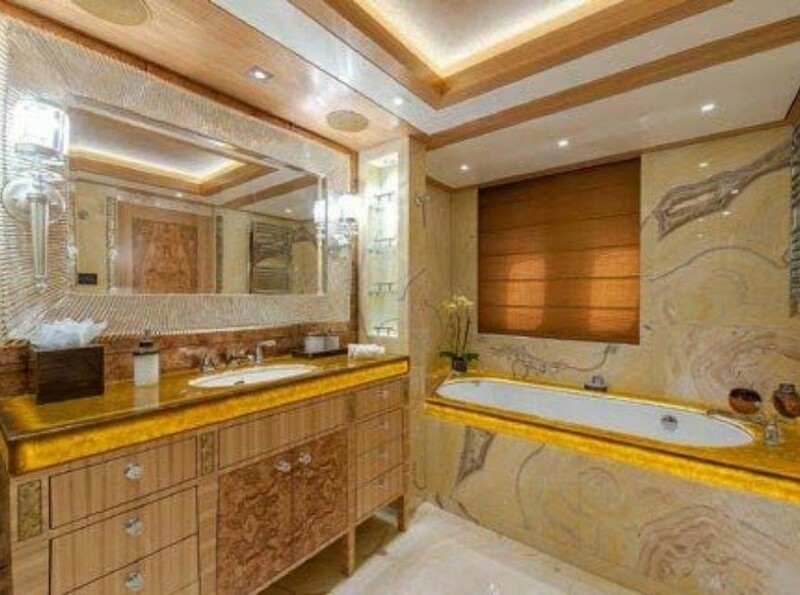 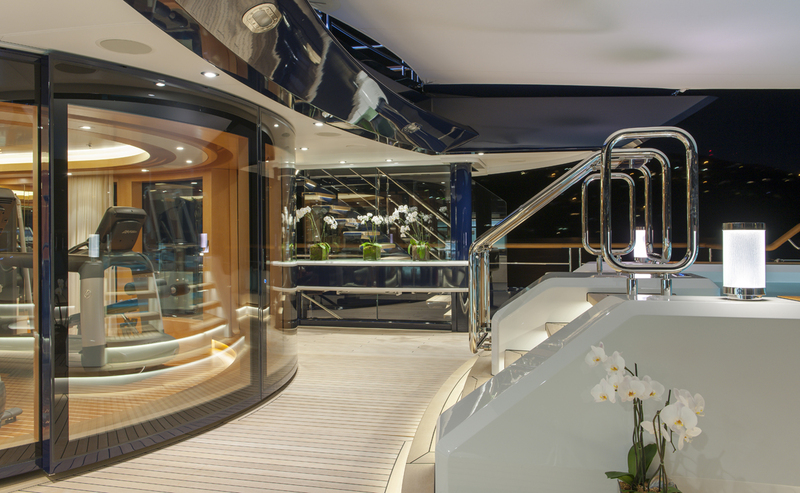 She also has a large individualised owners' deck and suite. 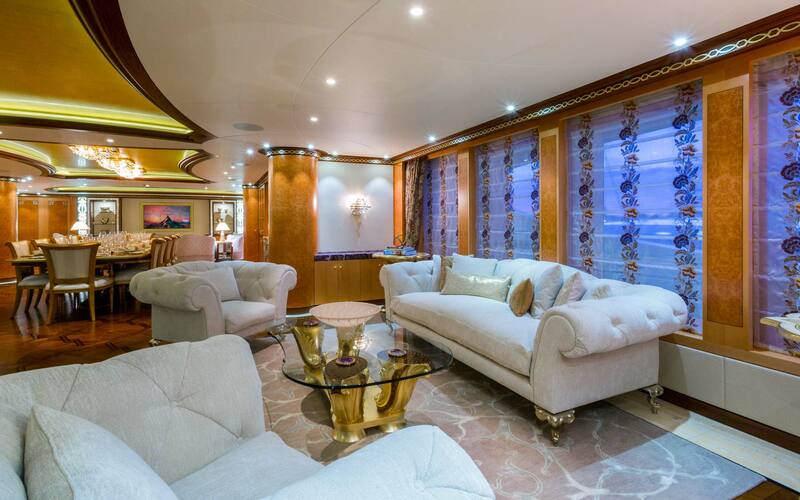 She can easily accommodate a large gathering of guests for entertainment and parties as well as sleeping overnight in ensuite cabins in style and comfort. 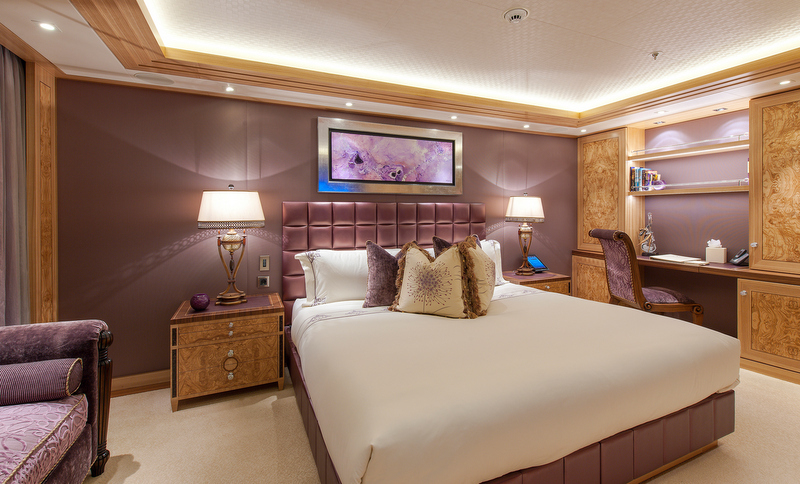 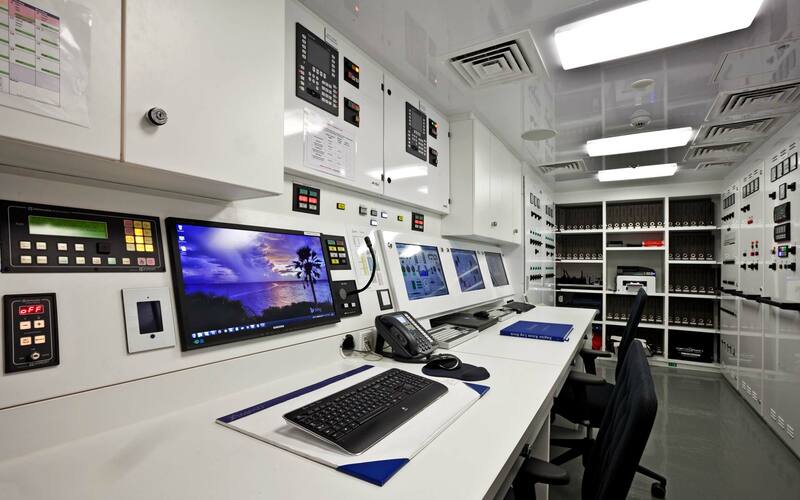 The vessel's numerous crew of 29 sleep in 15 crew cabins. 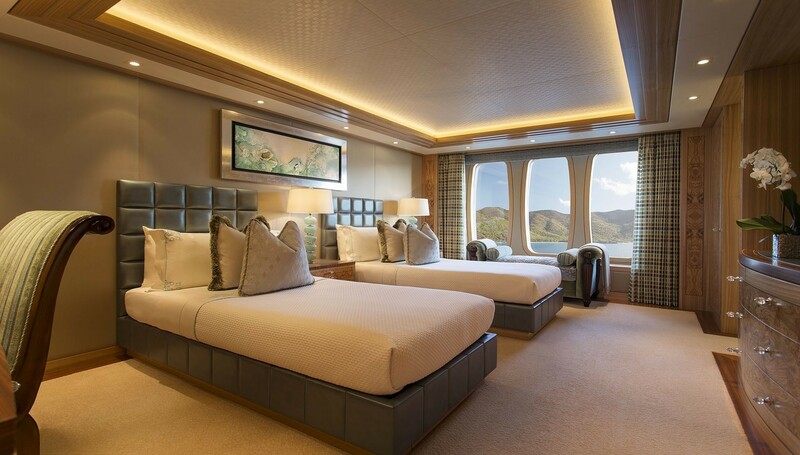 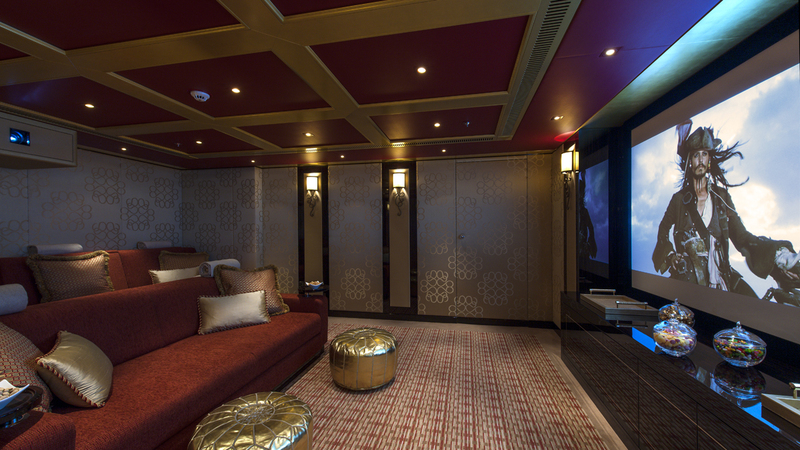 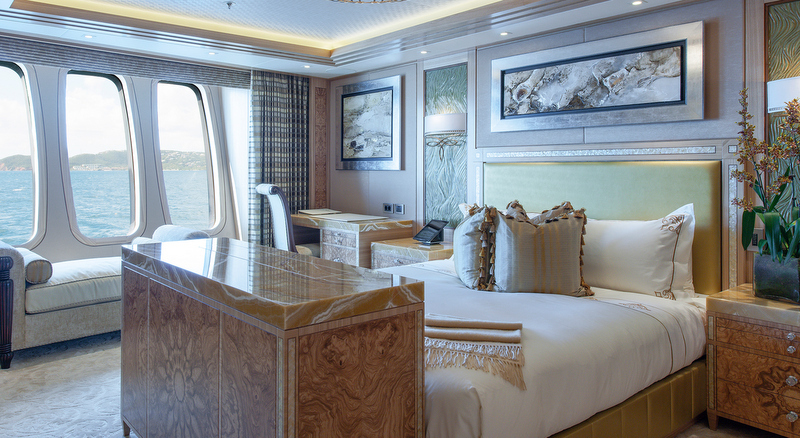 All guest cabins are situated on the main deck, all boasting traditional design with a clean backdrop in the lines of the design but the wood veneers, used throughout, give them a classical twist. 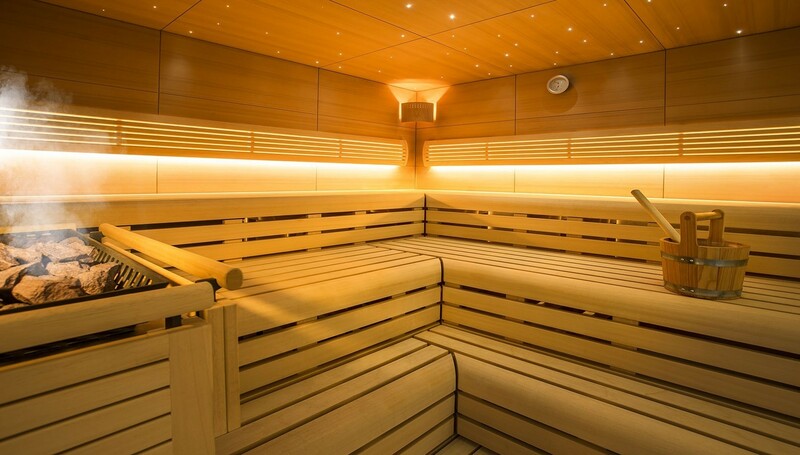 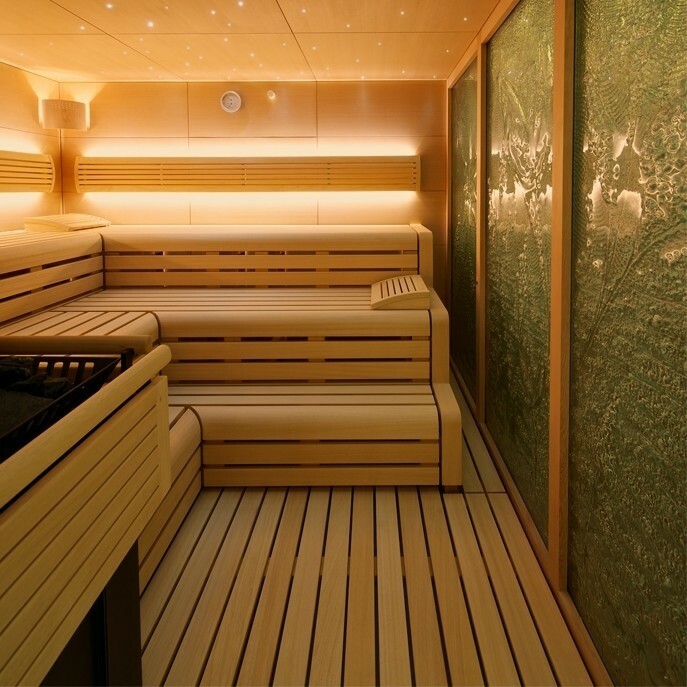 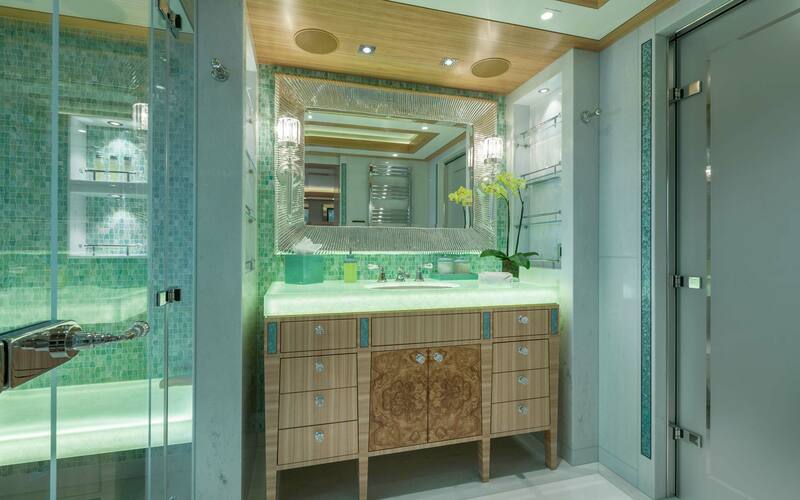 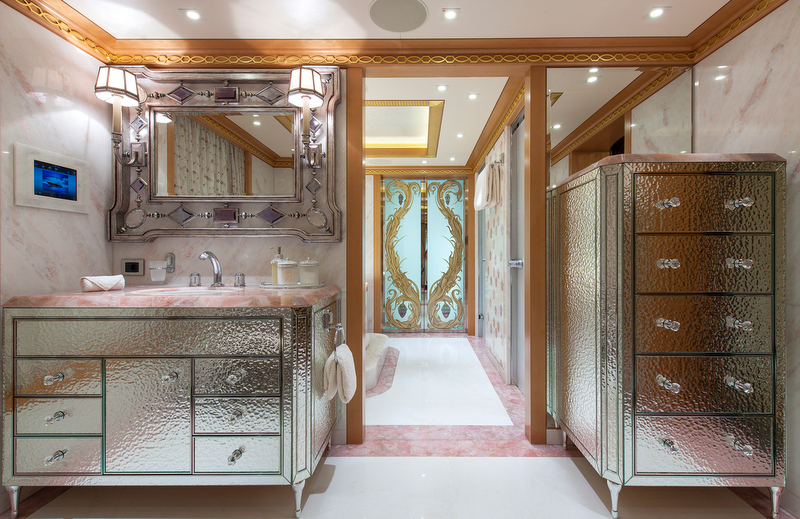 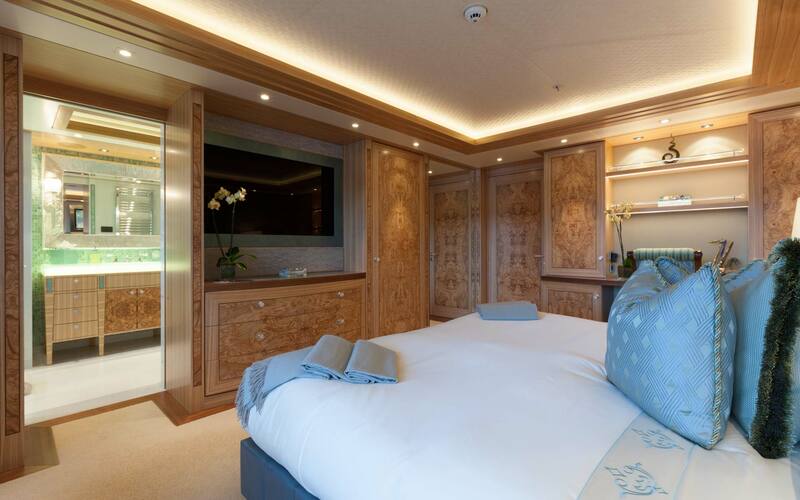 Each cabin has been designed the same with beautiful mother of pearl inlays in the pertaining colourway. 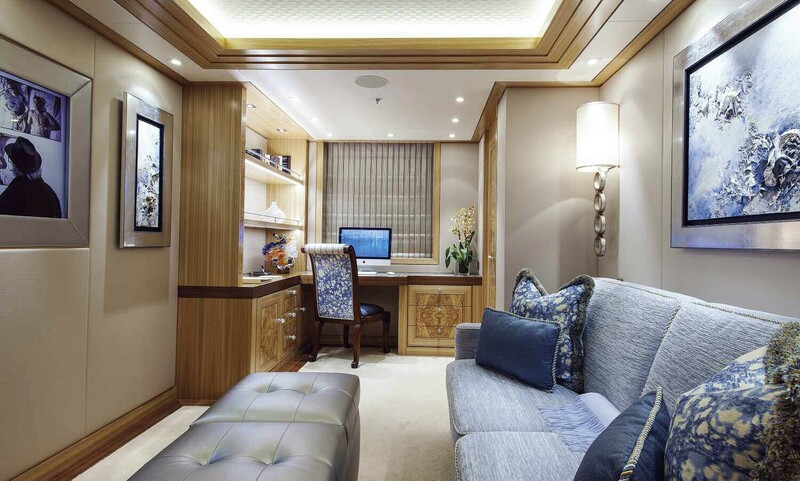 The guest companionway is very unique, as it was designed to enjoy without the need to call the crew if they would like a late night drink or a snack. 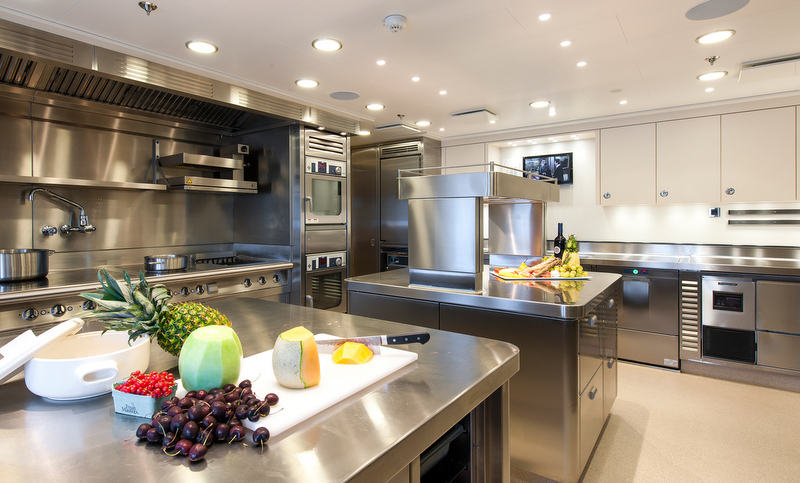 There are four drawer refrigerators, an ice maker and storage area for the guests to help themselves. 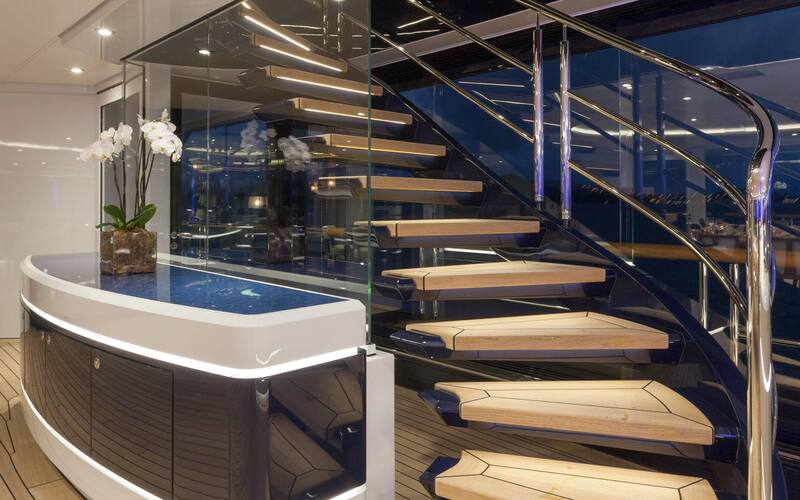 There is also a Nespresso machine and a kettle. 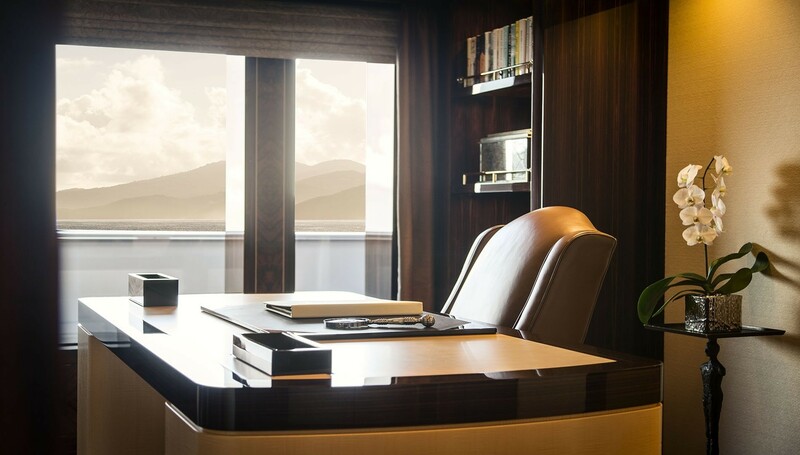 This area also features a guest office, which can be converted into a cabin when needed. 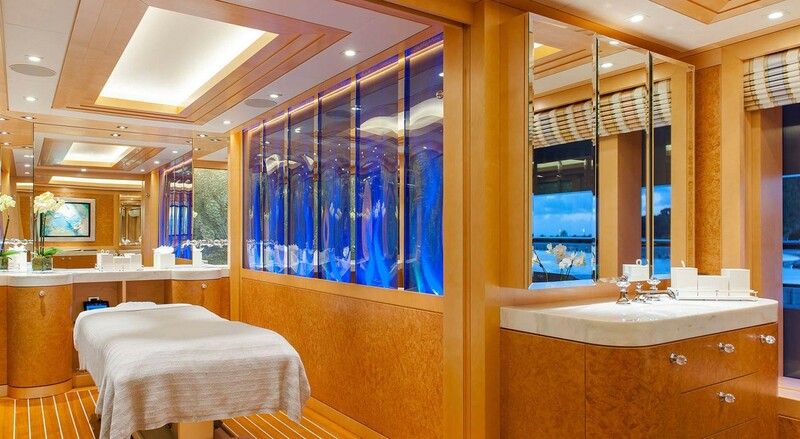 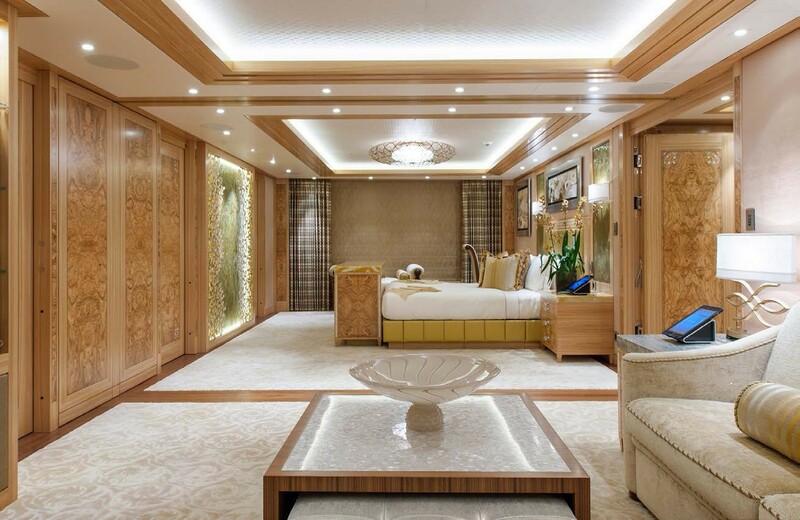 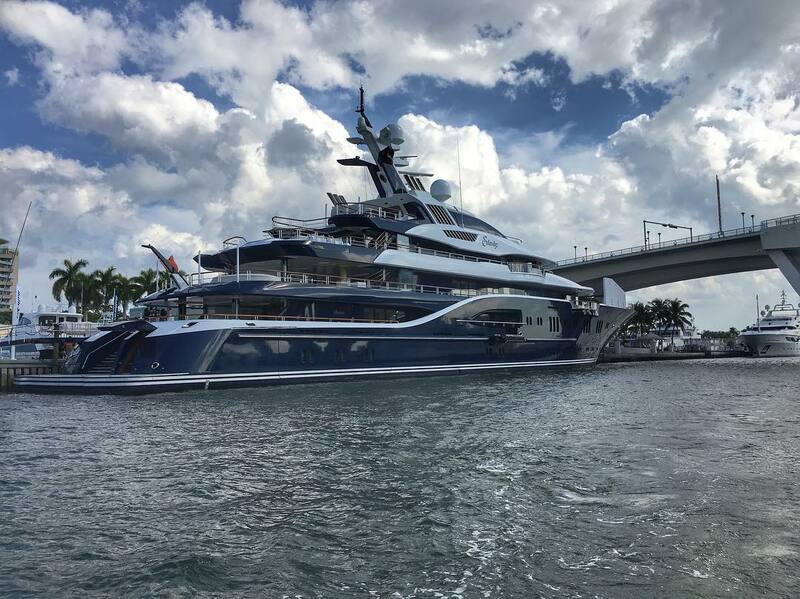 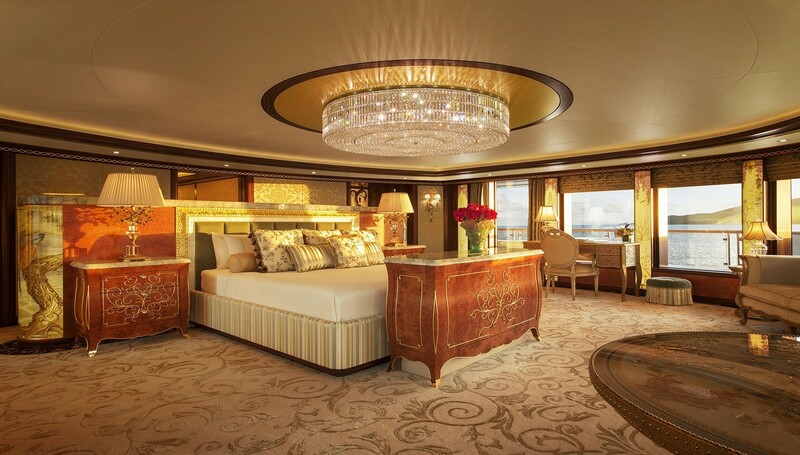 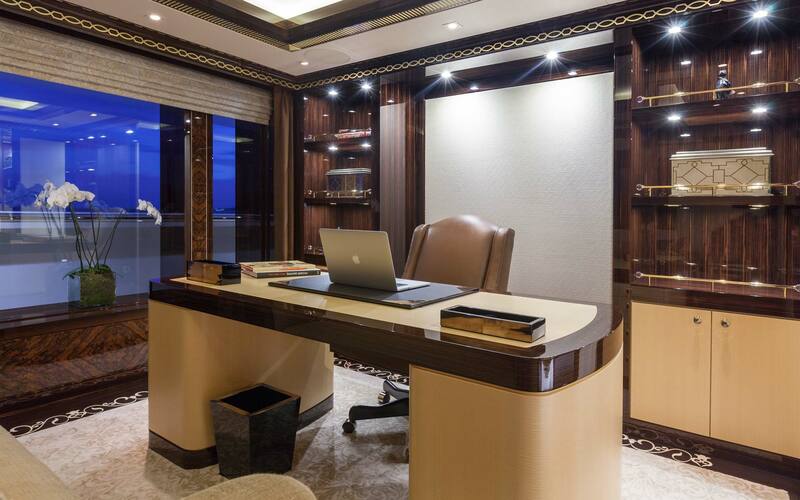 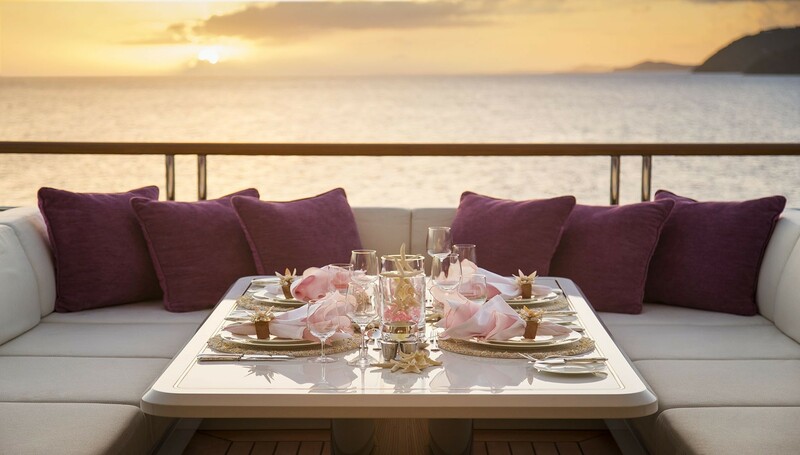 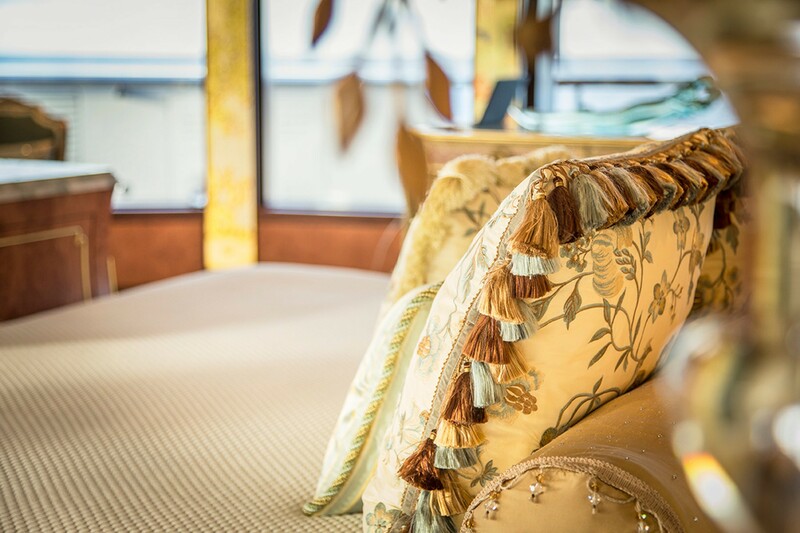 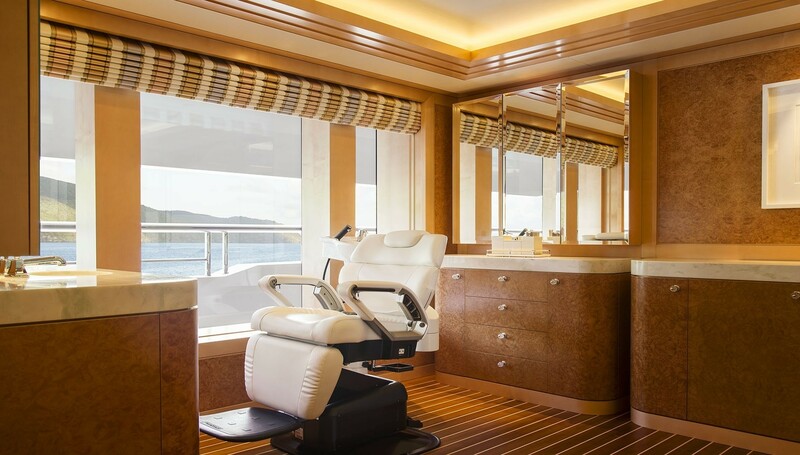 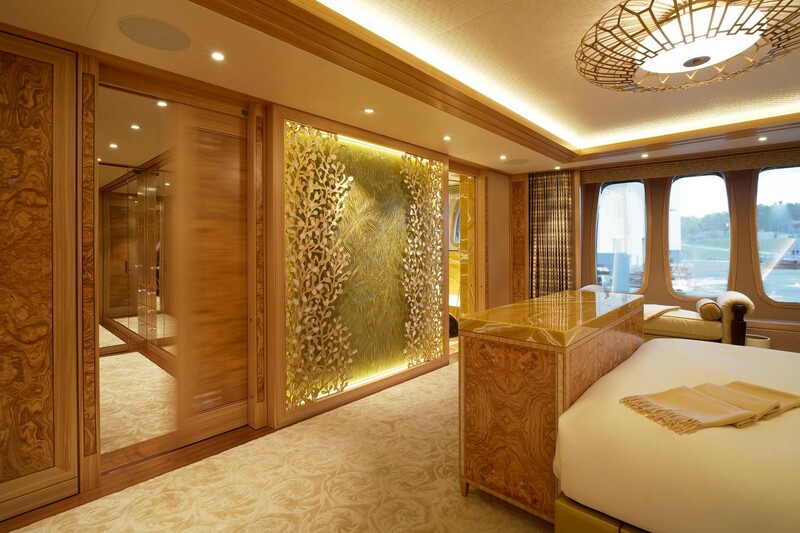 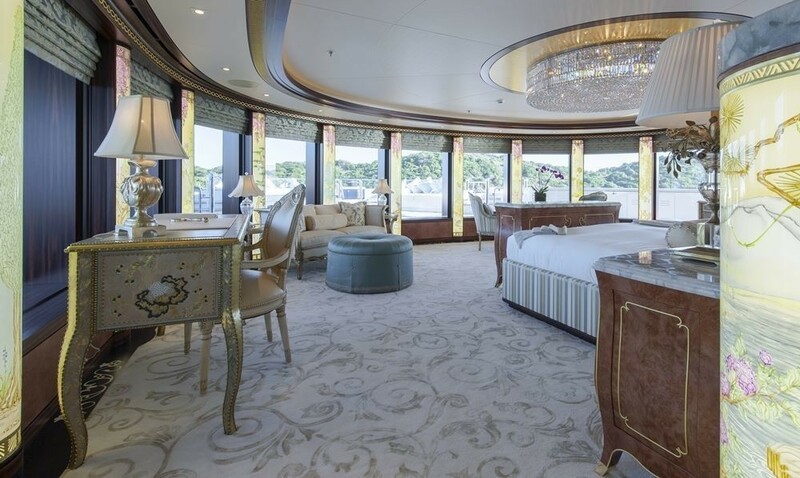 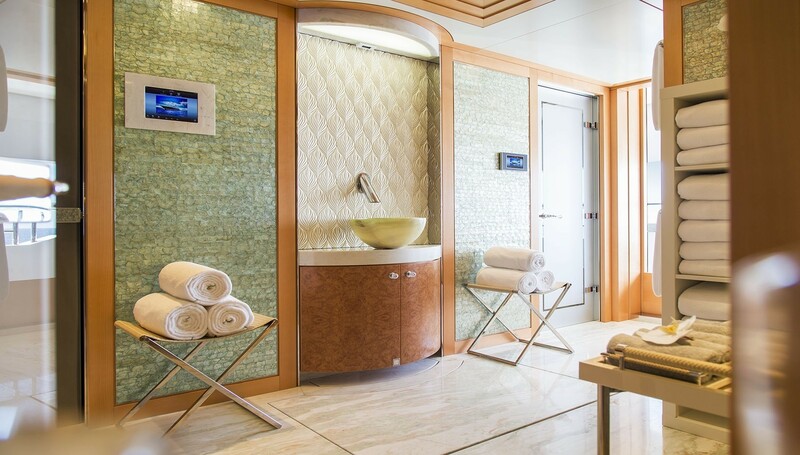 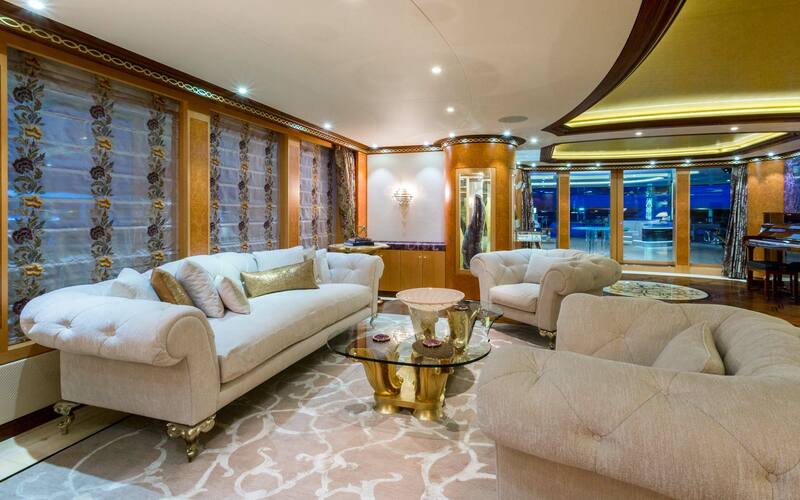 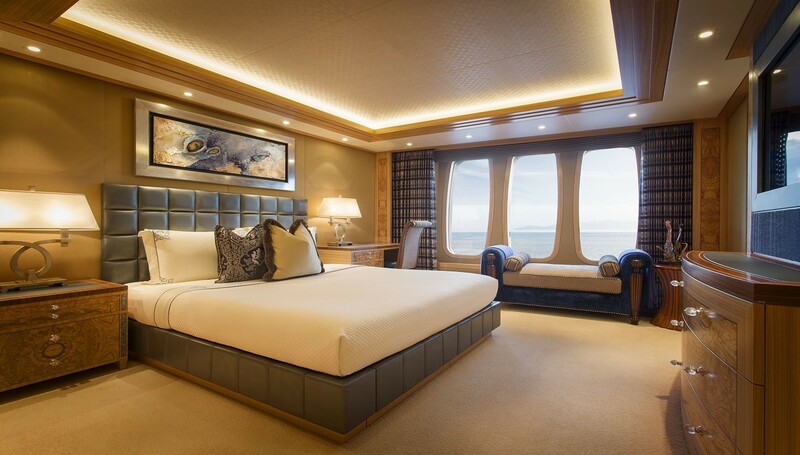 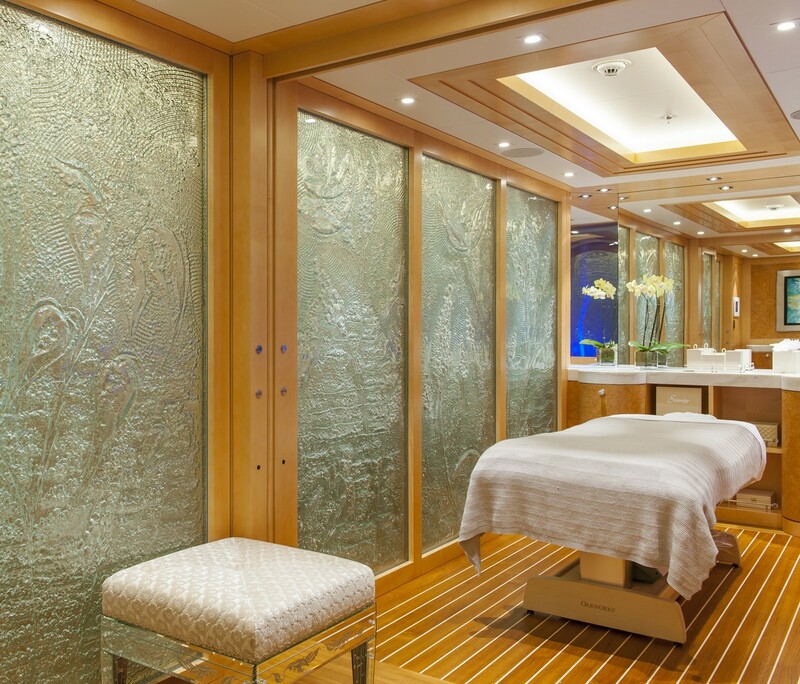 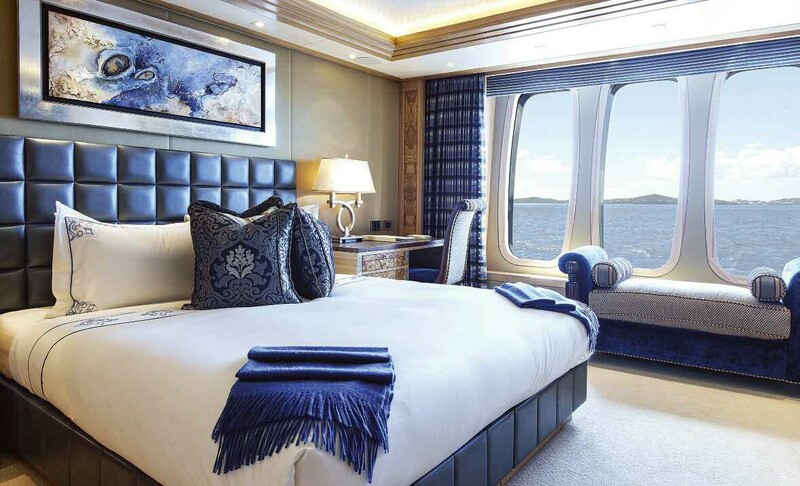 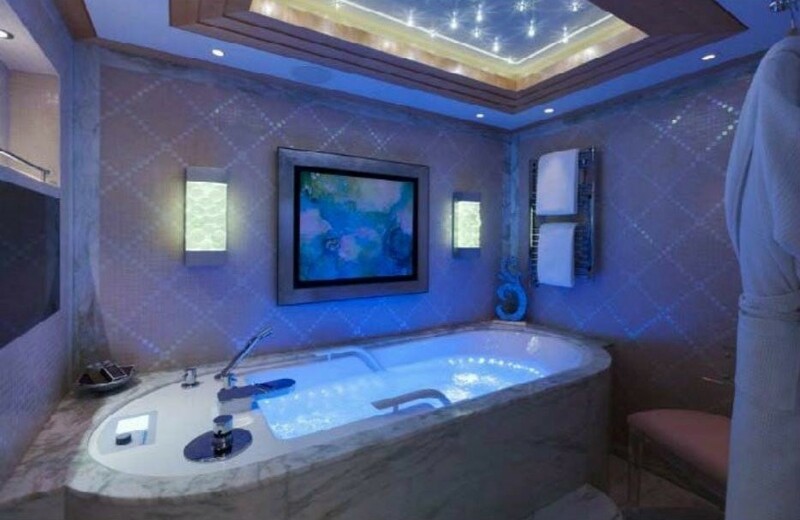 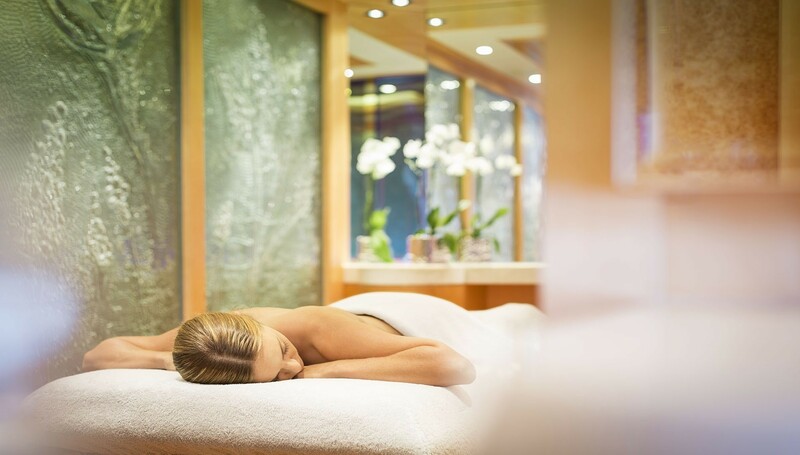 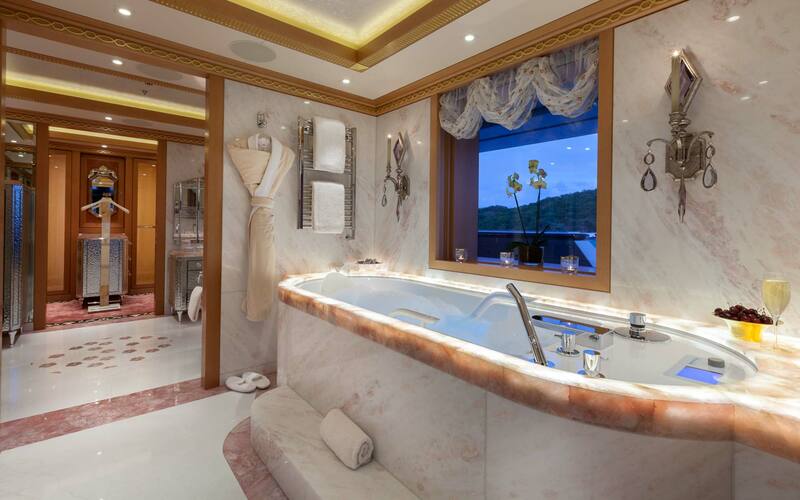 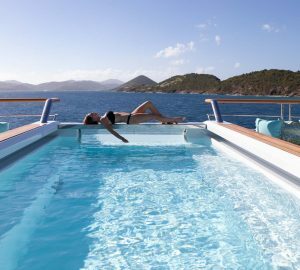 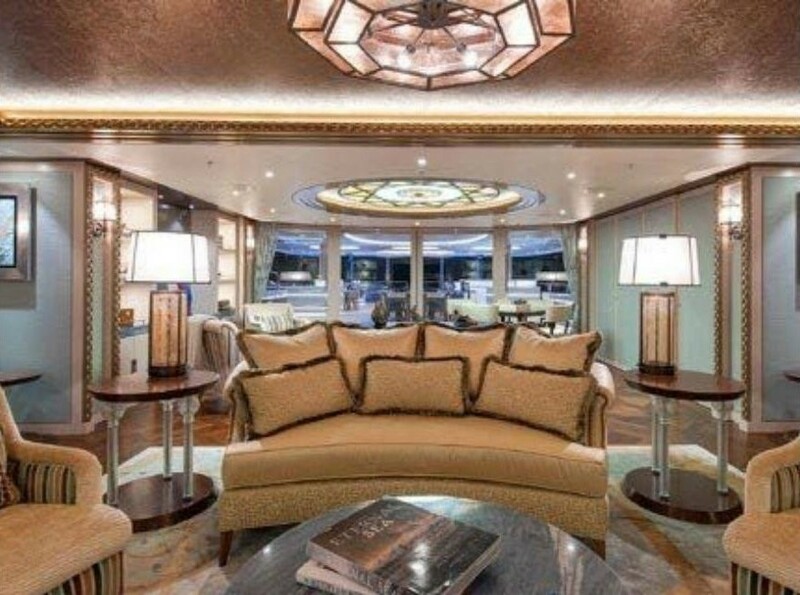 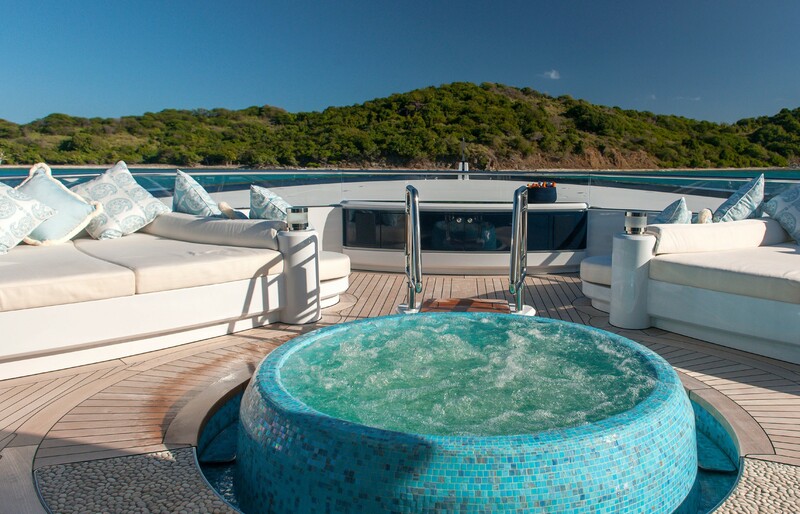 The Owner’s deck boasts the Owner’s Suite, which includes a private office, his dressing room and bathroom, her dressing room and bathroom and the stateroom which overlooks the bow of the boat and has its own private Spa Pool. 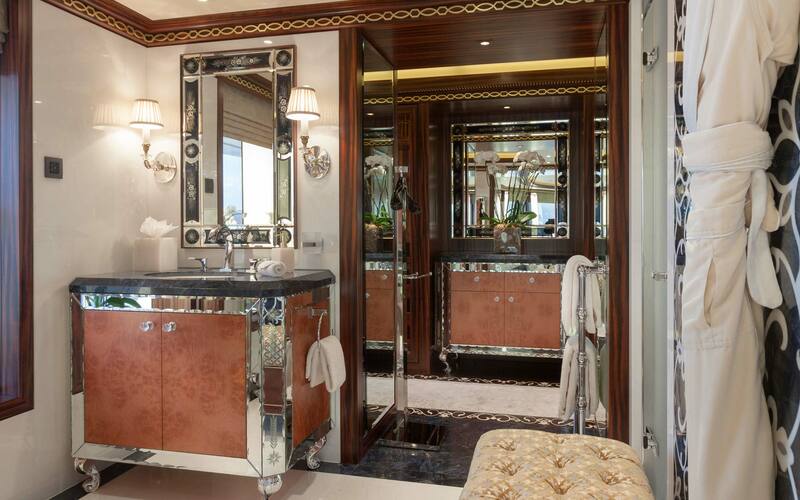 The Owner’s suite is characterised by distinctive handmade Italian furnishings, including a private dining area, a desk area for her with a leather-inlaid top and a custom chest of drawers. 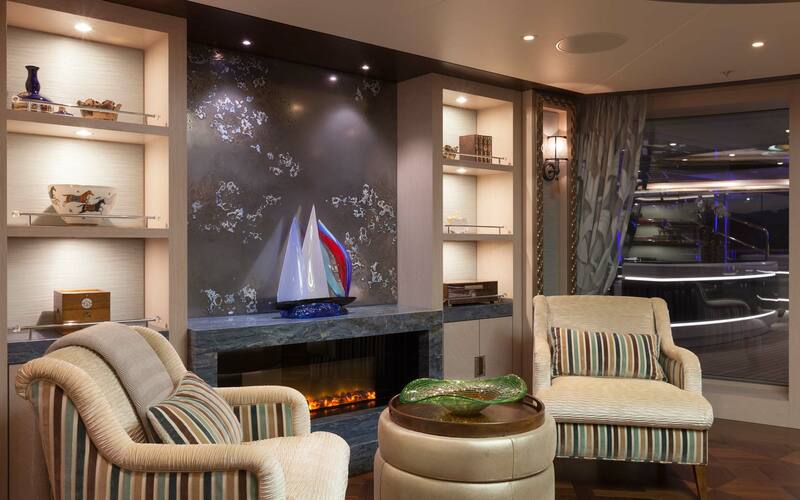 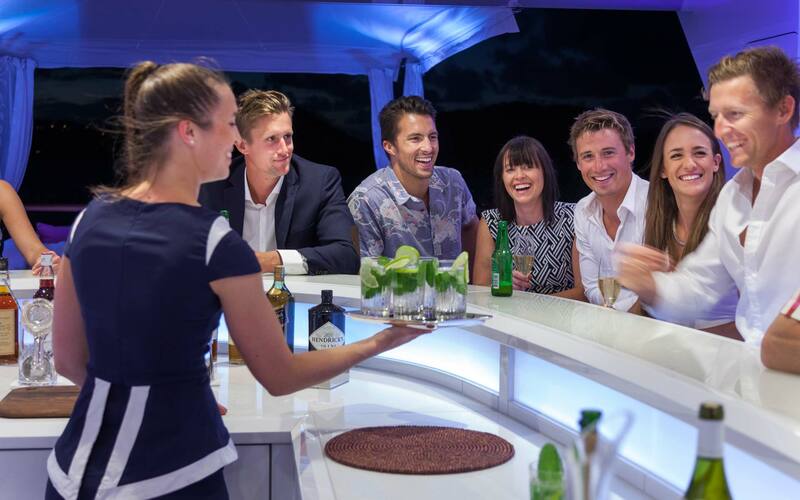 The owners’ lounge is more relaxed and casual than the main saloon. 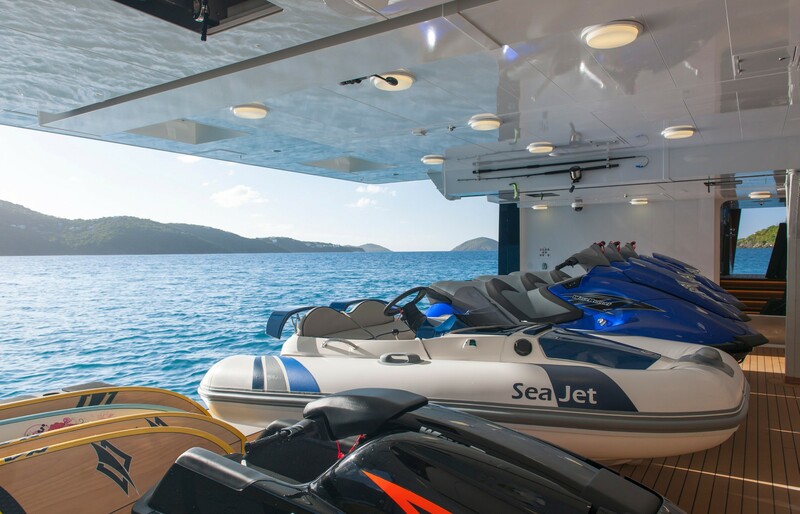 SOLANDGE has a wide range of water toys and sports equipment on board, including a number of tenders.